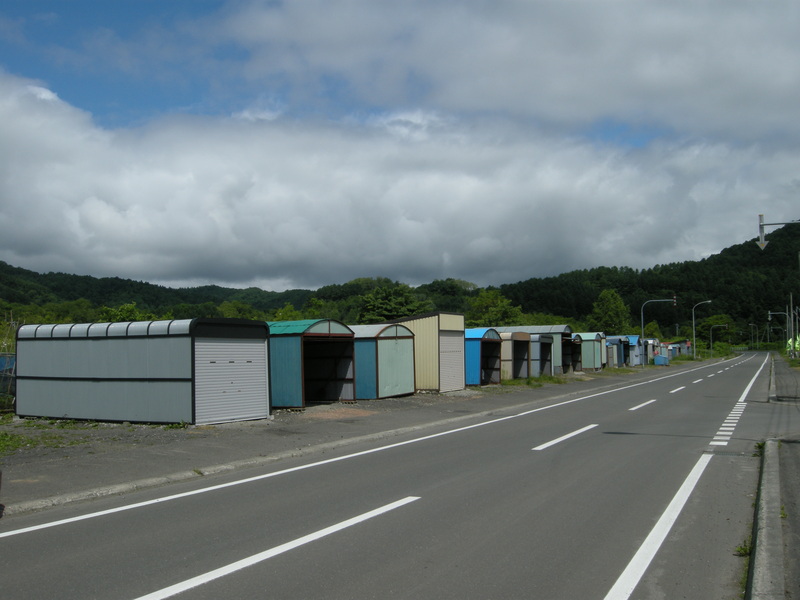 Oh, Yubari: the big one. Almost a decade ago, a friend asked me where in Japan I most wanted to visit. Yubari, I answered, without hesitation. Why had it taken nearly a decade to get there? Deaths, distractions, little vacation time, much of which had to be spent in the UK, and a preternatural laziness, I suppose. Why had I wanted to go so much? 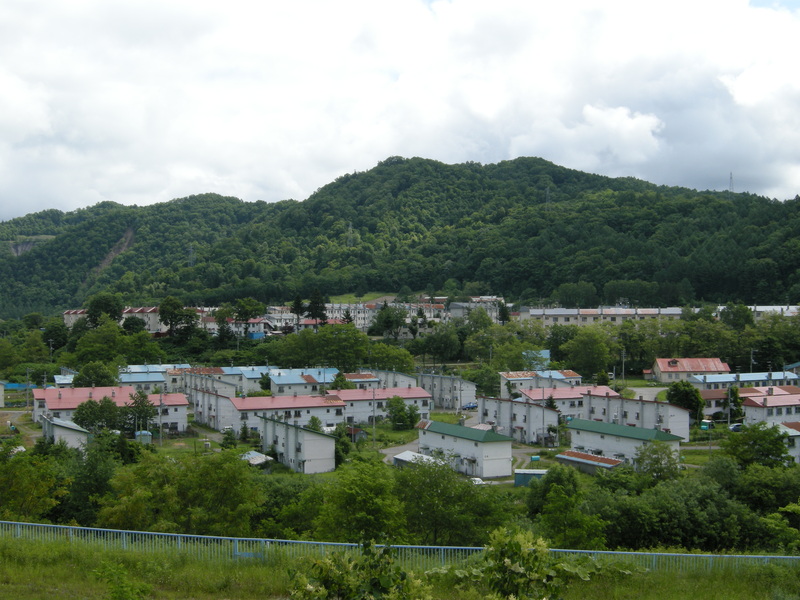 It’s always been about the unparalleled enormity of what Yubari has been through in the last half-century, as it lost almost all its coal mines in a single generation, from 1965 to 1990, and a staggering 90% of its population in two generations, 1960 to the present. The poster children for the industrial decline of the US, places like Youngstown, Ohio, Gary, Indiana, even the baddest of them all, Detroit—none come close to the experience of Yubari, which has gone from being a vibrant if still gritty metropolis of around 120,000 people in 1960, replete with cinemas, dancehalls, and even a five-storey department store, to a mere shell of a city, a city in name only, its 11,500 people strung out across the hills and mountains in what now amount to no more than a straggle of villages. 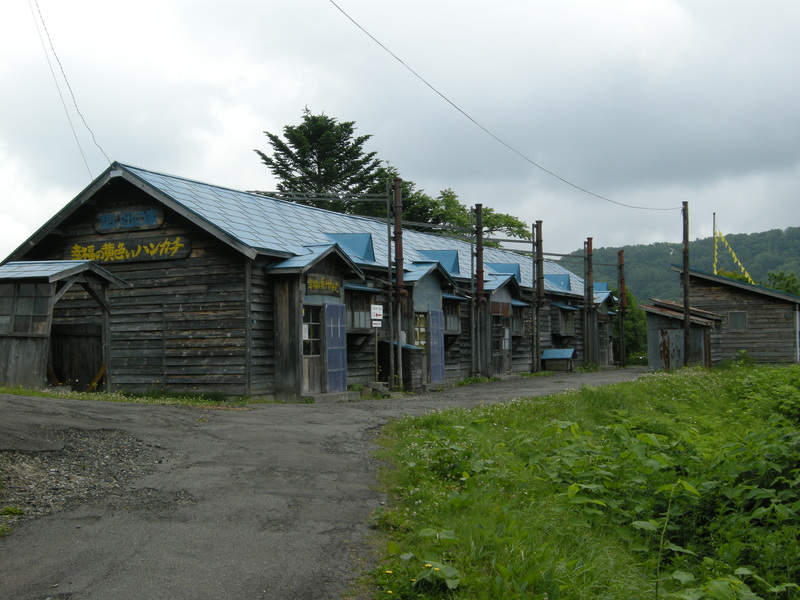 Stripped to its barest of bones, the story of Yubari is sublimely simple: it had coal—Japan was the world’s third largest coalmining nation in the 1930s—then it had none, or at least none that was deemed commercially exploitable. It had people, then it had very, very many fewer. 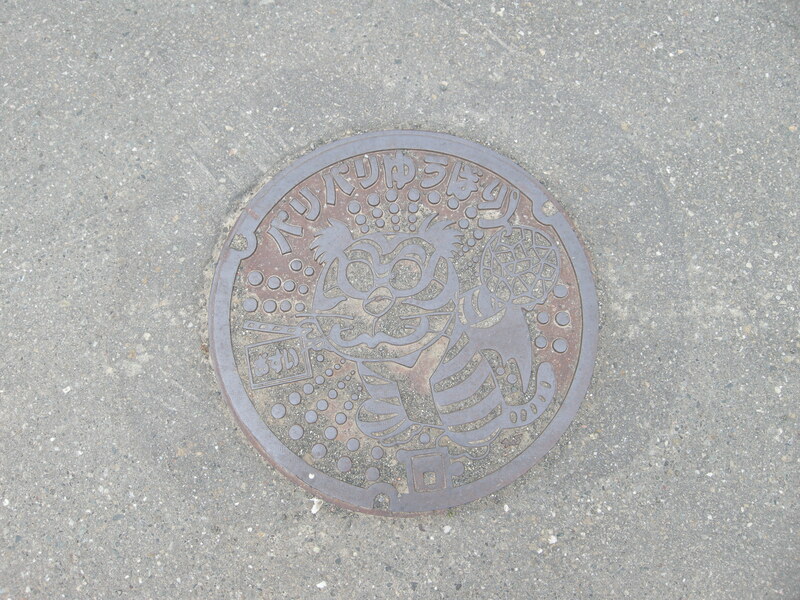 The story was repeated across the coalmining districts of the Sorachi subprefecture. Here are some population datapoints and projections for the five cities and one town that were at the heart of Hokkaido coalmining. 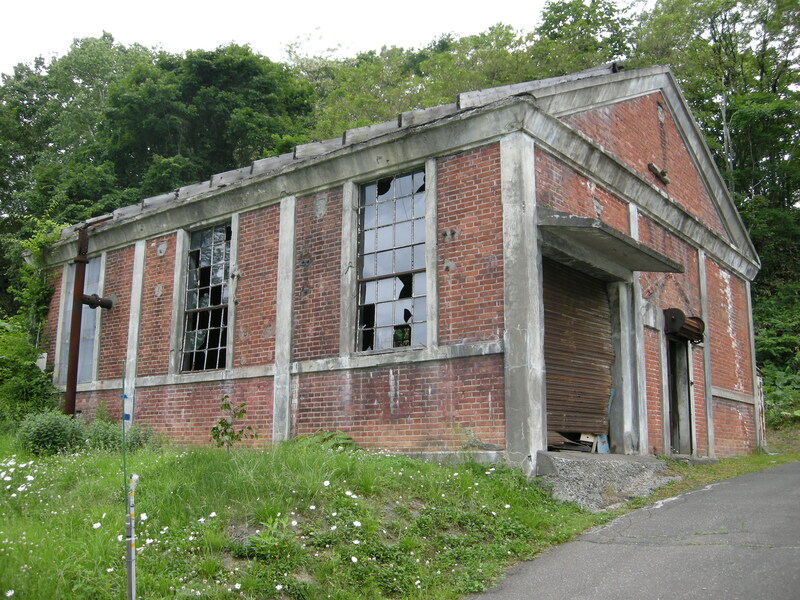 Yubari’s mines were largely owned by just two companies, the mighty Mitsubishi combine and its subsidiaries and Hokkaido Colliery & Steamship, more familiarly known as Hokutan, and the government showed no interest at any point in nationalization, even to prolong the working lives of marginally viable mines. The industry’s fortunes were dealt a further blow by a shift in state energy policy in the 1950s and 1960s away from coal and in favor of oil to fuel the nation’s power stations, which with hindsight looks ill-advised in light of the oil crises of the 1970s. For much of the era when the mines were closing, the social security net was threadbare, and as the mines went, so of necessity did the people. 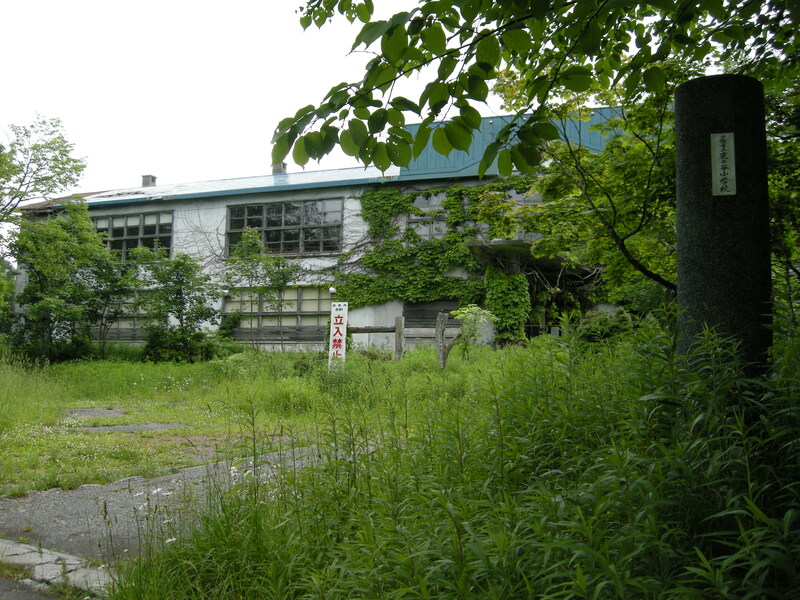 As Japan was gearing up for its last glorious spurt of growth in the 1980s, terrible things were happening in Yubari, which had already lost two-thirds of its people in just two decades. 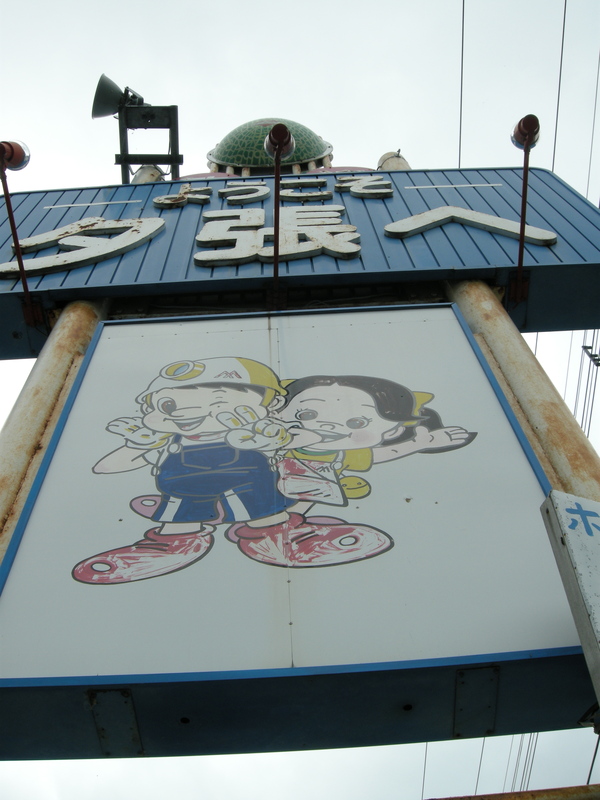 In October 1981, a methane gas explosion at the Hokutan New Mine, opened only in 1975, took the lives of 93 miners, in Yubari’s deadliest mining disaster since the 1930s. 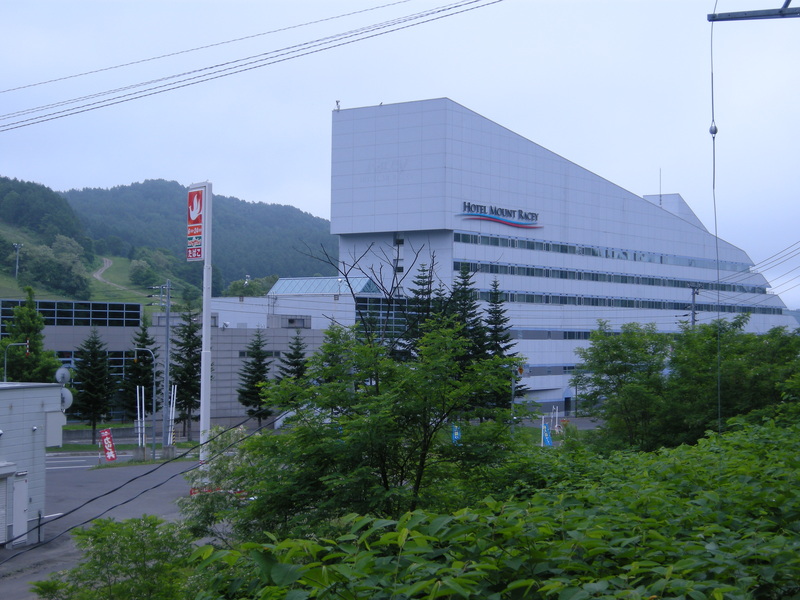 The Hokutan subsidiary that ran the mine went bankrupt just two months later (Hokutan itself finally went under in 1995) and the mine closed within a year. In 1985 another methane gas explosion, this time at the Mitsubishi Minami Oyubari Mine, claimed a further 62 lives. This was the mortal blow to mining in Yubari, as the mine had only begun extracting coal in 1970 and was seen as Yubari’s last hope. Instead it closed in 1990, bringing down the final frayed and grubby curtain on a century of coalmining in the city. Battered and bruised beyond measure, Yubari tried to ride the—largely illusory—leisure boom of the 1980s, borrowing beyond its means to fund resort facilities where the mines had once stood, but in the chiller economic climes of the 1990s, the tourists stayed away and its fortunes ebbed further, culminating in bankruptcy in 2006, about which I have written extensively if indirectly here and here . 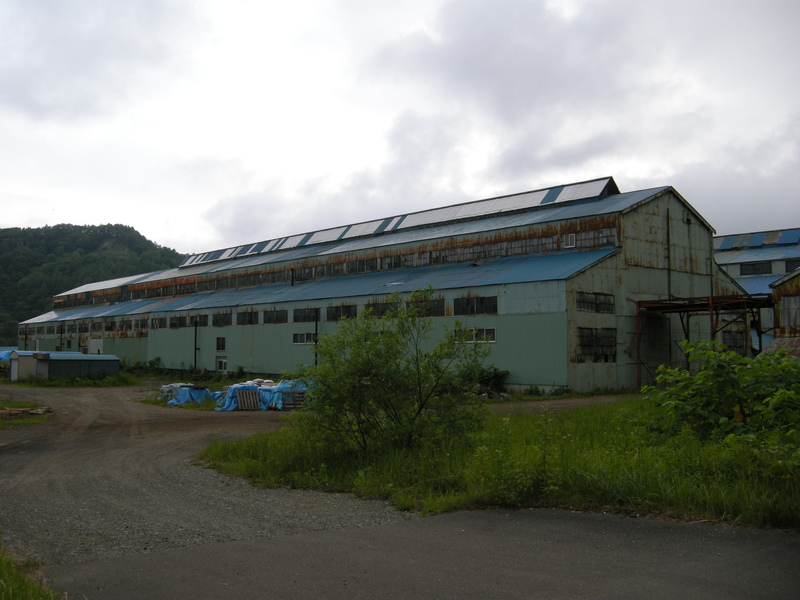 I have also translated the prologue of a book about Yubari, which conveys in great—perhaps overwhelming—detail how life became still more straitened under the asperities of the reconstruction program imposed following the bankruptcy. 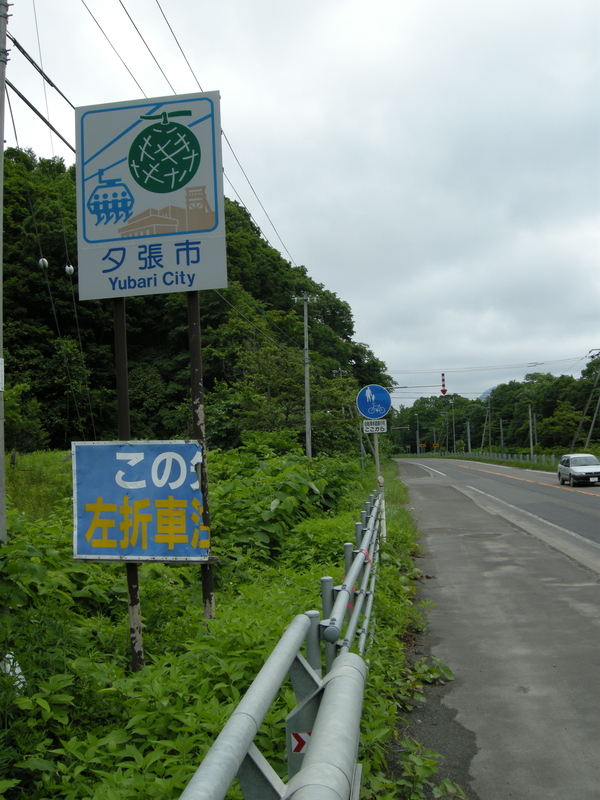 I stopped on the border of Yuni and Yubari to snap the city limits sign. Melon iconography is going to play a prominent part in this tale. The lower sign, warning of a curve ahead, has been sheared off and left unrepaired. There’s no money left in the kitty for signage. A little further on, a rusting welcome sign outside the first of the gift concessions that dot Rte 274, which runs west to east across the south of the city. The melon industry has spawned a host of melon-flavored snack and candy derivatives such as melon steamed buns, melon jellies, melon ice-cream, and melon biscuit sticks, to name but a few. There is something undeniably comical about a city that has been through so much finding some kind of salvation in melons. 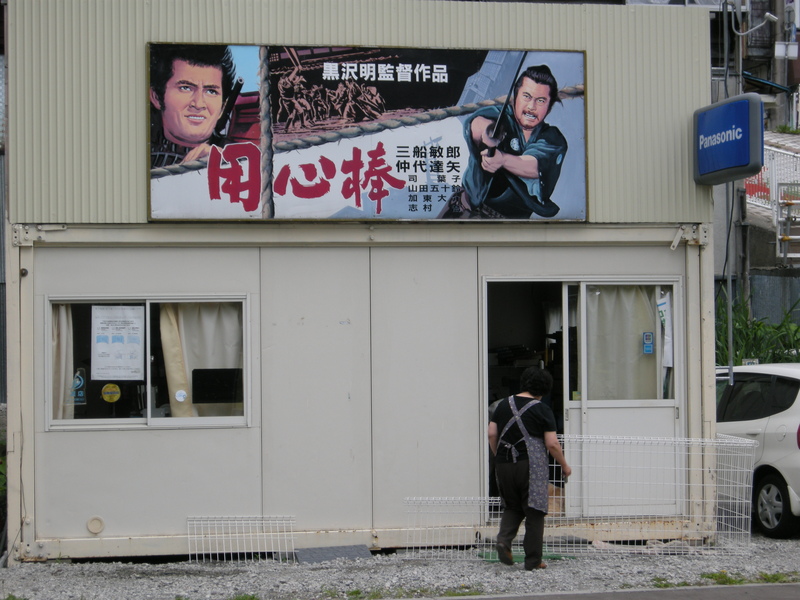 “Ah, both of Yubari’s children are welcoming me”, I thought cynically as I gazed up at the sign. The boy, I was later to learn, is known as Yu-chan and is one of the city’s mascots, although he has fallen out of favor recently. The girl’s name I never caught. 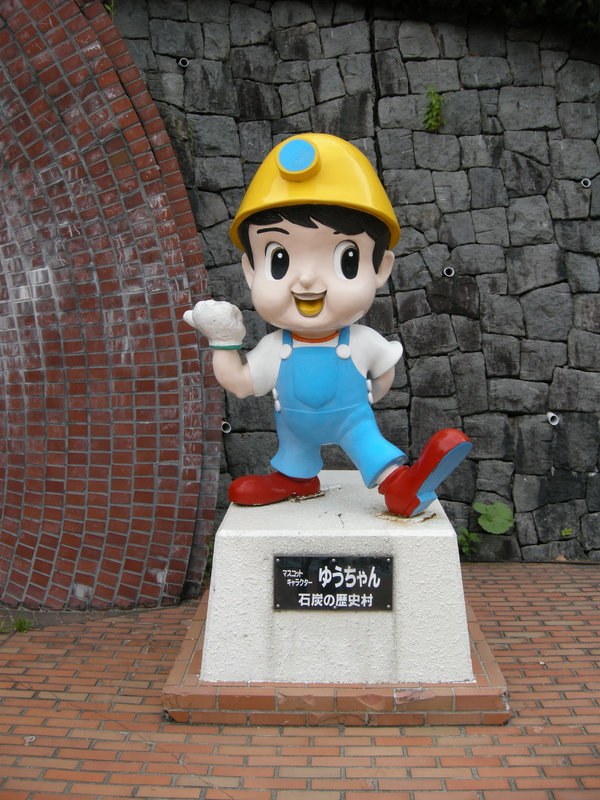 Japan of course has a massive talent for cuteification: if you can cuteify coalmining, you can cuteify anything. On the right side of the road was the Takinoue hydroelectric power station, built in 1925 by Hokutan for its own power needs. Groundbreaking in its day, it is still going strong and it made a comforting sight to these brick-starved eyes. 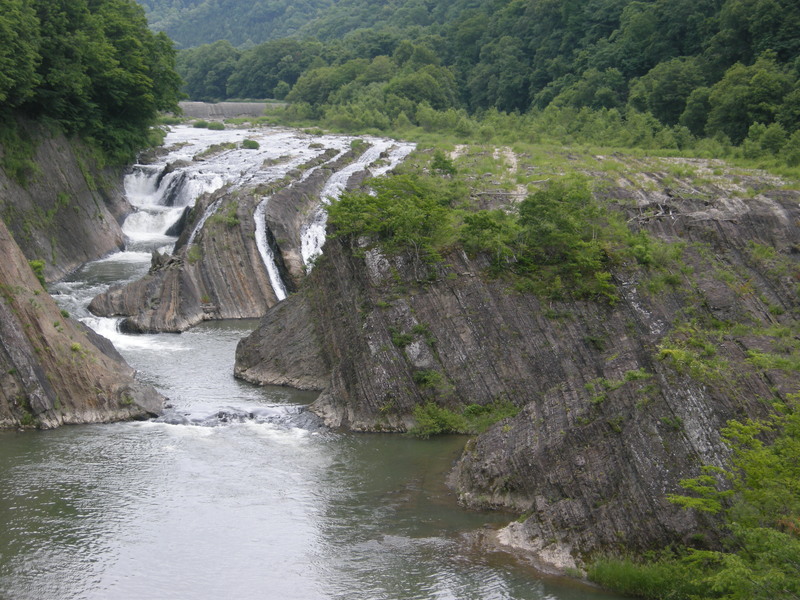 The power station abutted the Takinoue Nature Park, with several viewing platforms out over the Yubari river, its countless waterfalls, and tortured strata. 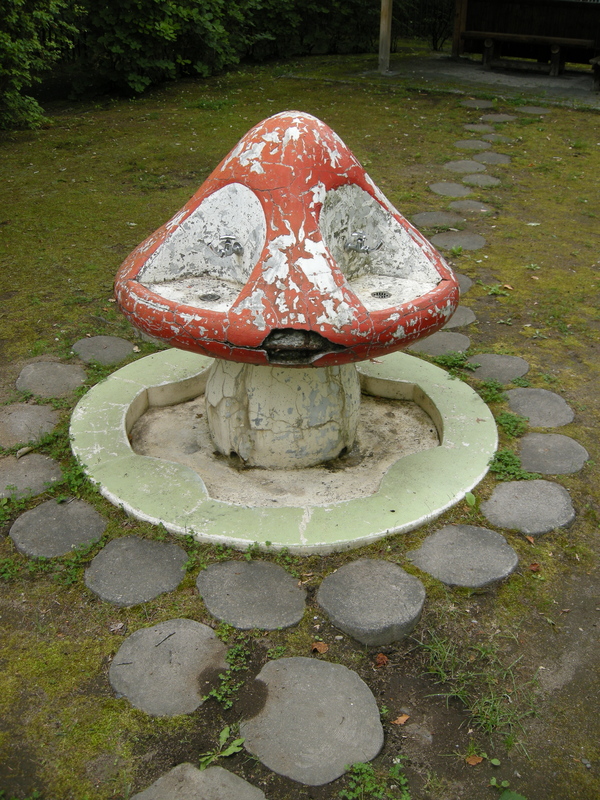 The crumbling mushroom and its cracked smile were evidence enough that the park had been starved of funds for many years. 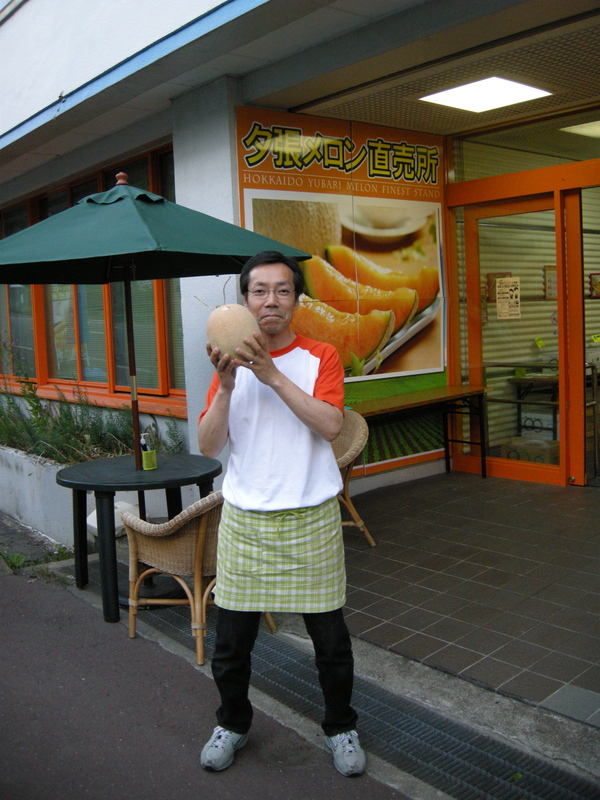 Many of the melon farmers, who are confined to the southern plains of Yubari, were clearly doing just fine. Everyone else? Not so well. 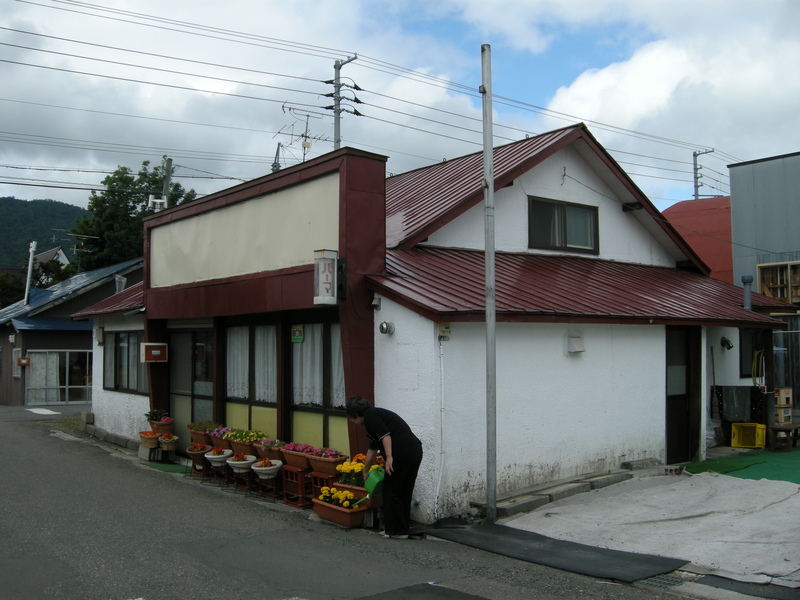 I stopped by for lunch at a roadside restaurant called Maple Town in Shin Yubari. Yubari is also celebrated for the beauty of its autumn foliage, and its maples in particular, at least among its residents. On the door was this poster. “Great fool is the copywriter”, I thought at first. 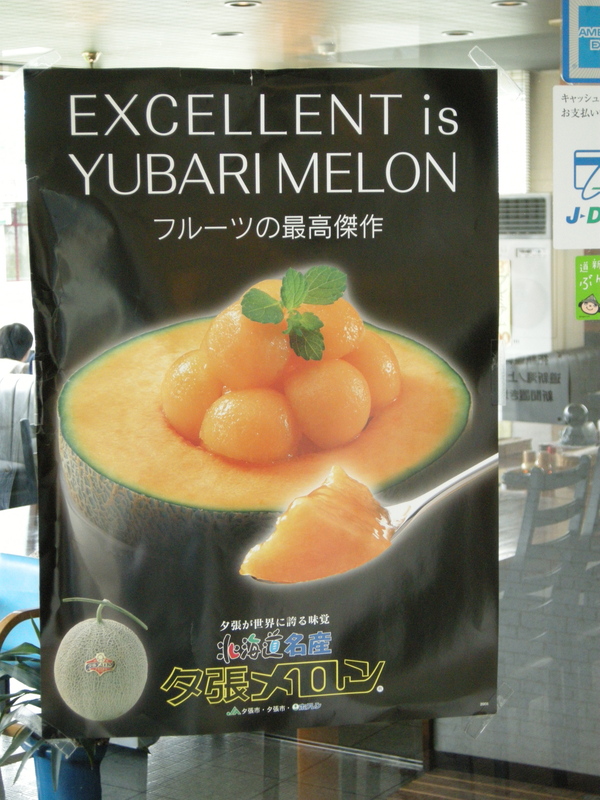 “Meditate on this, I will”, I promised myself, and later it struck me as a stroke of genius on the part of the copywriter to hint that Yubari’s melons are adored even by Yoda, the greatest Jedi knight of all time, genius that sadly would have passed unnoticed by the patrons of Maple Town. The restaurant was deserted (well, it was 1.30pm). I took a seat and was approached by the only visible human presence, a slender, shambling twentysomething with blackened stumps for teeth; absolutely the worst display of dentistry and dental hygiene I have ever seen on a person in their 20s in the developed world—and I’m from Britain. He started trying to tell me in halting English of excruciating slowness what was on the laminated menu on the table. I no longer take kindly to these English interventions by the empathetically impaired. I cut him off. “I – can – read – Japanese” I interjected—in English—with equal slowness. Our dialogue was like a 45” rpm record suddenly slowed to 33”. Chastened, he stepped away. With some misgivings, I ordered the lamb chops—lamb is supposedly a specialty of Hokkaido, though by the end of the trip I couldn’t fathom why. Lamb is not a regular part of the Japanese diet—my local supermarket intermittently sells lamb chops of about the size of a thumb and forefinger put together in packs of three for about $8, but then my supermarket is in an upscale district of central Tokyo full of cheese eaters and other freaks of nature, and the lamb comes from the Antipodes. I saw nary a single sheep in my Hokkaido fortnight and came to realize that much of what is described as lamb is actually mutton dressed as, shipped in frozen from Australia and New Zealand and as unappetizing as another provincial Japanese specialty, raw horsemeat, much of which these days comes from horses only a notch above a glue factory destiny on refrigerator ships from Argentina. The lamb chops arrived and I had to do something very contemporarily Japanese, for the first and possibly last time—whip out the camera and take a surreptitious photo of the meal. So much was extraordinary, starting with the fat slices of barely cooked onion atop the “lamb”. Then there was the industrial Thousand Island dressing slavered on the poor defenseless lettuce. Who invented Thousand Island dressing, and why? Are they rotting in hell for their misdeed? Off to the right, in the mustard-colored cup, was a putrid brew of a soup that tasted like diluted Bovril mixed with paraffin. The culinary clock really had stopped in 1975. 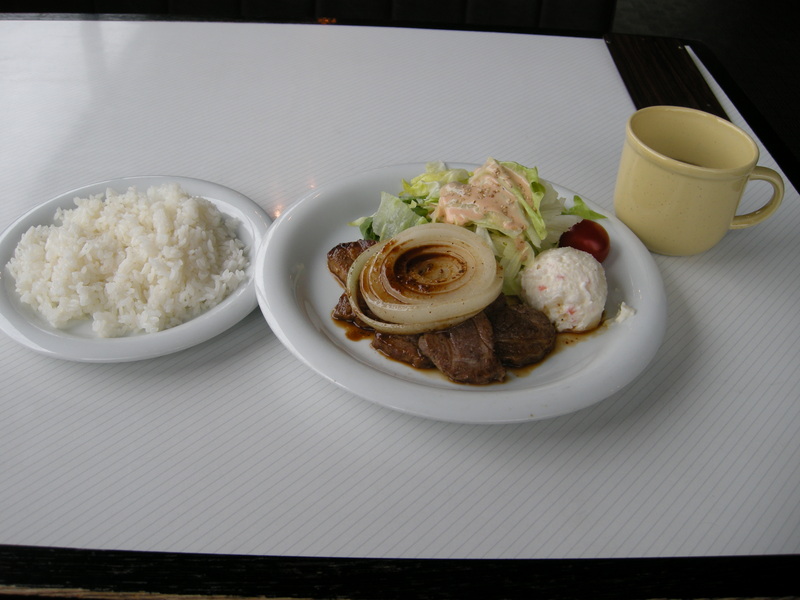 Although the mutton was as appetizing as cardboard, the onions were not as repulsive and pungent as they threatened, and the rice was, well, rice. I took the fateful turn left off Rte 276 into Yubari proper. 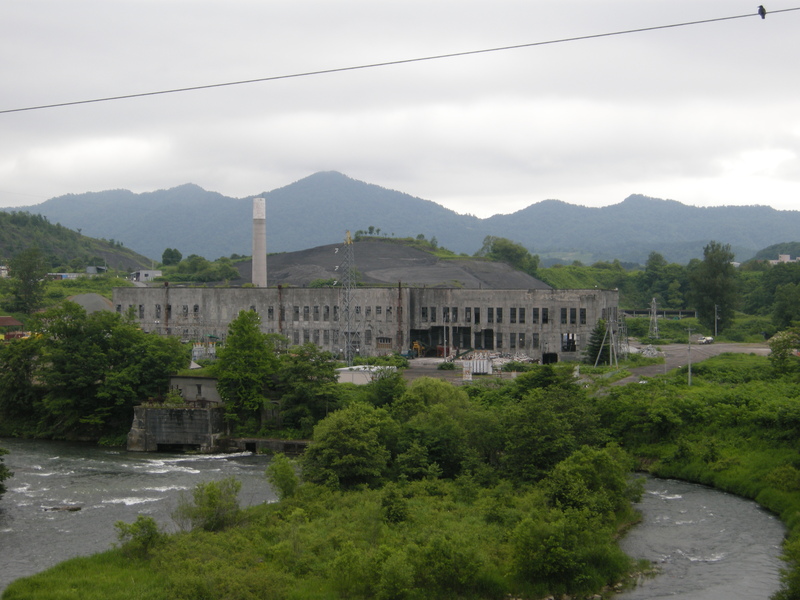 My first port of call was a favorite of the chroniclers of Yubari, the Shimizusawa power plant, part coal-fired, part hydro, completed in 1926 and decommissioned in 1992. For many years it was the largest thermal power plant in Japan north of Tokyo. It’s steadily being dismantled, so this was a last chance to see. I headed up to the top end of the main valley in search of one of the two resort hotels. I enquired at the counter of Hotel Mount Racey, the ski hotel, how much a night might set me back. Y19,000! ($210, GBP125). You have to be kidding! In Yubari, in high summer? They kindly phoned up to the other resort hotel, Hotel Shuparo, who were prepared to put me up for a more modest Y8,000. Accommodation assured, I meandered back down the valley, following the tracks and the stations of the 16km Yubari line, one of only three true branch lines left on Hokkaido. 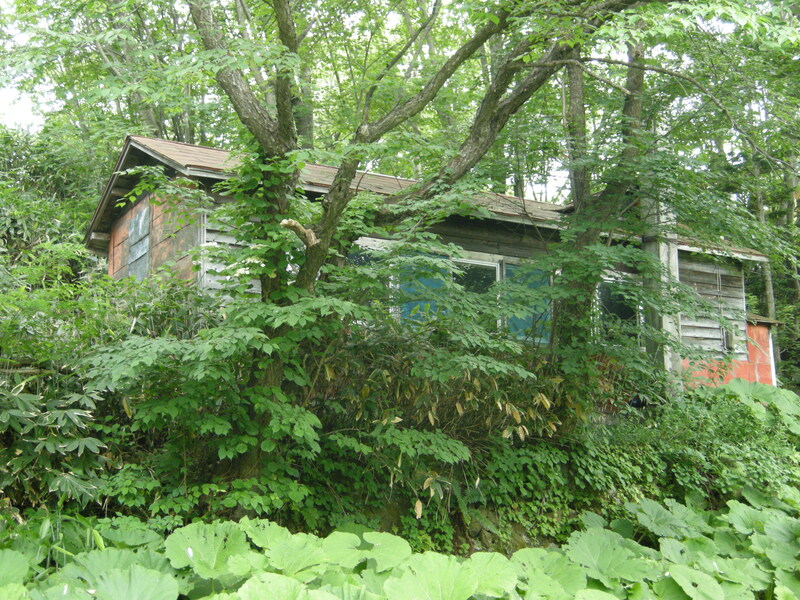 It must be at perennial risk of the axe and has in all likelihood only been spared as a favor to beleaguered Yubari. 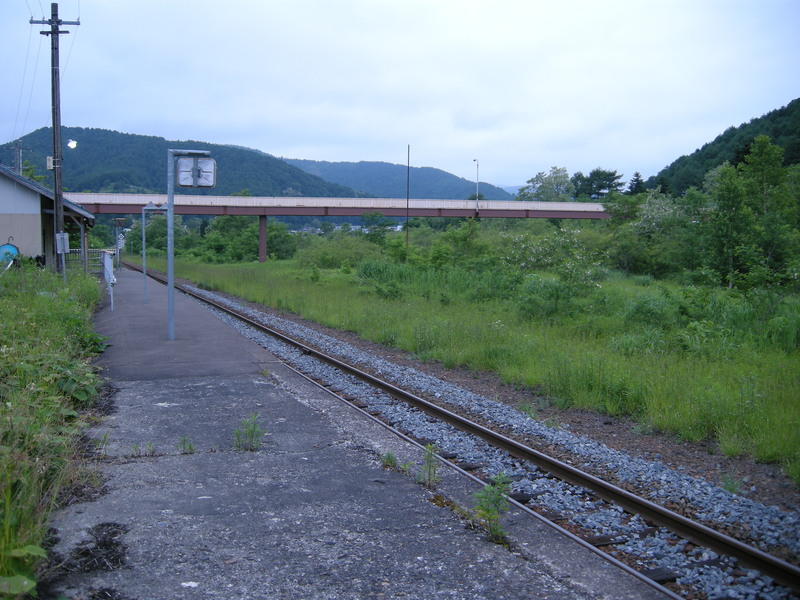 The terminus at Yubari, for example, averaged just 62 boarding passengers a day in FY3/99, and that number must be much lower a decade on. JR Hokkaido was considered too fragile to sell off during the 1980s privatization of the old Japan National Railways, and a glance at the income statement for FY3/09 explains why—the railroad operations made an operating loss of Y29bn on revenues of just Y82bn. 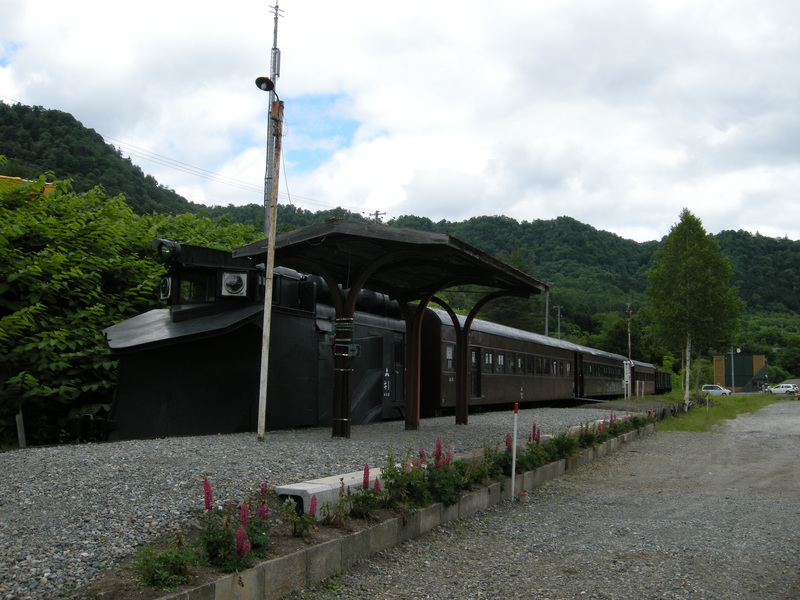 The first station down from Yubari was Shikanotani. I gasped in awe at the bridge, which once covered a vast network of sidings—old photos show at least eight tracks running parallel under it. 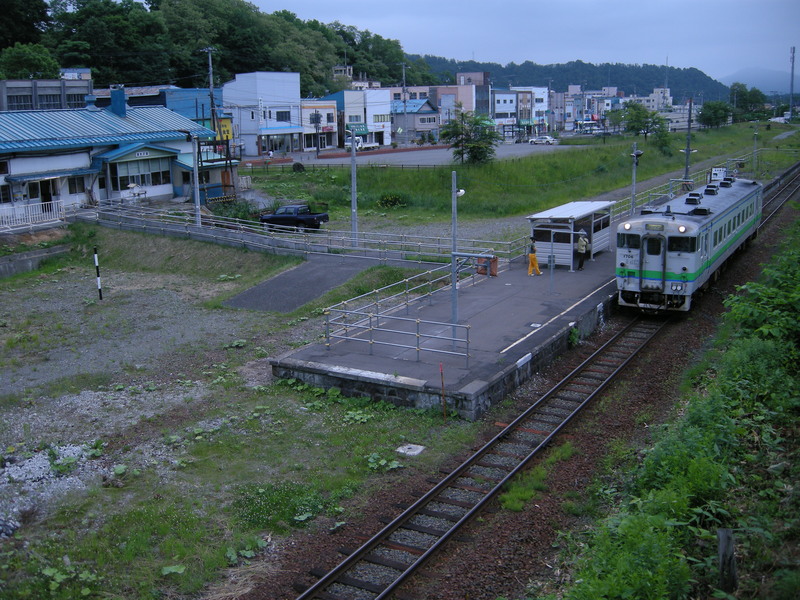 At the next station down, Shimizusawa, the sole surviving track runs far from the original station building on the left, so a pontoon has been built to link the platform and the station. 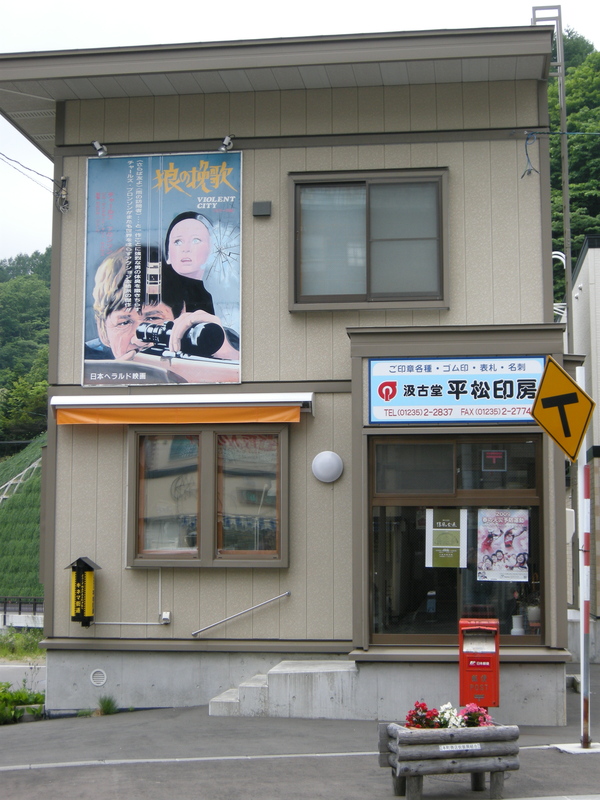 At the following station, Minami Shimizusawa, the old ticket office had been turned into a homely if cramped caretaker’s cottage, complete with kettle whistling on the ring, although there was noone around. The caretaker was presumably also responsible for this dog-eared but affecting lending library. 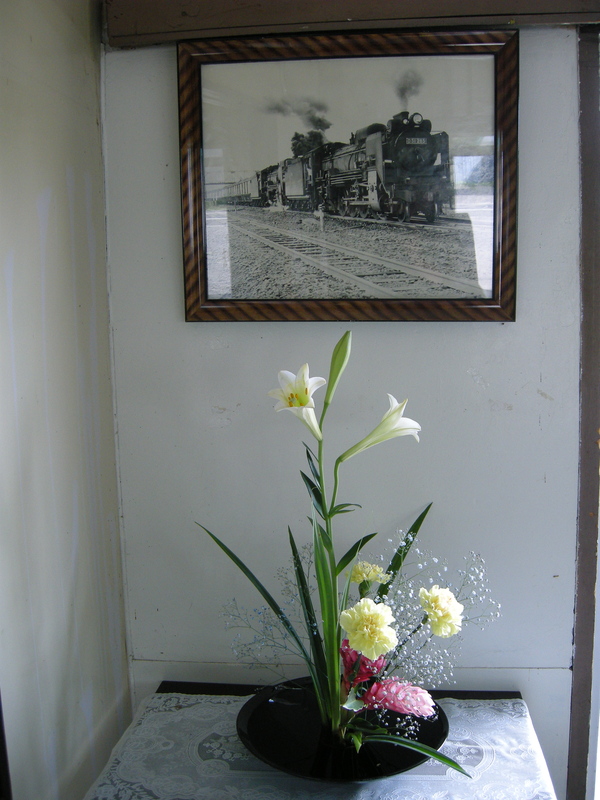 At the last station, Numanosawa, came a reminder of the glory days of double-header coal runs and a truly moving floral display, almost tear-inducing in its finesse. Yubari may be on the ropes, but it’s not yet out for the count. 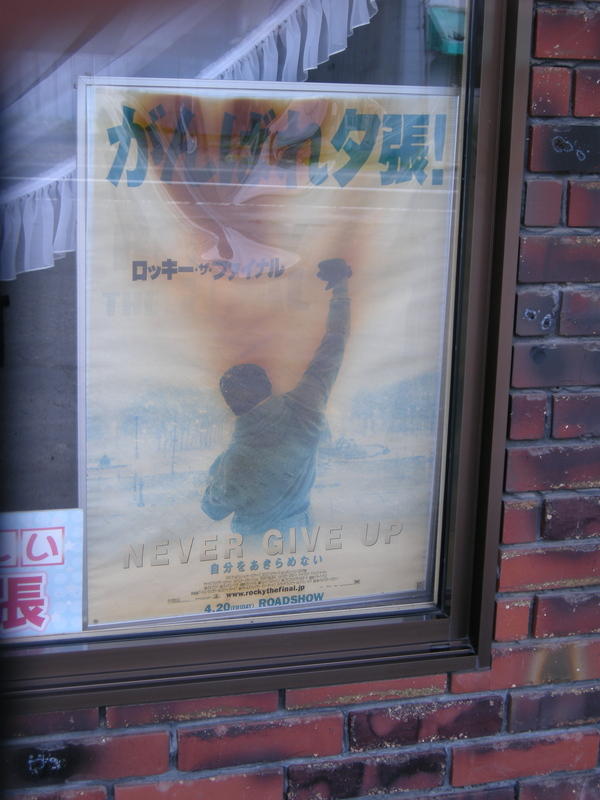 Boxing was the theme of this yellowing poster in the window of the forlorn restaurant adjoining Numanosawa station. It’s for the 2006/2007 release Rocky Balboa, renamed Rocky the Final for Japan. The exclamation at the top reads “Go for it Yubari!” Yubari as the ageing punch-drunk fighter aiming to stage one last comeback—how completely appropriate. As Rocky says in the movie, “It ain’t about how hard you hit; it’s about how hard you can get hit”. 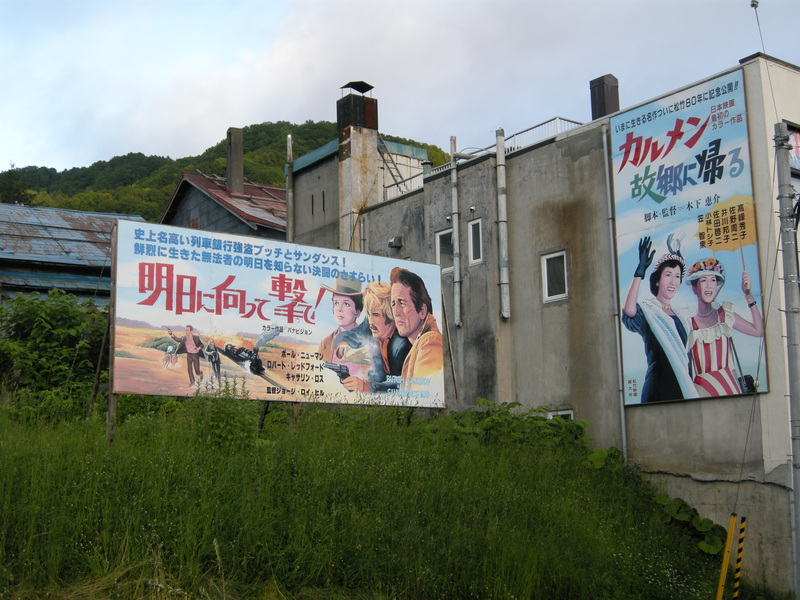 I made my way back up the valley to the Hotel Shuparo, where I came across this poster, an example of Yubari’s latest PR drive. 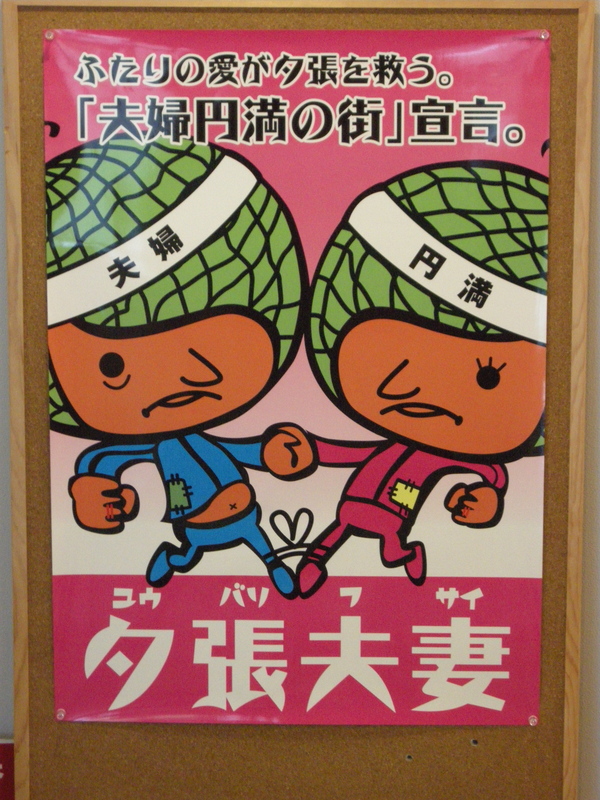 The slogan at the top reads “Their love will save Yubari! Proclamation of a town of happily married couples”. The melon-headed characters wear patched up tracksuits, indicative of their troubled finances. The two words at the bottom, in an archaic font reminiscent of the interwar years, say simply “Yubari married couples”. Extra decoding is required: the campaign is one big pun on the Japanese homonym “fusai”, which means both “married couple” and “debt”, and makes dual reference to the debts in which Yubari is drowning and its divorce rate, which is allegedly the lowest in Japan. This struck me as inspired indeed, and it was no surprise to learn that the Tokyo-based company behind it, Beacon Communication, won the Grand Prix in the Promo category at Cannes International Advertising Festival 2009 for its Yubari campaign. After checking in, I wandered the streets of Honcho (the center of town, from which the English word “honcho” is derived), marveling in the immeasurable poignancy generated by the retro movie posters from the heyday of film, with their heady promise of action and adventure and romance, and their tumbledown or simply humdrum surroundings. The posters alone were worth the whole cost of the trip. 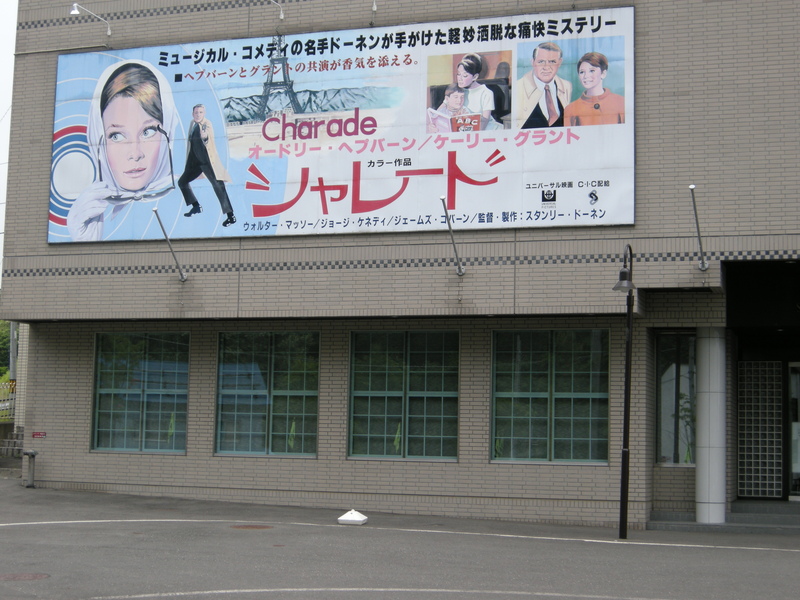 Charade (1963), starring Audrey Hepburn and Cary Grant, on the side of the Hotel Shuparo. 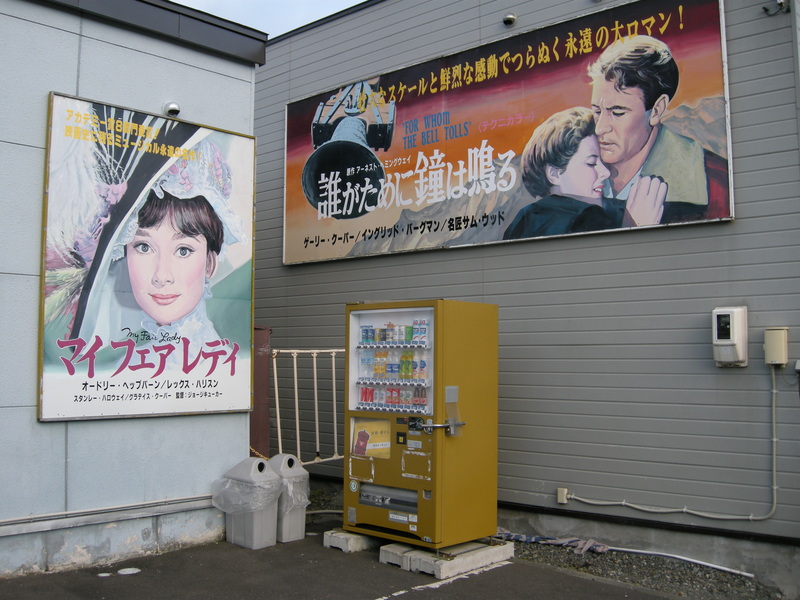 From left to right: Purple Noon (1960), Tales of Japanese Chivalry: the Naniwa edition (1965), starring Ken Takakura, Japan’s answer to Clint Eastwood and Alain Delon, The Man from Abashiri Jail: Shootout at Cape Ronin (1969), also starring Ken Takakura, and finally a generic poster for one of the early episodes in the 48-movie series of It’s Tough Being a Man, which star Kiyoshi Atsumi as Tora-san, a traveling salesman perennially unlucky in love. This is my single favorite photograph of the many hundreds I took on the road. 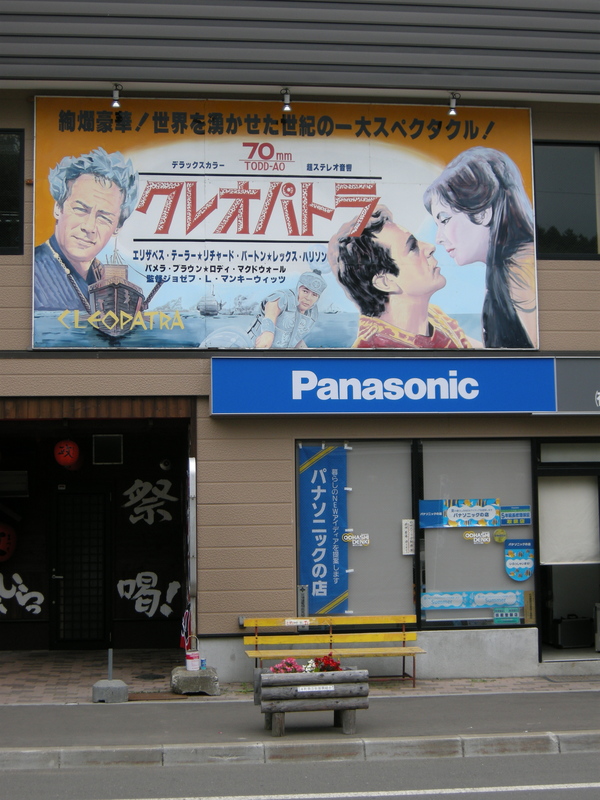 Butch Cassidy and the Sundance Kid (1969) and Carmen Comes Home (1951) by the Japanese director Keisuke Kinoshita. And finally, Die Hard (1988) and South Pacific (1958). Die Hard seems a little out of place in this company. 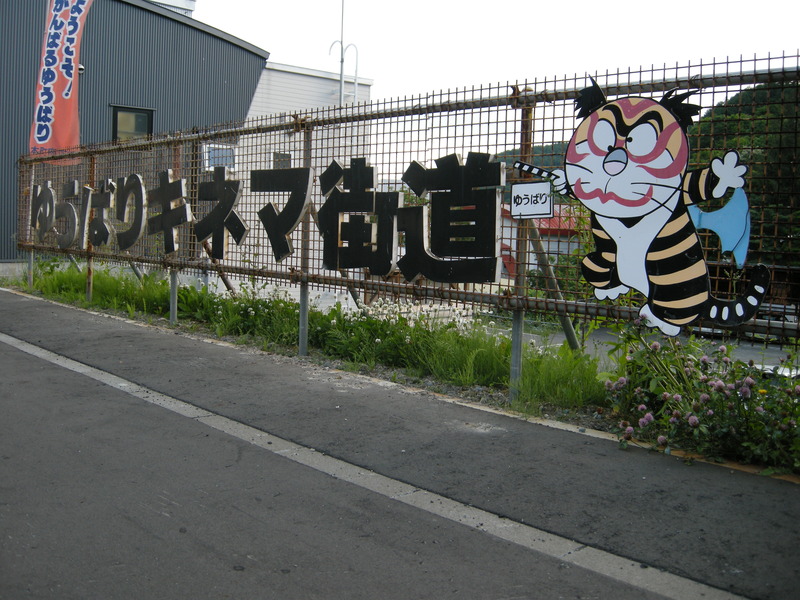 The Yubari International Fantastic Film Festival, one of the city’s more successful attempts to reinvent itself, has this tiger-director mascot. He’s even made it on to the manhole covers. 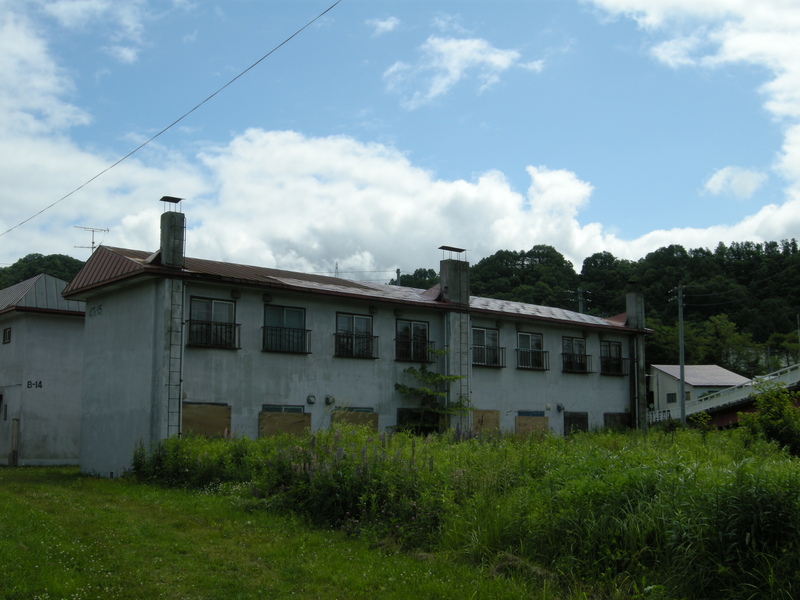 I returned to the Hotel Shuparo, built on the spot where Yubari’s department store, Marubune Okamura, had stood from 1957 until closure in 1980. I was joined sometime later by a man in late middle age and his companion, a woman considerably younger, whose relationship was not that of one of Yubari’s happily married couples. Our conversation, in which the izakaya staff joined, kicked off with golf and took in the beauty of Yubari’s maples and where the most beautiful sunsets in Japan were to be found, before ending up, not for the last time on this trip, with the constitutional arrangements of the United Kingdom, of all things. It came as a shock to the man in particular that “Igirisu”, the Japanese word for the UK, was not synonymous with a constitutionally uniform entity called England, and that there exist places with names such Wales and Scotland with their own parliaments and independence movements. I sensed the conversation was about to take a perilous turn but was powerless to stop the juggernaut. “I think Japan has the most stable constitutional arrangements of any nation”, said the man. “But Japan’s current constitution has only been around for about sixty years. That hardly compares with even a young nation like the US”. “And Japan is a monoethnic society”, he continued obliviously, using a contentious phrase that has landed so many Japanese prime ministers and senior politicians in trouble down the years. “That”, I said, plonking down what I owed on the counter, “is just a right-wing myth”, and stormed off into the night. The next morning I recalled a question the woman had asked me the night before: of the two ingredients of wabi-sabi, the Japanese aesthetic of impermanence, did I prefer wabi, the rusticity, simplicity, and irregularity of things in their created state, or sabi, the patina of age, the wear and tear that comes with constant use, the intimations of transience. I’m in the sabi camp: sabi as a concept is in all probability etymologically related to the verb sabiru, to rust, and for us lusters after rust, Yubari is sacred ground. 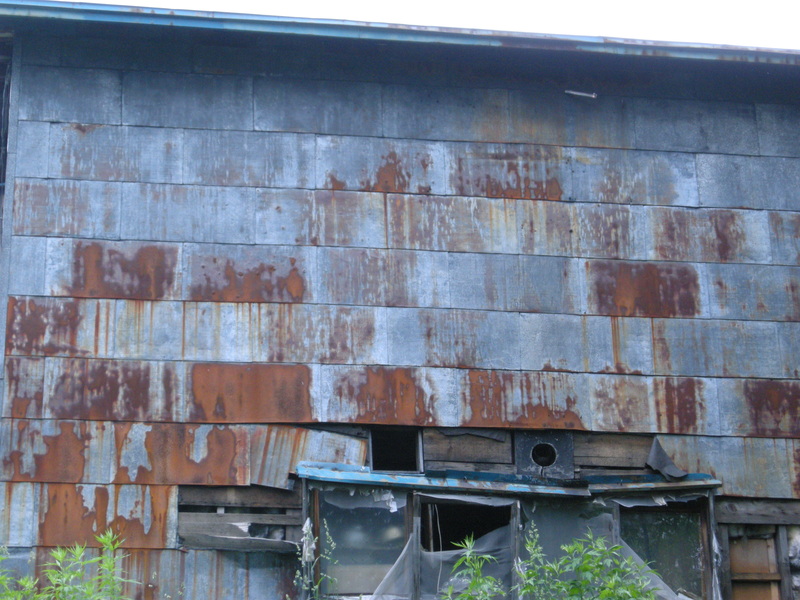 Everything in Yubari rusts: this is the side of a long forsaken house next to the Hotel Shuparo. 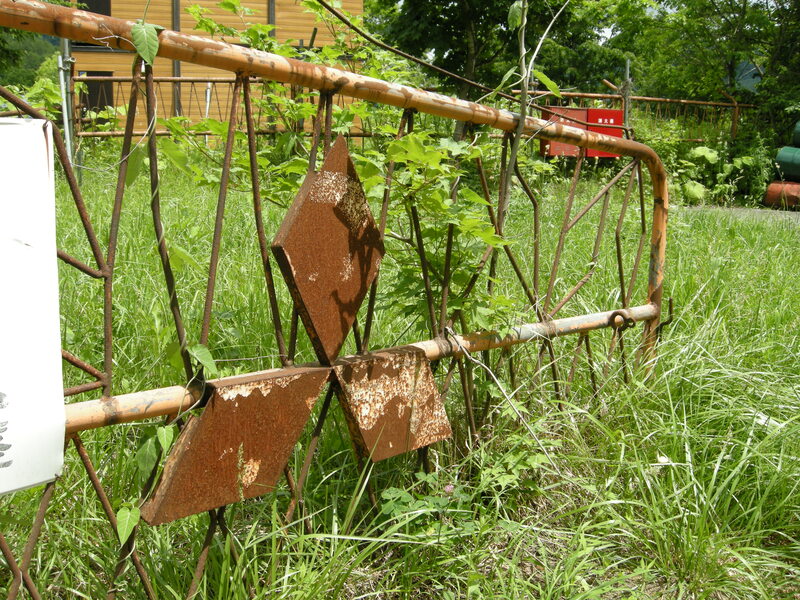 A rusting Mitsubishi logo adorns the listing gate of what was once a filling station. 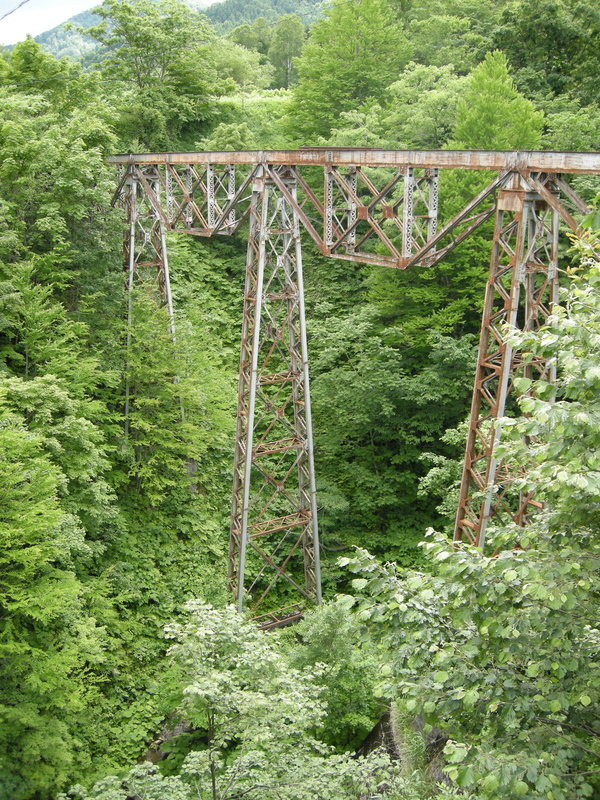 A bridge on the former Mitsubishi Oyubari line; the upper reaches of the line, where this bridge is to be found, were closed in 1973, the lower reaches lingered on until 1987. A couple of imposing edifices, which might have been mine company dormitories and might have been hostels for peripatetic workers, in Upper Yubari. 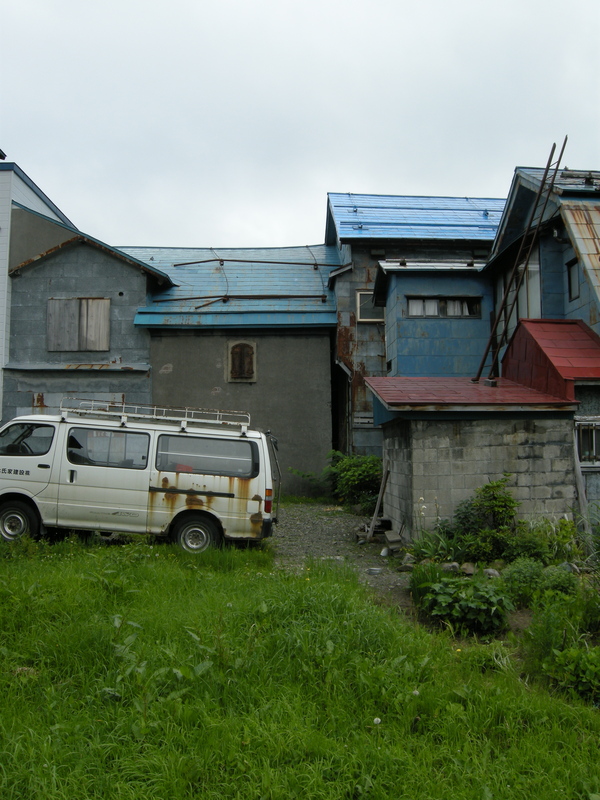 Galvanized steel has robbed us fans of rust of the delights of rotting vehicles across much of Japan—not so in Yubari. 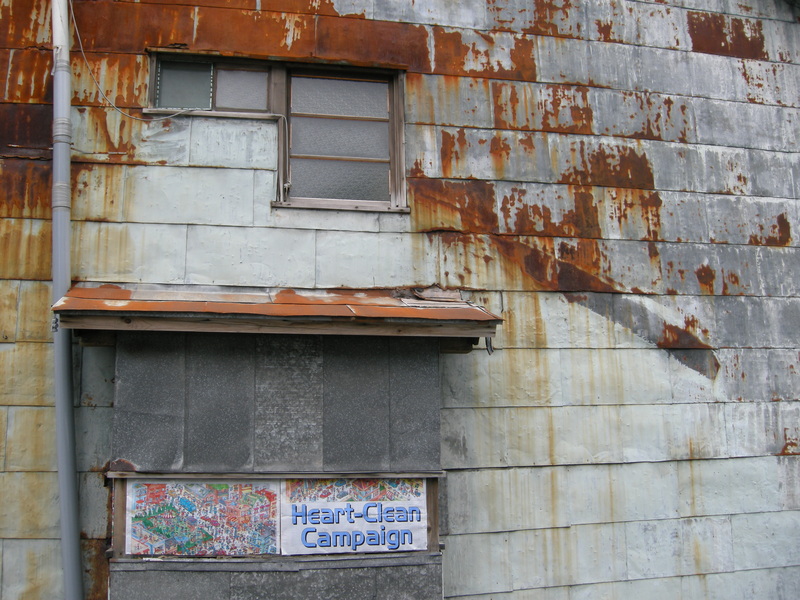 The rusting side of a still inhabited house in Asahimachi, one of Yubari’s bleaker neighborhoods, which had in the not too distant past been conducting a “heart-clean campaign”. 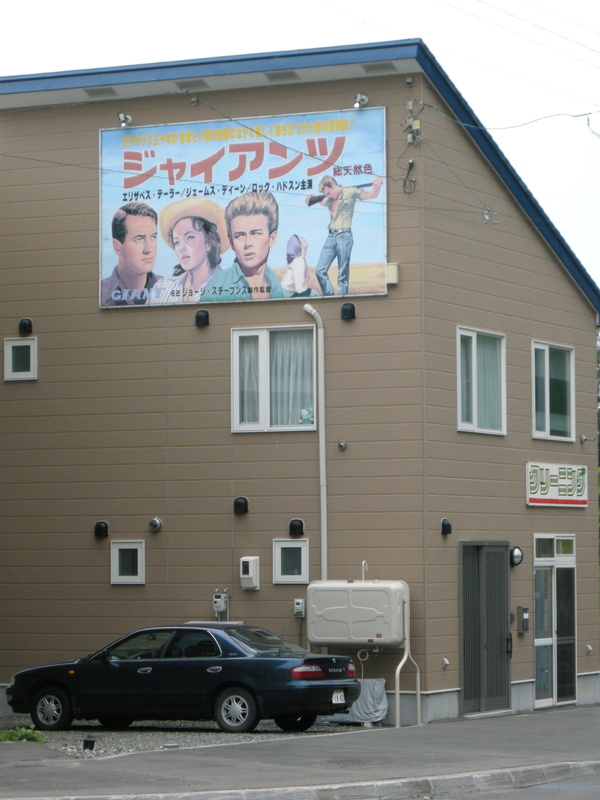 The first two of the injunctions on this Asahimachi sign enjoin the residents to create a neighborhood that is bright and pleasant to live in, healthy and fun. 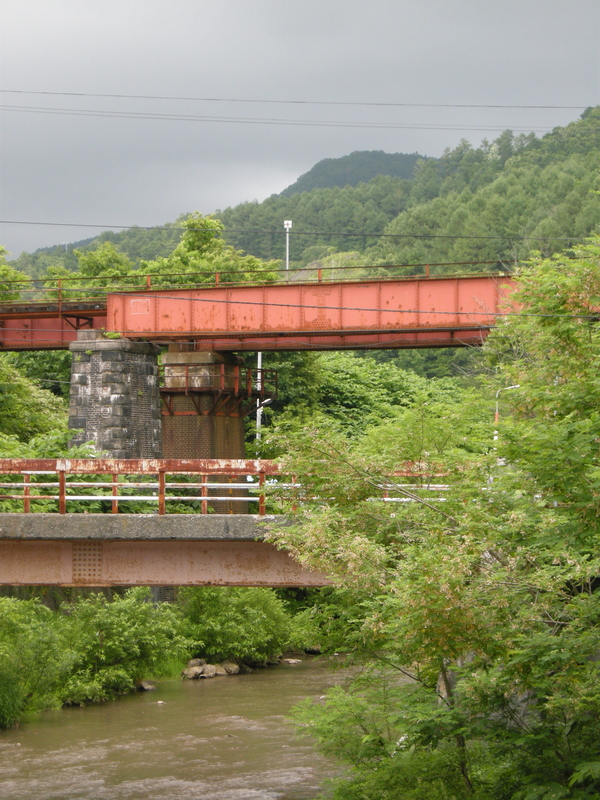 Even the infrastructure still in use is bleeding with rust: the Yubari line and a minor road cross the Shihorokabetsu river in the Wakana neighborhood. Occasionally I was privileged with rust on an epic scale: although all of the mines themselves are long gone, some plants and warehouses have managed to escape the wrecking ball. 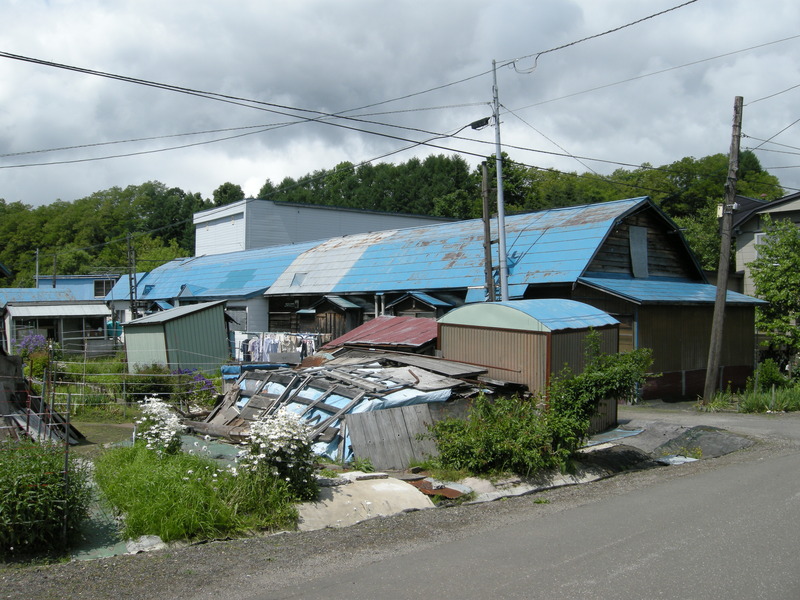 This is a former Hokutan metal-bashing facility, also in the Wakana neighborhood. 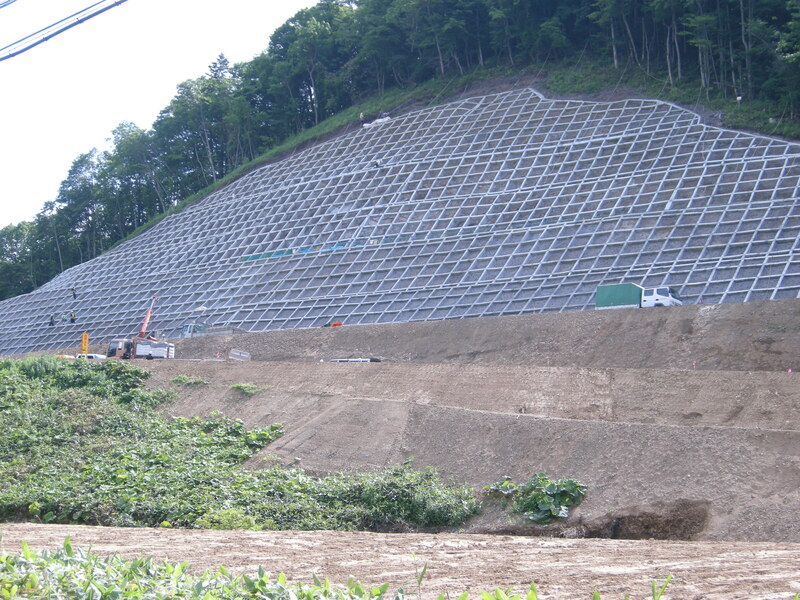 Despite everything, Yubari is currently home to two massive civil engineering projects. The first, in the south of the city, is the extension of the Doto expressway from Yubari, where it currently ends, to the biggest city in eastern Hokkaido, Obihiro. When it is opened, the extension will almost certainly wreak commercial disaster on the bypassed melon emporia on the national highway. 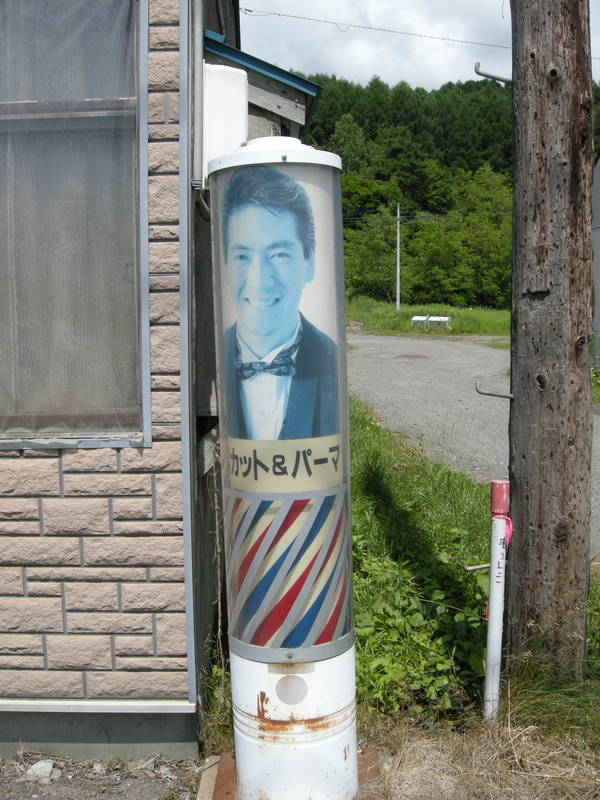 I drove back up to Shimizusawa, where I became perhaps the first and last person in history to develop an obsession with the barbers and hairdressers of Yubari. 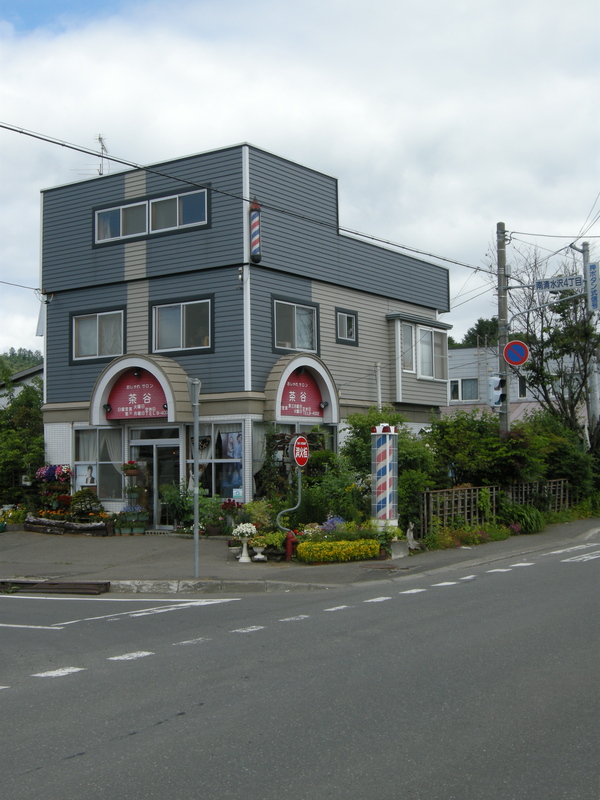 While entire city has no more than a handful of convenience stores and a couple of coop supermarkets left, I counted a couple of dozen hair salons and may have missed a dozen more. 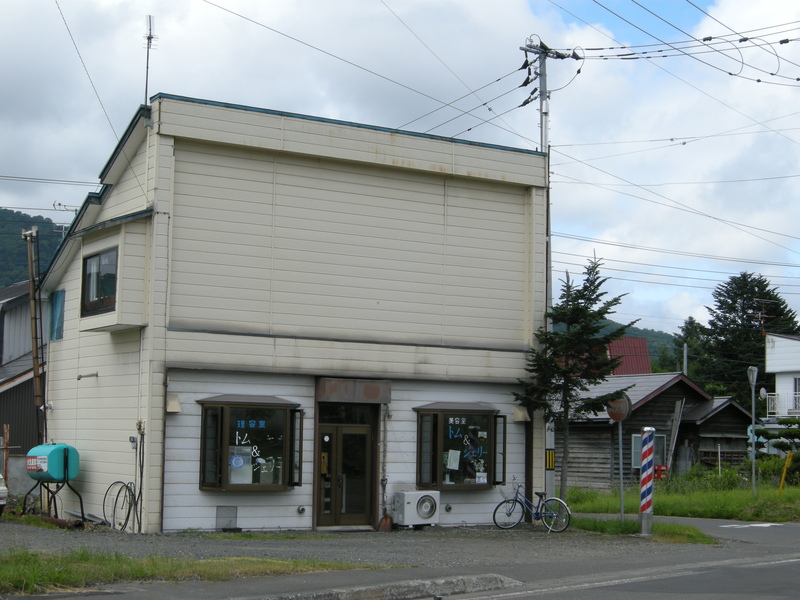 Across much of forgotten Japan, hairdressers are often the last small businesses left standing. 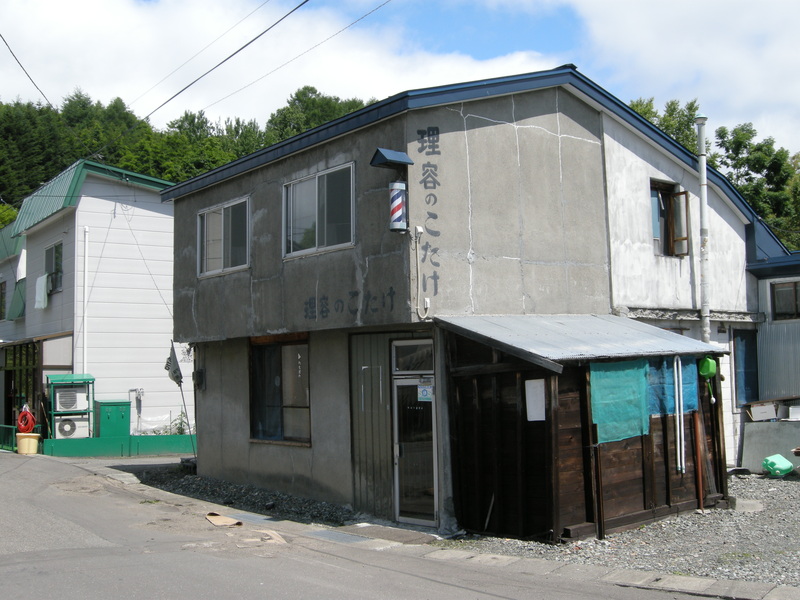 Join me on a brief photographic odyssey around the barbers of Yubari. 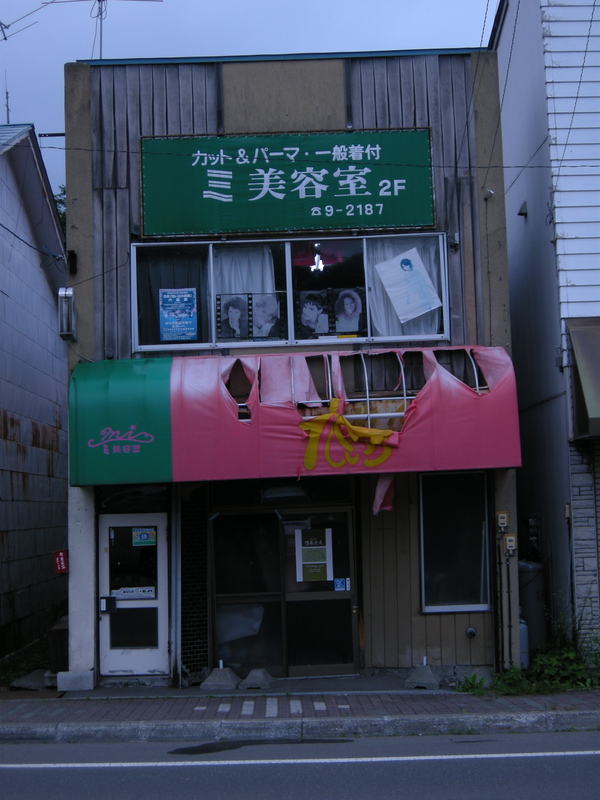 This was my first (and singularly forlorn) example, in the tattered remains of the row of shops that ran alongside Shimizusawa station. Some barely identify themselves as businesses: the only giveaway here was the discreet sign, which says “perm”. 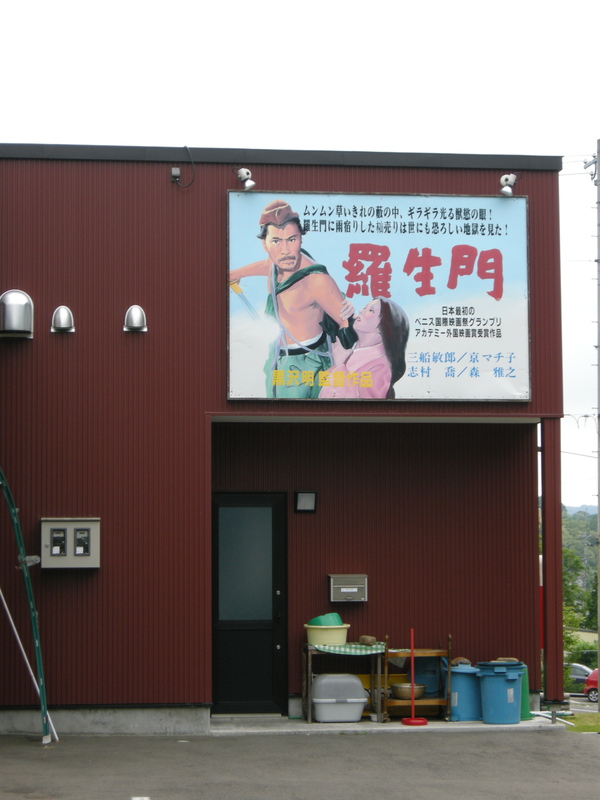 This was also in Shimizusawa. 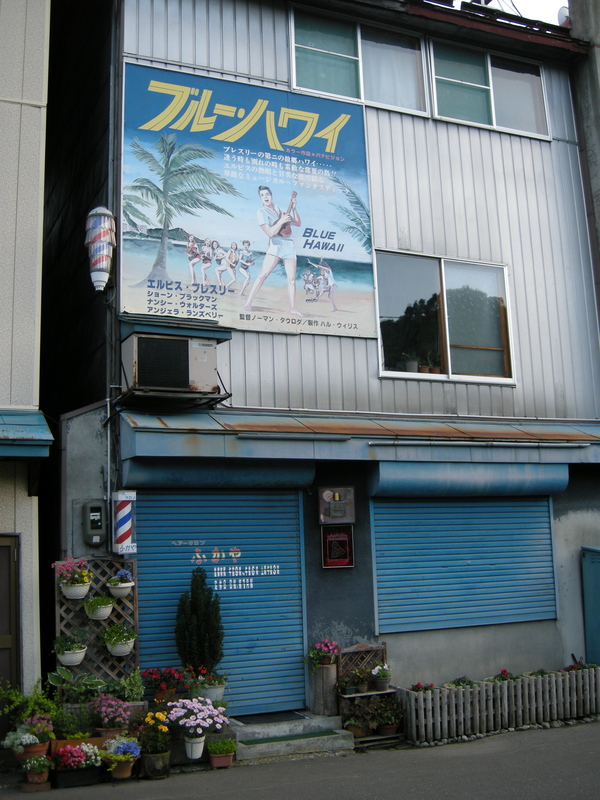 Yet more Shimizusawa hair salons—I tallied eight in this neighborhood alone. The first inspired affection because it’s called Tom & Jerry, the second because I’m a Capricorn myself, while the last was most spruced of all I came across. 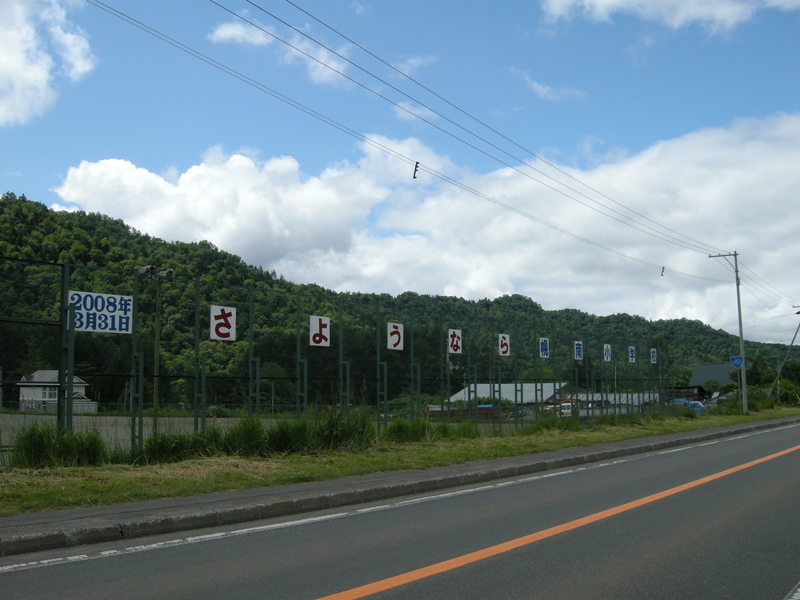 Heading out of Shimizusawa up along the Yubari river on Rte 452, where the recent population loss has been among the most dramatic, the salons grow humbler. A fading but still rotating barber’s pole lures with unattainable elegance. 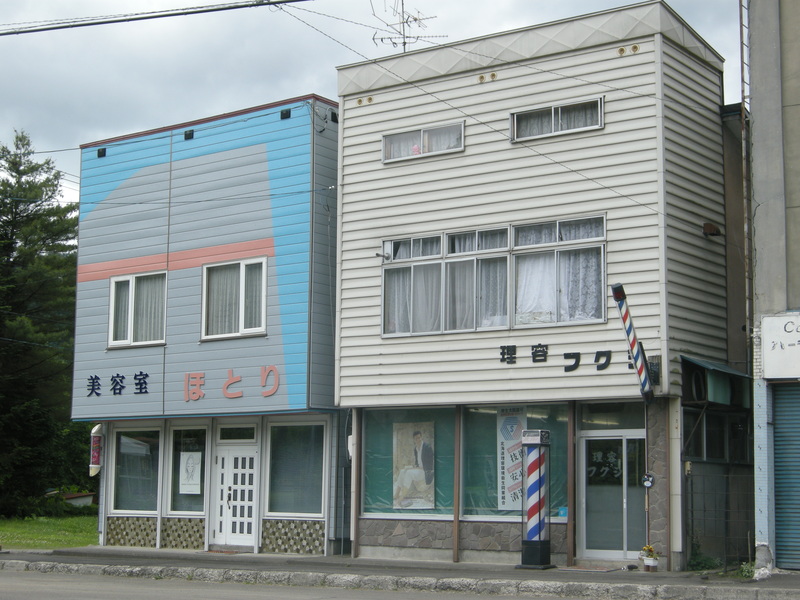 In Nanbu, the last surviving settlement up the Yubari river valley, two salons sit side by side. Back in the main valley, the salons are generally smarter and more solid affairs; not a few have been built or rebuilt in recent years. What accounts for the profusion of cutters and permers? I ascribe it to an unbowed pride in personal appearance even in the most testing of times. 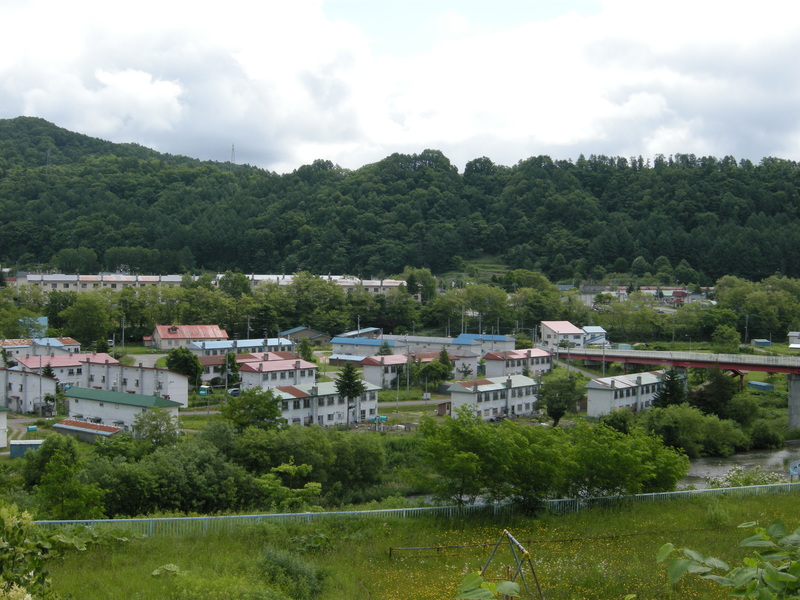 Nestling in a Shimizusawa valley is the largest Yubari estate of what is known as “improved housing”, thrown up—I believe by Hokutan as late as the mid-1970s—as an improvement over the old miners’ cottages. Some of it has been torn down already, as is apparent from the lupinned patch in the last photo, some has been boarded up, and some remains inhabited. My first thought on encountering the estate was to thank the heavens that there are scarcely any hard drugs in Japan, although on later reflection there are so few teenagers, and the ones I encountered, trudging mostly alone home from school, were so downcast, that the presence or absence of drugs may not be an issue. 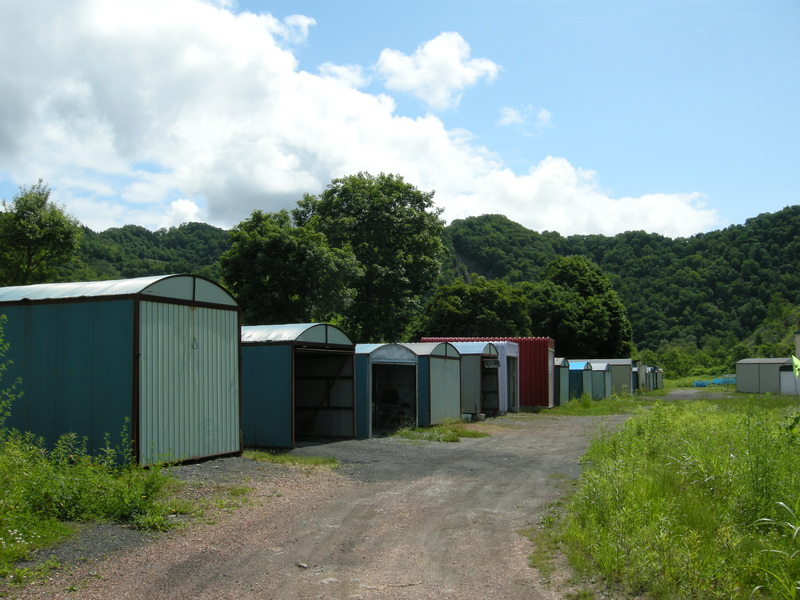 The estates were built without garages, which were erected around their fringes when motorization finally reached Yubari. I found them eerily, somberly beautiful. 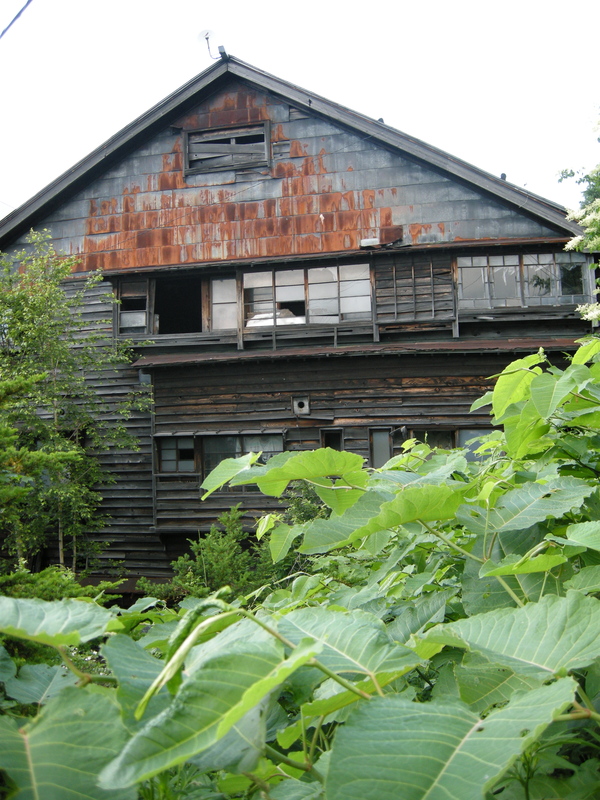 Almost all the old wooden row housing that used to dominate the landscape has been bulldozed, but this patch, with a few old-timers still hanging on, remained on the border of Shimizusawa and Nanbu. These in their turn were an improvement on the miners’ housing of the early days. The tiny row houses of yore were divided only by partitions that did not reach the roof and children slept in the wardrobe where the bedding was kept. 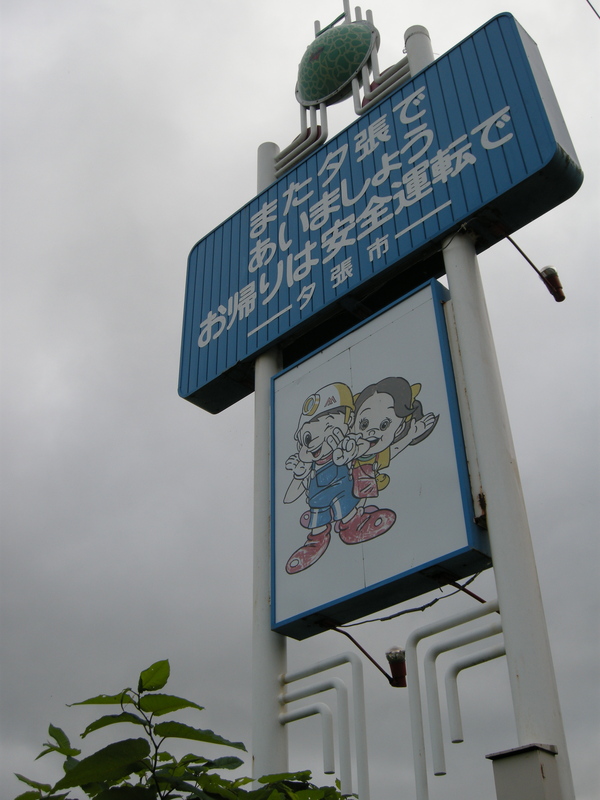 Further into Nanbu, the sign bids farewell to Konan Elementary, which closed on March 31, 2008. The school buildings are visible behind the slide and the toy digger. 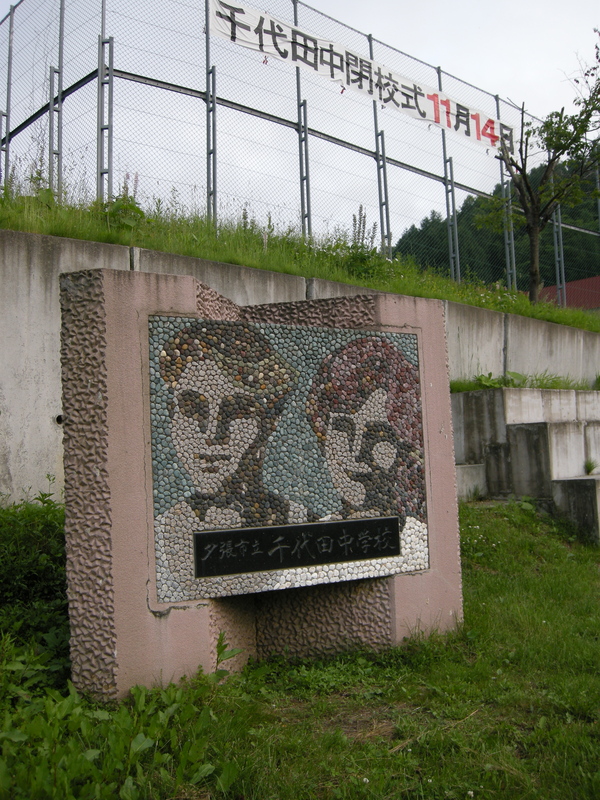 Yubari had 22 elementary schools, with over 20,000 students, nine junior high schools, and six high schools in 1960. By the end of 2010, it will have just one of each. 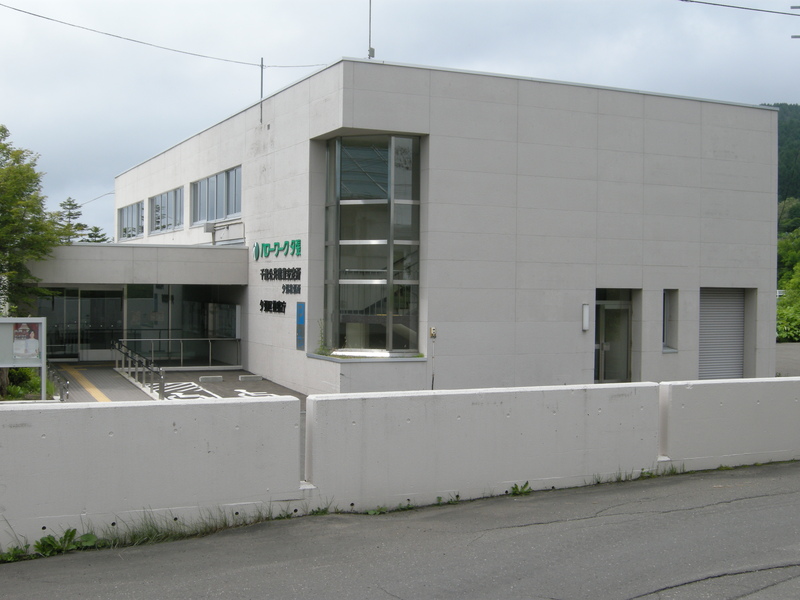 Chiyoda Junior High, still open when I took this shot, was one of the last to go; the sign announces the November 14, 2009, closing ceremony. 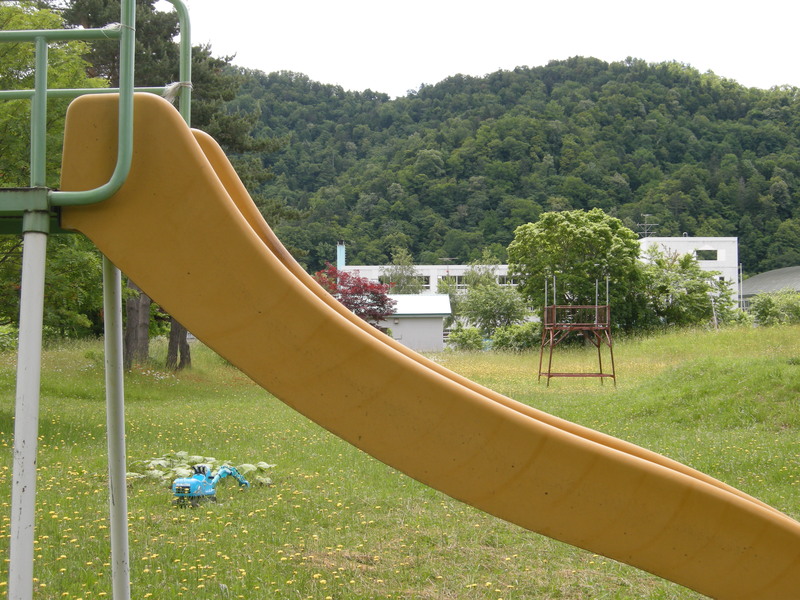 Most of the schools have been razed; one exception is the long derelict Shikanotani Elementary. 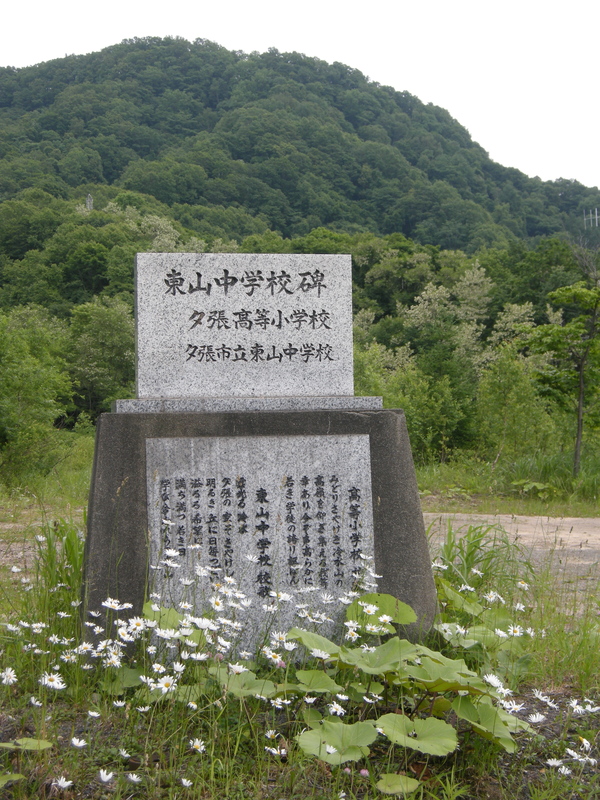 Yubari is dotted with memorial stones to commemorate fallen schools. 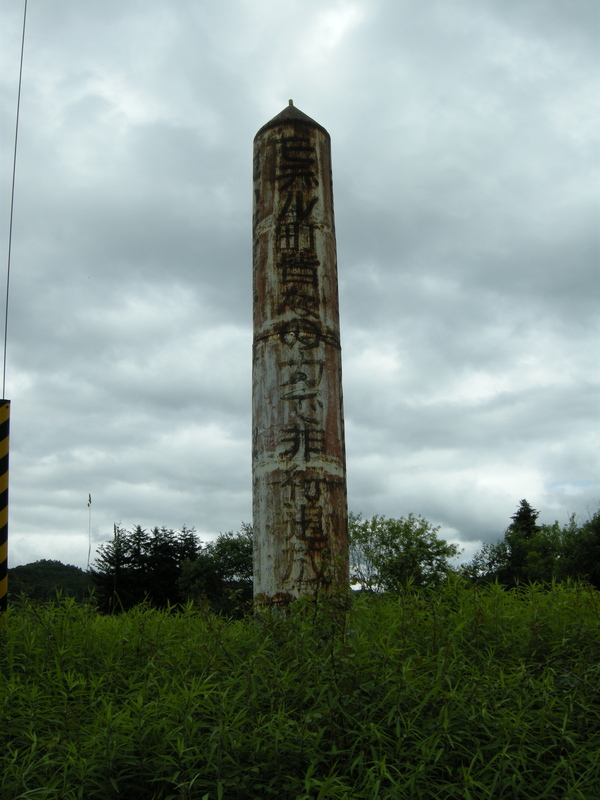 In the hills above upper Yubari, this marker memorializes Higashiyama Elementary and Junior High. 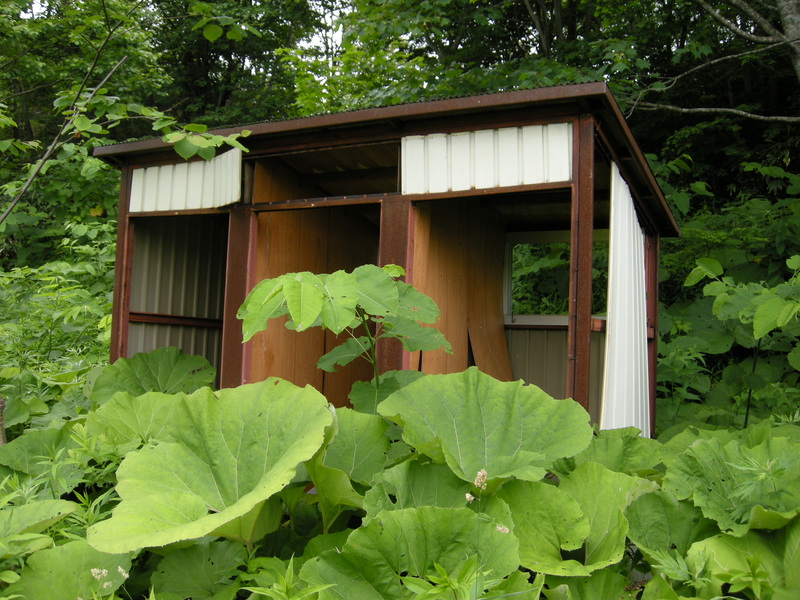 By some quirk of fate, the school’s outhouse remains standing. 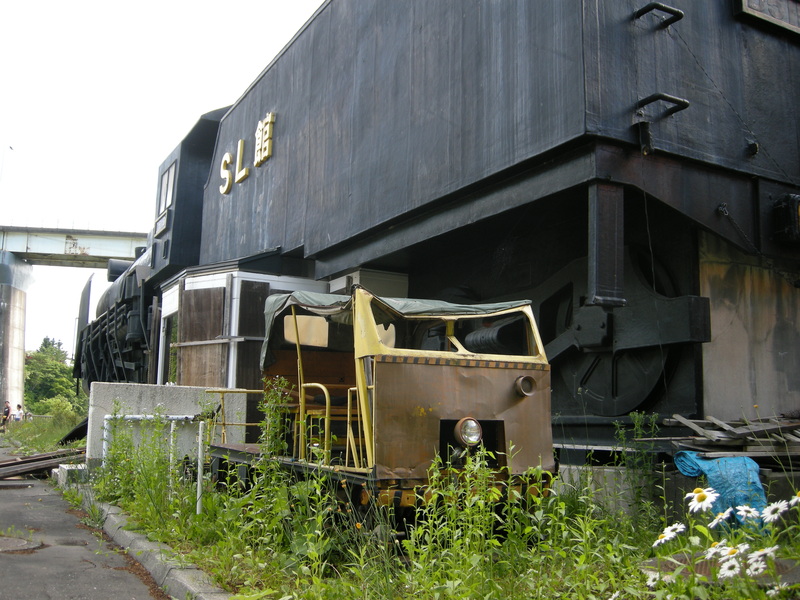 At the long disused Minami Oyubari station, a snow-plough and carriage ensemble have been preserved. 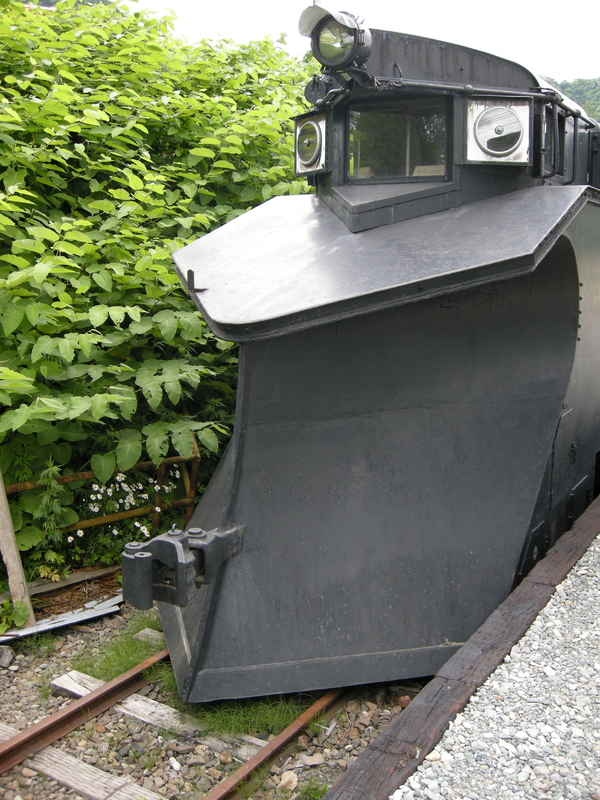 The face of the snow-plough is one of the most fearsome mechanical renditions I’ve ever encountered. 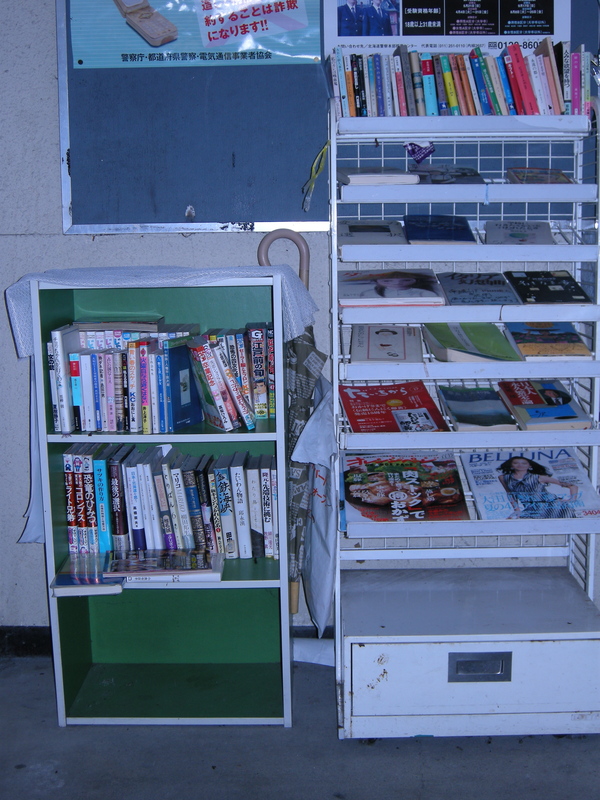 A poster in a carriage revealed that a train buff’s book on the Oyubari line was for sale at a store called Takahashi Shoten in the village. I decided to stop by to pick one up. 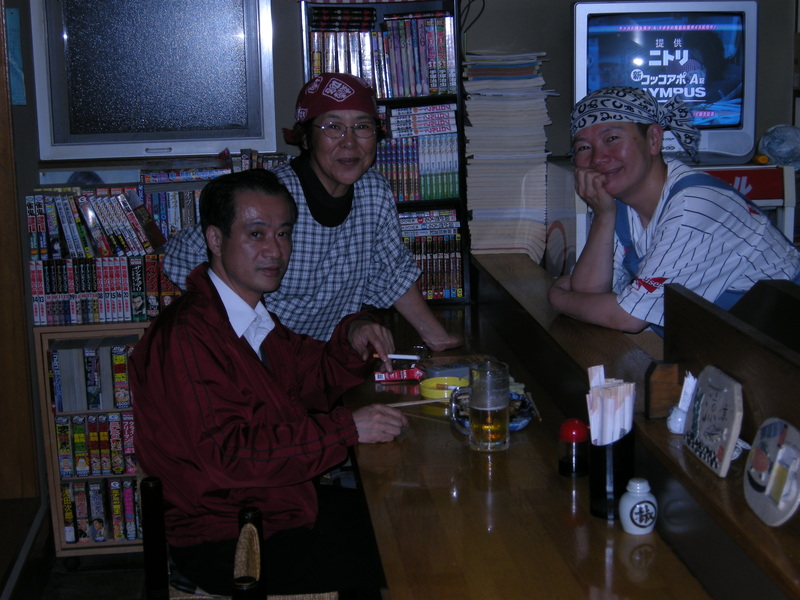 Takahashi Shoten was run by the long-widowed and lonely Takahashi san, 81 but with a mind still as bright as a bell. Eager to talk, she kindly invited me to the back of the shop for a cup of tea and a chat, but mournfully the reek of incontinence was overwhelming and I declined as politely as I could. She addressed me in the politest Japanese conceivable, which usually grates, but in her case charmed. 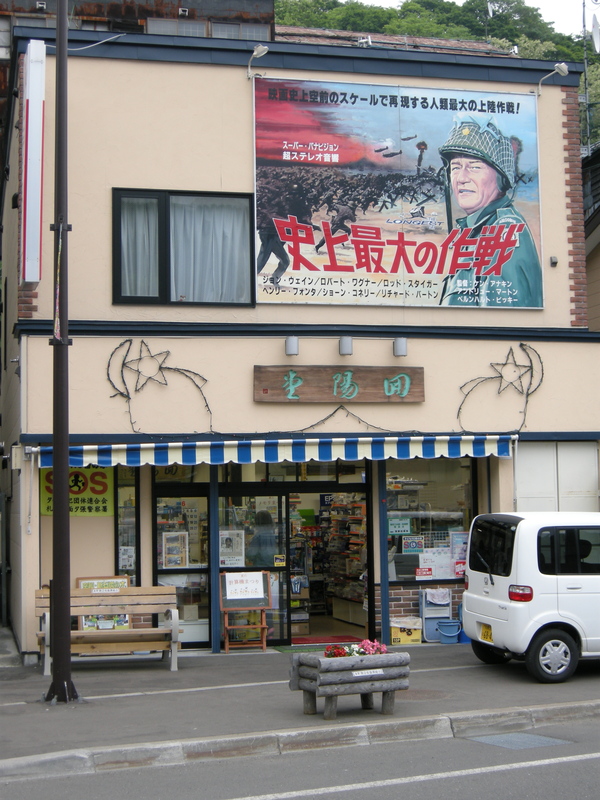 She showed me the aerial photos of the old Nanbu, visible above, and explained how the white-collar workers lived at the higher elevations along the main road and the miners at lower ones closer to the Yubari river. 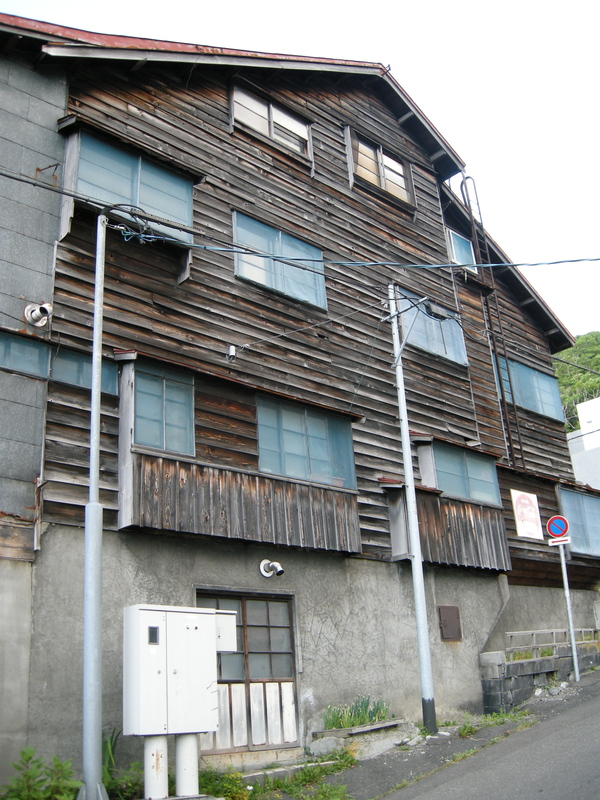 The photos show vast tracts of wooden row housing in serried ranks several hundred strong. All ploughed into the earth now, she said. 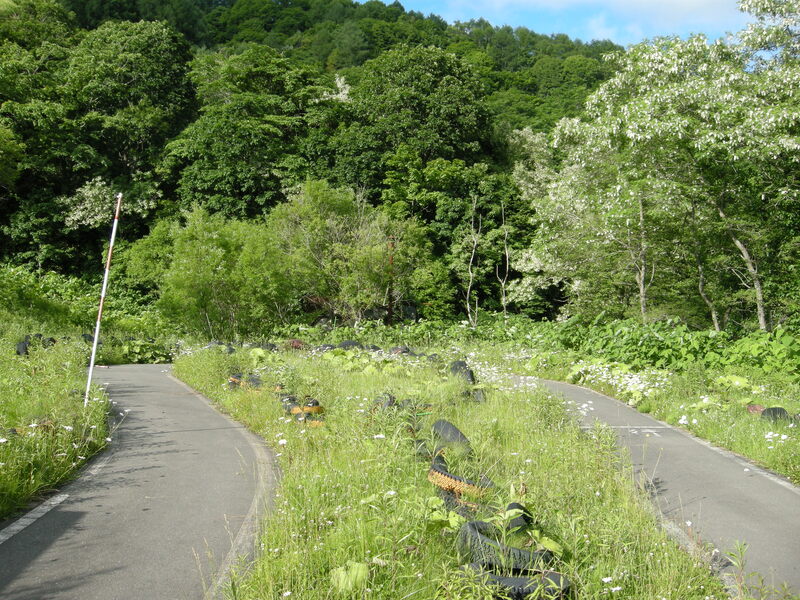 If I was staying a little longer, she volunteered, there were still people in Nanbu who could take me into the mountains, where roads no longer led, to look at the real ruins, the mines of Yubari’s earliest days. It was a tempting offer indeed but as ever I was pressed for time. I promised her I would return someday to take her up. She invited me to sign her guestbook, saying that a party of foreign cyclists had been through a month or so back. Indeed they had—a multinational group from countries as diverse as Argentina, France, and Switzerland. Just as you think you’re pioneering uncharted territory, I thought to myself, the rug is subtly swept from under you. 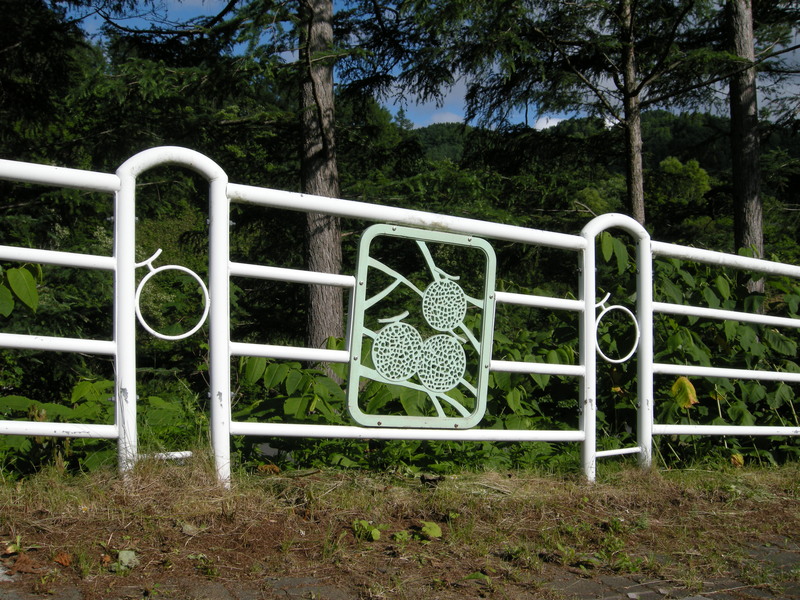 I wonder what the cyclists made of Yubari. “Where are you off to next”, she asked. “I’m thinking of heading to Kashima”. “Oh, Kashima’s been erased from the map”, she said off-handedly, which brought an inward chill. She was wrong in the literal sense—Kashima was still etched onto my just purchased roadmap—but was later to be proven right in the metaphorical sense. Takahashi san, who posed for the shot above only with the greatest of reluctance, came to symbolize for me the endurance and dignity of Yubari. 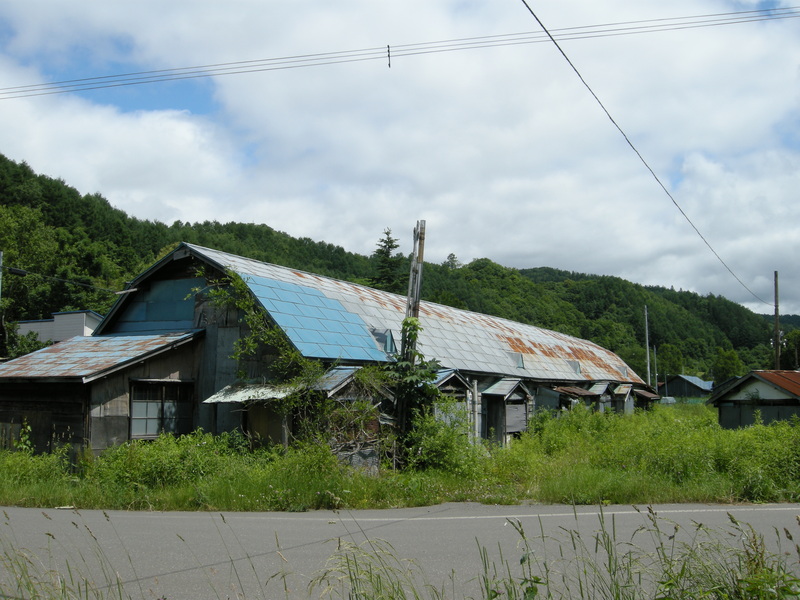 How many people in the developed world in the modern era have been witness to such devastation of their community, with Nanbu’s population having fallen from 7,124 in 1985, when Yubari’s last mine, the Minami Oyubari, was still in operation, to 749 in September 2008. 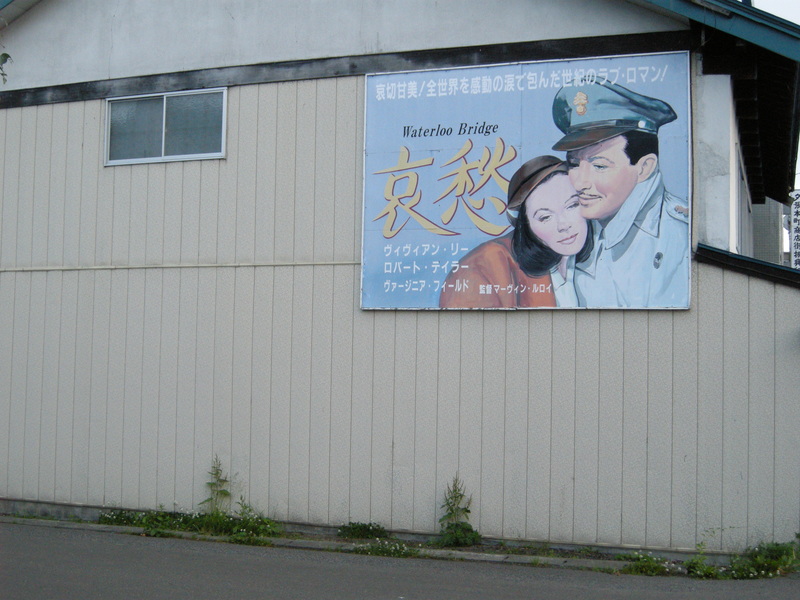 I drove down to the riverside to see where the miners of Nanbu had once lived. The shops and cheap restaurants at the head of the tracts of housing were still mostly standing. A few had imploded from the weight of the snow, their rafters a collapsed wooden ribcage. A dog howled from not far off. In this valley of ghosts, someone was clinging on. 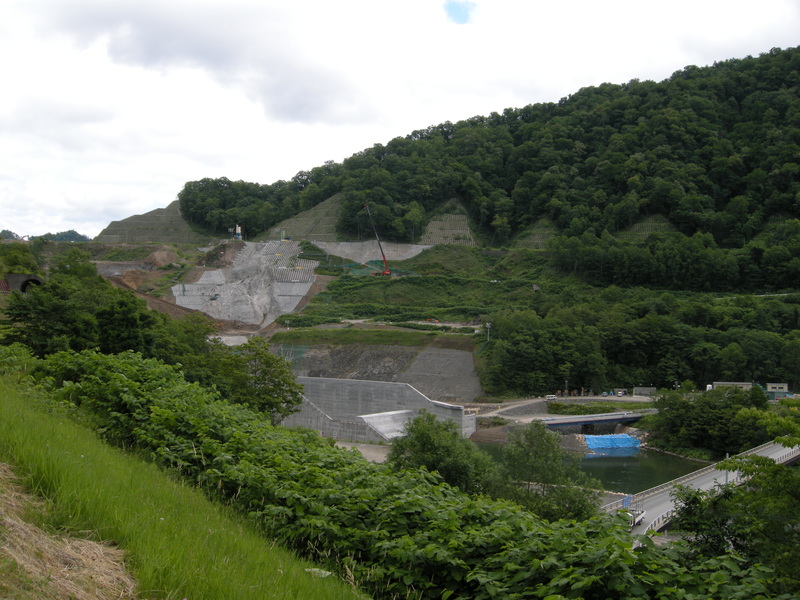 Yubari’s other massive civil engineering project is the construction of the Shuparo dam, which is just 150m downstream of the existing dam and which will raise the height of the reservoir behind it by a dozen meters. On completion in 2013-2014, many things will be lost as the waters rise. 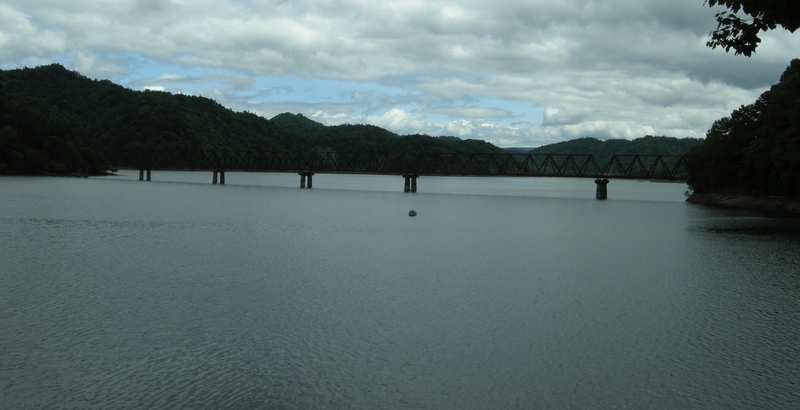 The Sangenkyo is a three-truss bridge built in 1958 for one of Yubari’s forestry railroads, which was partially submerged by the first dam. It saw only five years of active service, the line closing in 1963 as Japan’s forestry industry waned in the face of imported lumber. The bridge has become a local symbol for the elegance and distinctiveness of its design and for its closeness to the water, but the money is not there to save it and it will be partly dismantled before the completion of the new dam. 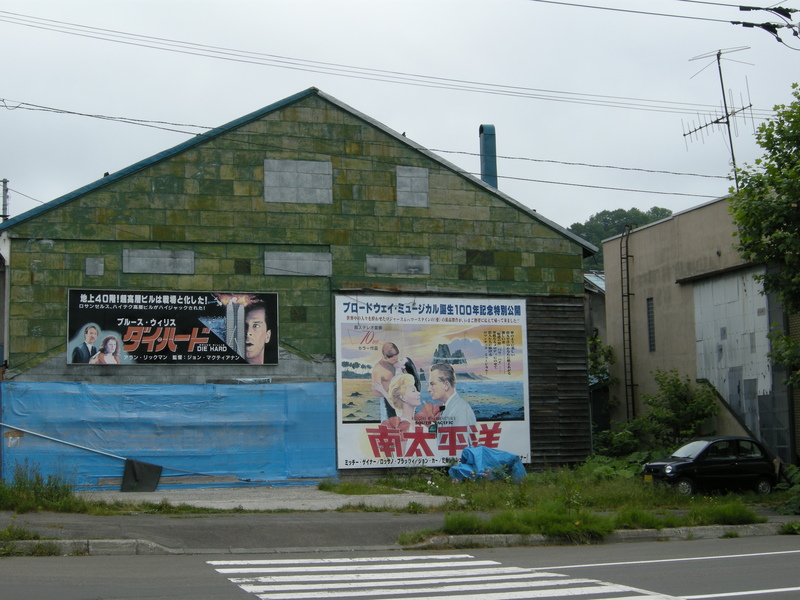 I searched along the road north of the reservoir for any vestiges of Kashima, home to some 20,000 people in 1960. 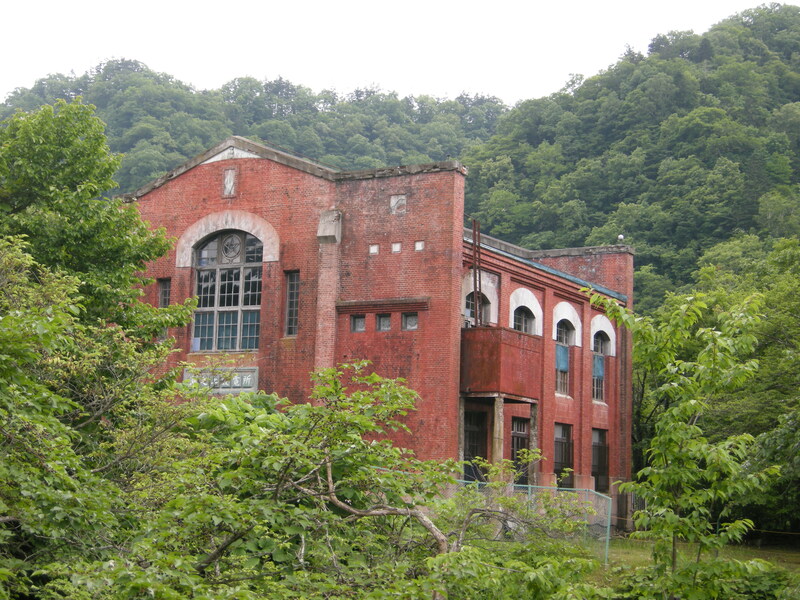 Kashima lost much of its farmland when the first dam was completed in 1962 and the Mitsubishi Oyubari mine, the last and greatest reason for the town’s existence, closed in 1973. By the late 1980s it was a ghost town of a handful of hangers-on. Earth-moving trucks were thundering down the road in both directions at a pace of one a minute, making it difficult to park on the hard shoulder and head into the undergrowth. Most trails off both sides of the road were barred with no-entry chains. Recent photos by other visitors anyway suggest that the last rubble was carted away some years ago. Takahashi san was right—Kashima had been wiped from the map. Aside from the slagheaps, this was the sole roadside clue to Kashima’s onetime existence, a forbidding intersection sign that proclaims “Model town: With everyone’s effort, we can drive away bad behavior”. 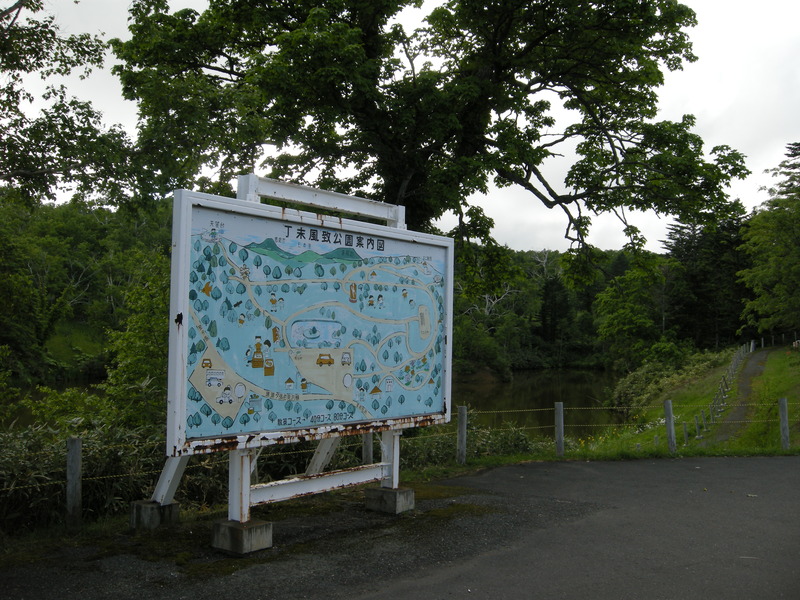 The land where Kashima stood, and the road from which this photo was taken, will soon sink beneath the ripples of the reservoir in summer and its snow-capped ice in winter. Official Japan makes much of the rights of former residents of the disputed Russian-occupied Northern Territories to return to the islands to visit the graves of their ancestors. 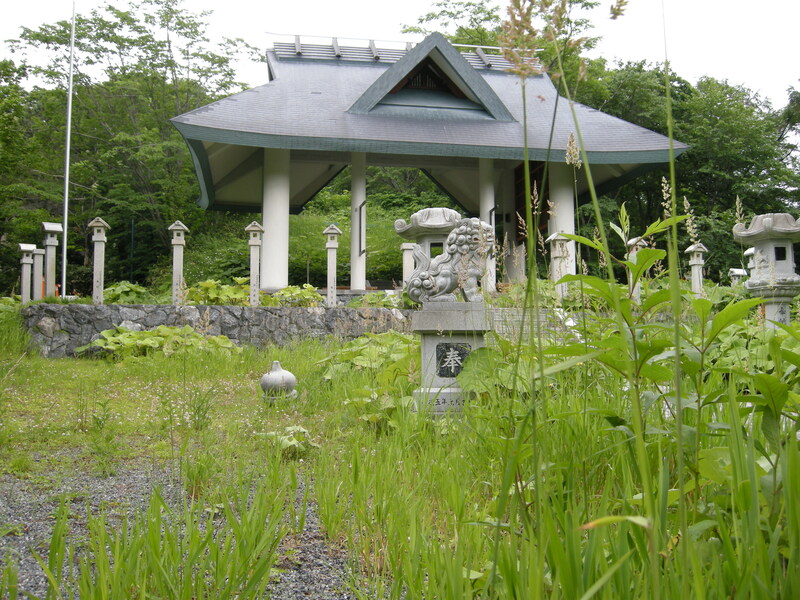 Where were the graves of the ancestors of Kashima’s former residents, I wondered, and if they too are to be swallowed up as the water rises, will anyone in authority raise a finger of protest? From the top of the Yubari river valley, I headed back over to the top of the main valley, where Yubari’s infamous tourist facilities are located. Teimi was once the northernmost settlement in the main valley, with more than 3,000 people in 1960; it had been entirely depopulated by 1980, one of the first places to disappear, and replaced by a park. 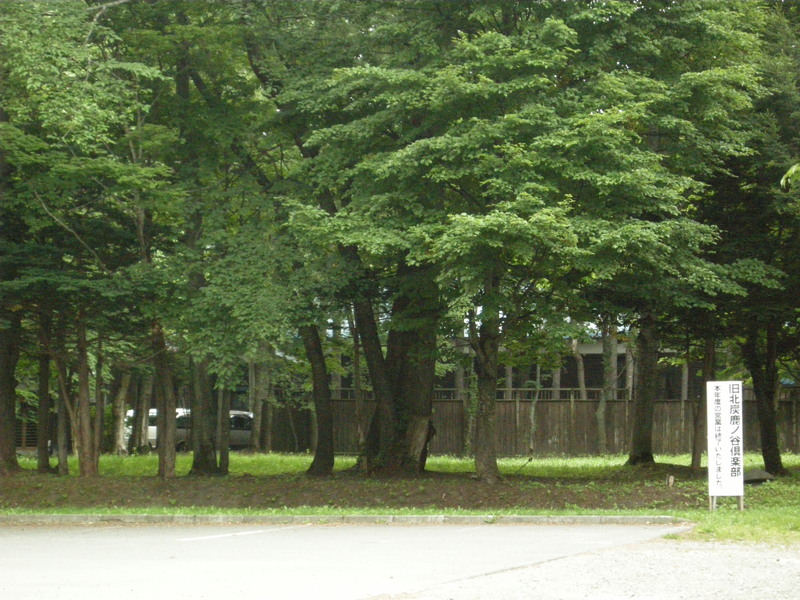 Yubari can no longer afford to keep the park open and the entranceways were roped off. Elegant melon railings near the park caught my attention. 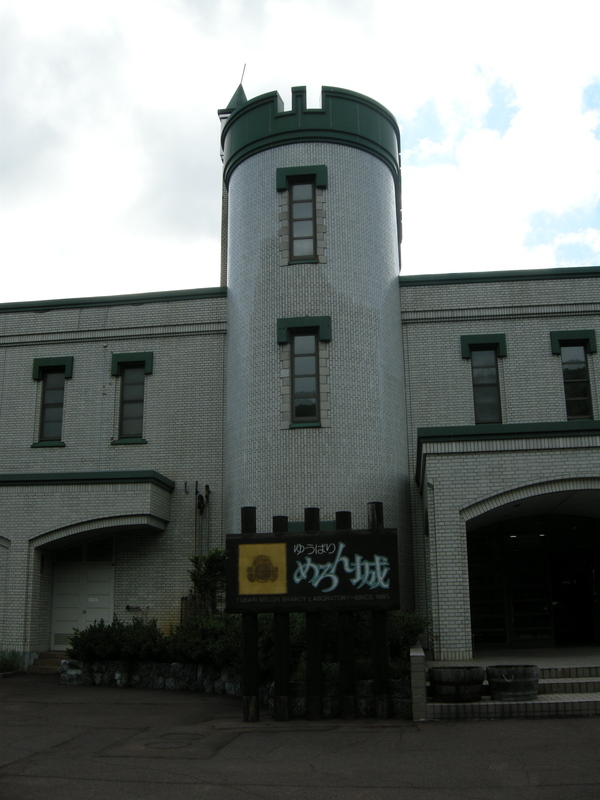 Melon Castle was built in 1985 to produce melon brandy, melon liqueurs, and other drink and is generally if bafflingly classified as a tourist facility. 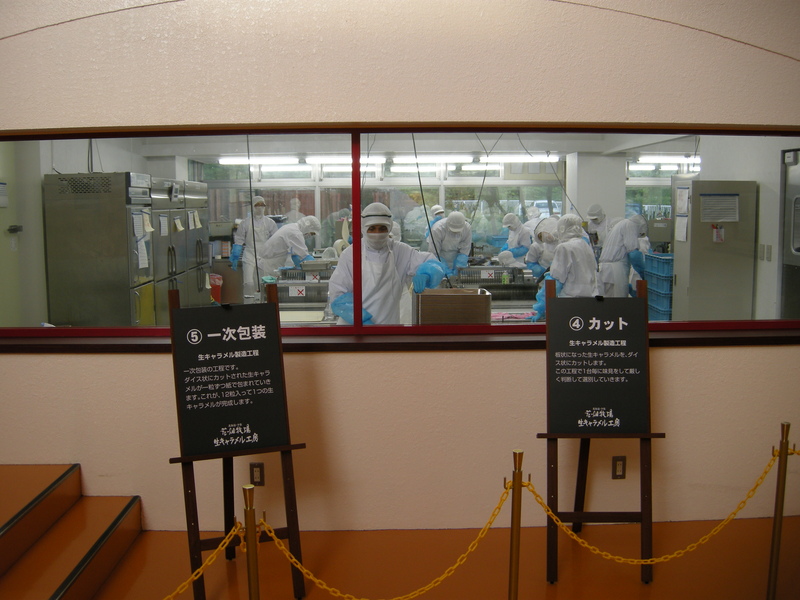 This is virtually all there is to see, the labelling and capping room. The production line was silent when I was there, although the women in the adjacent souvenir shop told me that it had been running in the morning. The un-narrated video loop, which shows from a fixed angle the line in action, was playing on and on. Paired with the photo propped against the glass, which shows the same thing, it lent the scene a surreal and sinister air. There was nobody else about. 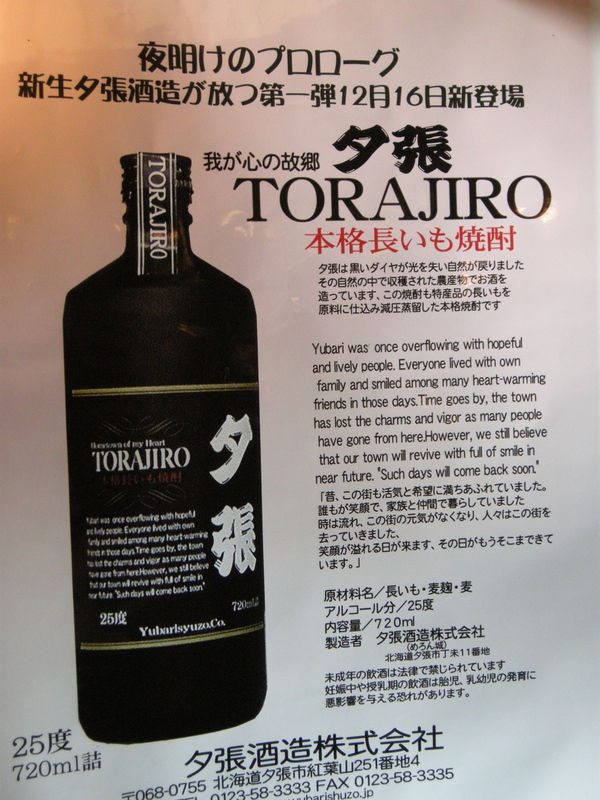 A poster for a sweet potato shochu proclaims Yubari’s confidence that “our town will revive full of smile in near future”. Just below Melon Castle was a year-round melon cultivation center, where I suppose tourists were once able to get a hands-on feel for the melon-raising experience. 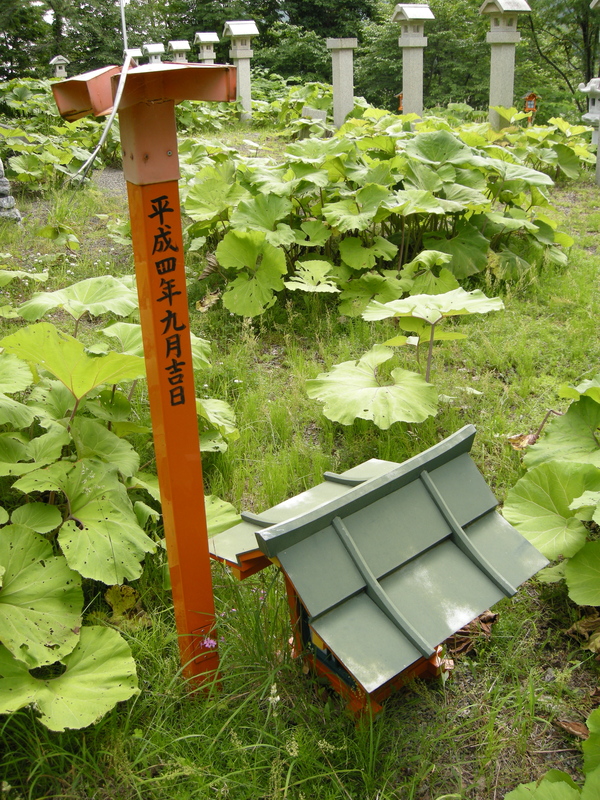 The melonhouses were overrun with weeds. 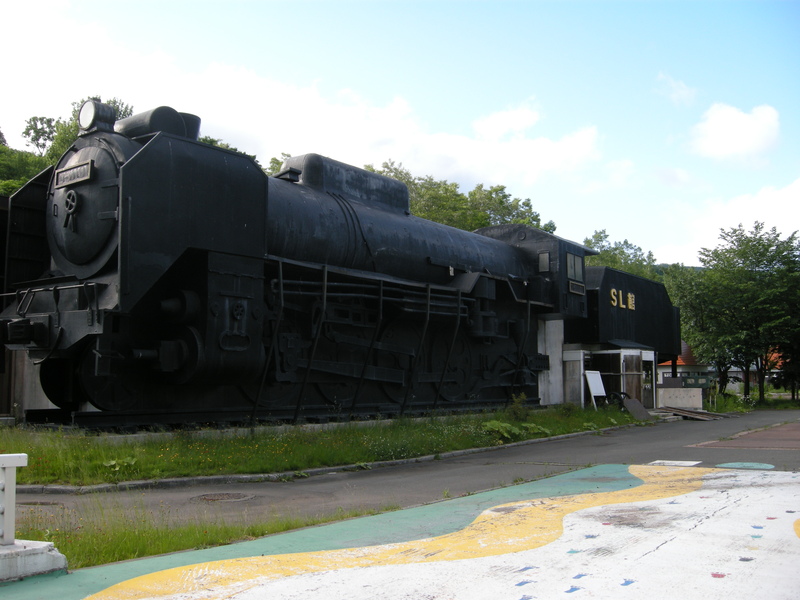 The jewel in Yubari’s crown of tourist attractions was intended to have been the Coal History Village, which sprawls over the Upper Yubari valley where mines and marshalling yards once stood, the hillsides covered with mining communities. 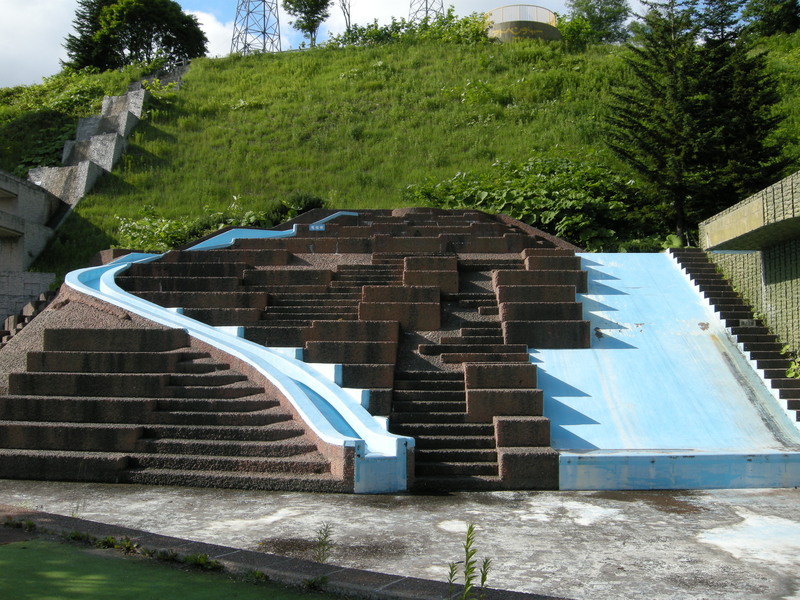 Construction started in 1978 and it was fully open by 1983, although attractions were added later. At it apogee, it was an eclectic, indeed incoherent, mishmash of nods to the past and the serious—the Coal Mine Museum and a giant Steam Locomotive Hall, for example—and the contemporary, entertaining and futuristic—a rollercoaster, water slides, go-karts, and a Robot Science Museum. I wandered in through the boarded-up back entrance. This is how it once looked—there’s Yu-chan again, hiding in the shadows. The rollercoaster has been dismantled and the Robot Science Museum was pulled down in 2008. A steel and glass elevator inside the snake of the collapsing aquaslide, inexplicably named Kilimajaro, once ferried tourists to the top. It was hard to grasp how the water features had entertained. 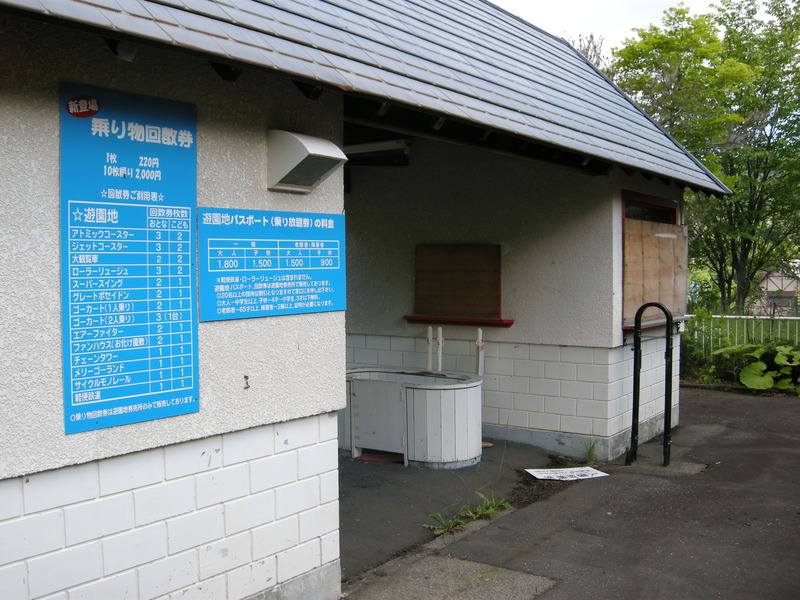 The weight of Yubari snow in winter was palpable at the go-kart ticket booth; at the top of the hairpin, was the hulk of a workshop that the planners had neglected to clear, just visible through the summer boughs. Steam Locomotive Hall was everything I had hoped for: monstrous, kitsch, and melancholy. 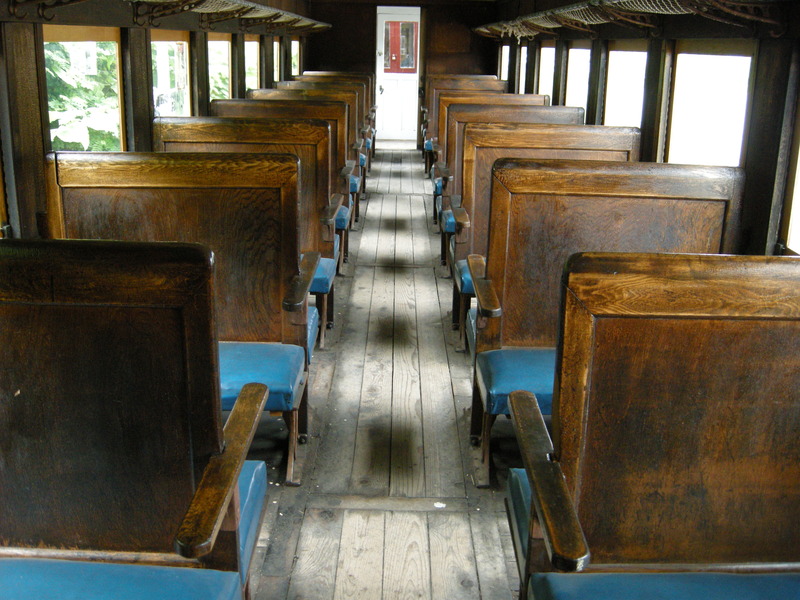 The village once had its own miniature railway—one of the railcars nestles in the shadows of the hall. What on earth was the logic behind the tree ogre? 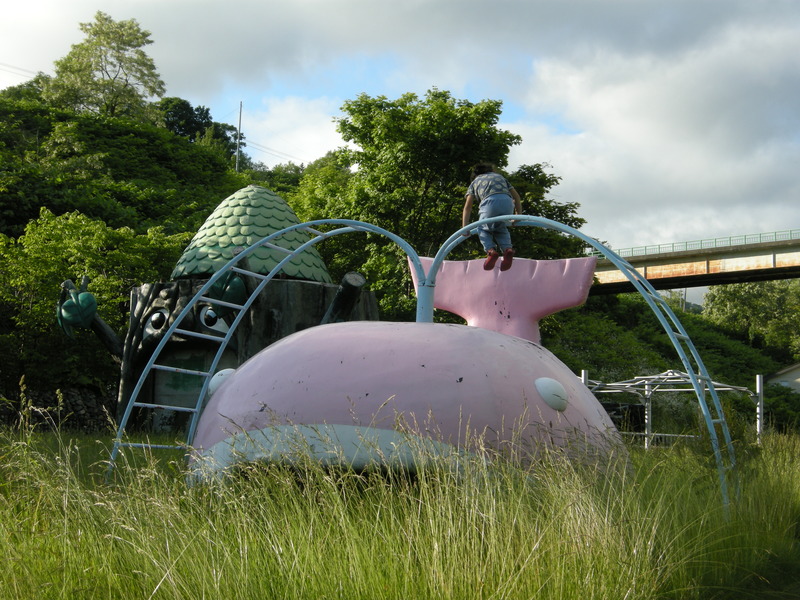 A lone girl clambered over the pink whale in the neglected play area. I was gradually losing light and vowed to return the next day. 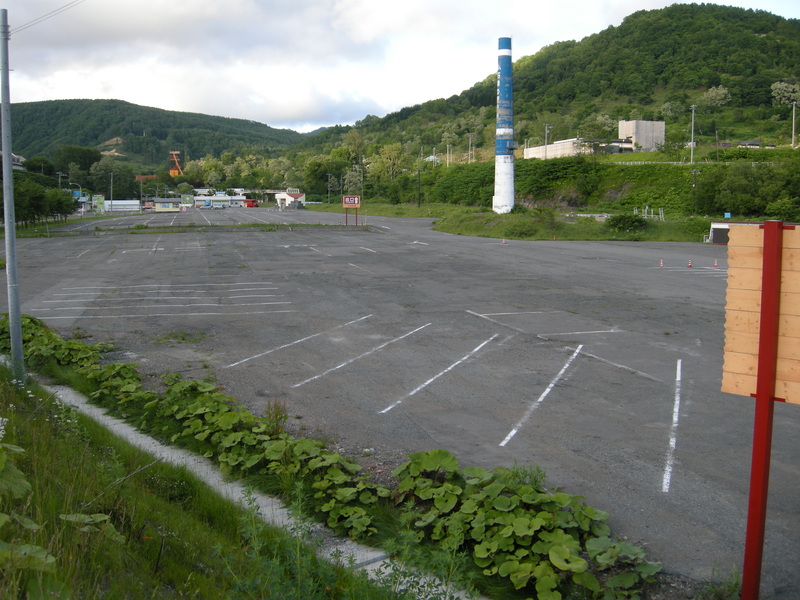 The main parking lot was almost wholly devoid of vehicles. 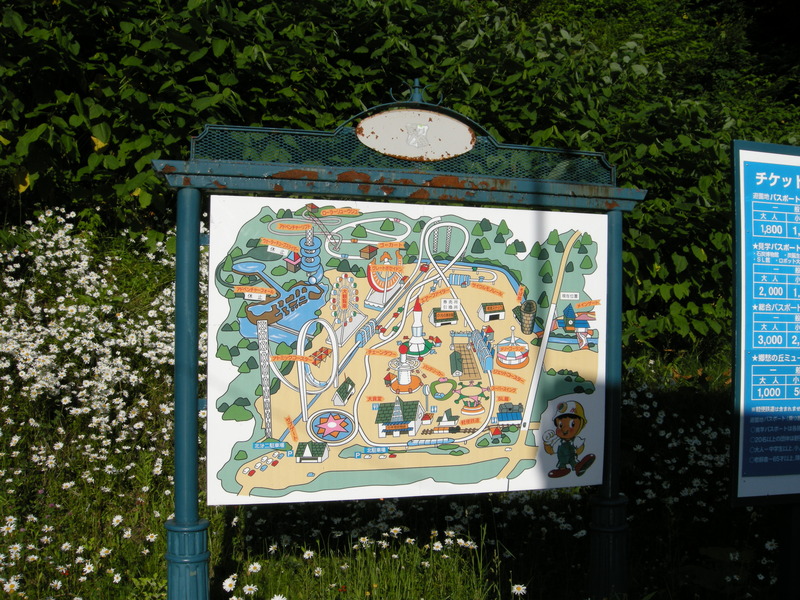 All told, the village may have capacity for some 2,500 cars and buses, implying peak attendance of around 10,000 people. If anyone tries to sell me the Nihonjinron (“theory of the Japanese”) line again, tries to tell me that Japanese people can mystically read each other’s minds through “haragei” stomach arts and “ishin denshin” telepathy, I plan to proffer this picture as evidence to the contrary. At this end of the parking lot, furthest from the Coal History Village, there was a bustle of activity. 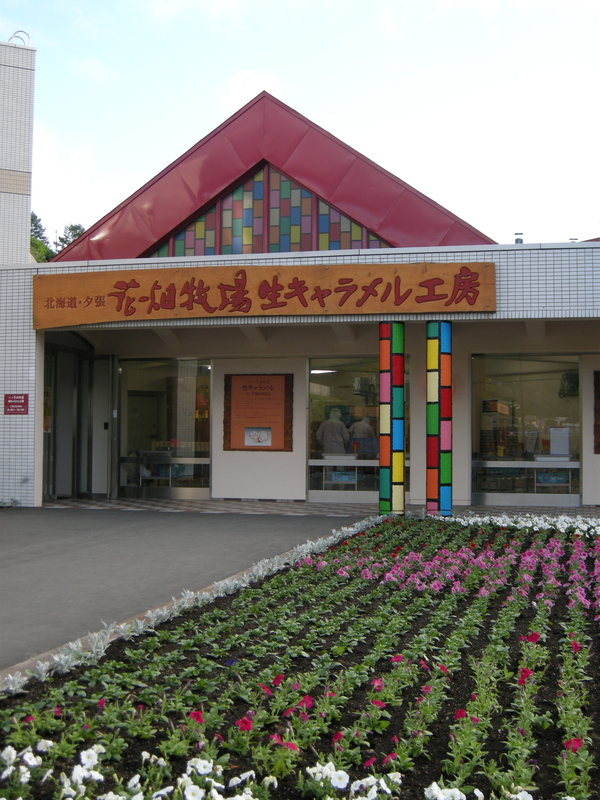 A caramel factory, run by a Hokkaido company called Hanabatake Bokujo (“Flower-field Ranch”), had recently opened up. 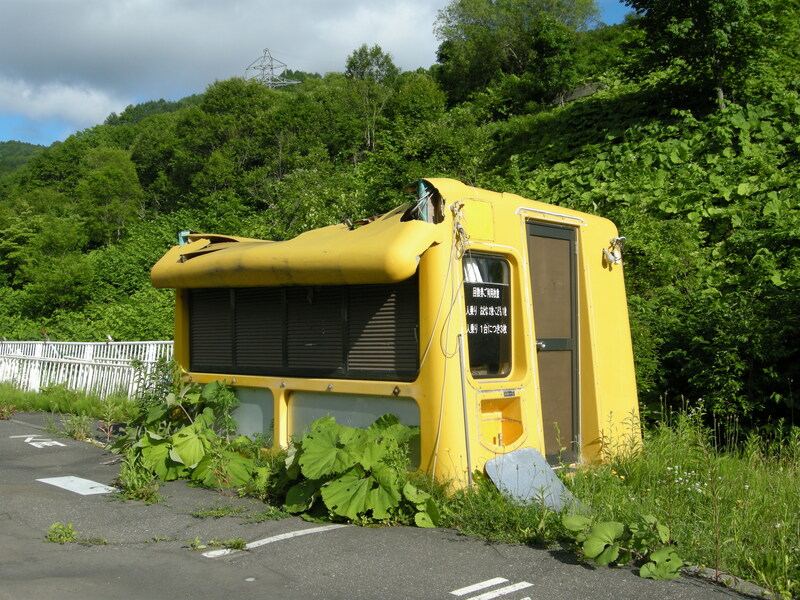 Was this the future for Yubari? Once inside, I was swiftly picking the gravel off my jaw. My first thought, on recollecting my senses, was: “And if you treat them well, they lay two eggs a day”. Oh Yubari, has it really come to this? Looking at these photos now, it’s hard to believe that these were real people: the scenes look for all the world like a mural or a waxworks exhibition. Stripped of animation by the medium of photography, the scenes are also reminiscent of a nineteenth century tableaux vivant, with actors frozen in their poses. 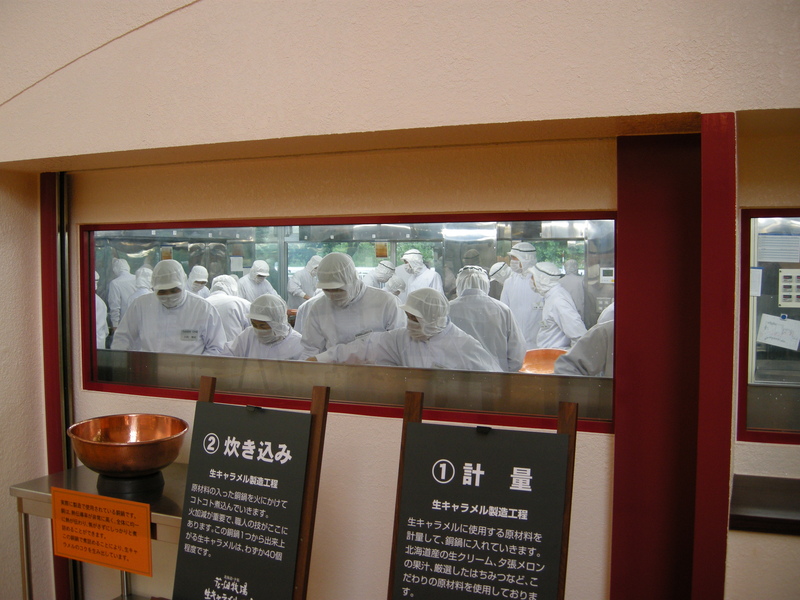 Hanabatake Bokujo proclaims at the top of its homepage that it is a company that brings happiness to everyone: happiness to the people who eat its wares, happiness to the people who make its confections, and happiness to the communities where it sets up shop. I have my doubts. 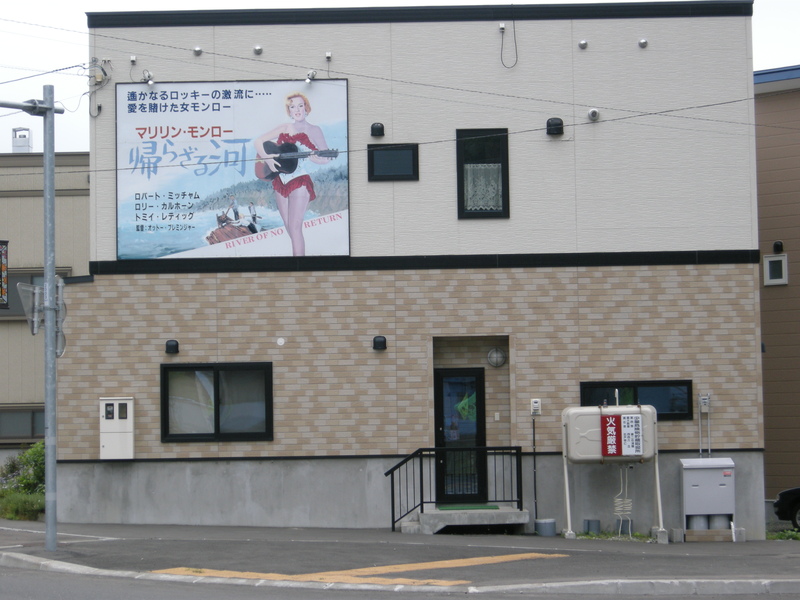 Back in Upper Yubari proper, I was snapping away at some movie posters when I was hailed in impeccable West Coast English by Nao the melon-seller. 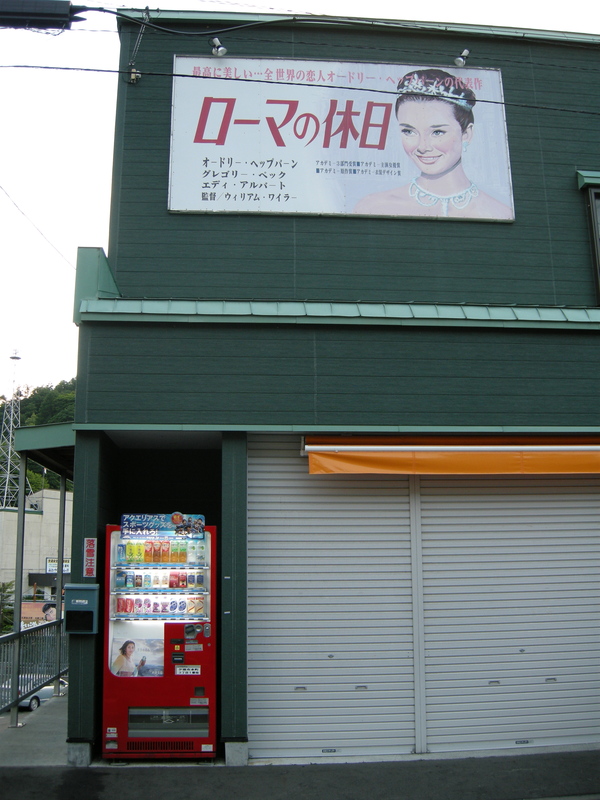 Nao had come back to Yubari after a decade in Hollywood, “another movie city”. We talked first about melons. He revealed that Japan Agriculture, the quasi-collectivist co-operative leviathan that dominates Japanese farming, controls every aspect of melon production in Yubari, down to determining which farmer’s melons go into the celebrated auction for the first melons of the season, in which Sapporo department stores vie to pay thousands of dollars a melon for the honor of hosting them. Why was I not surprised? 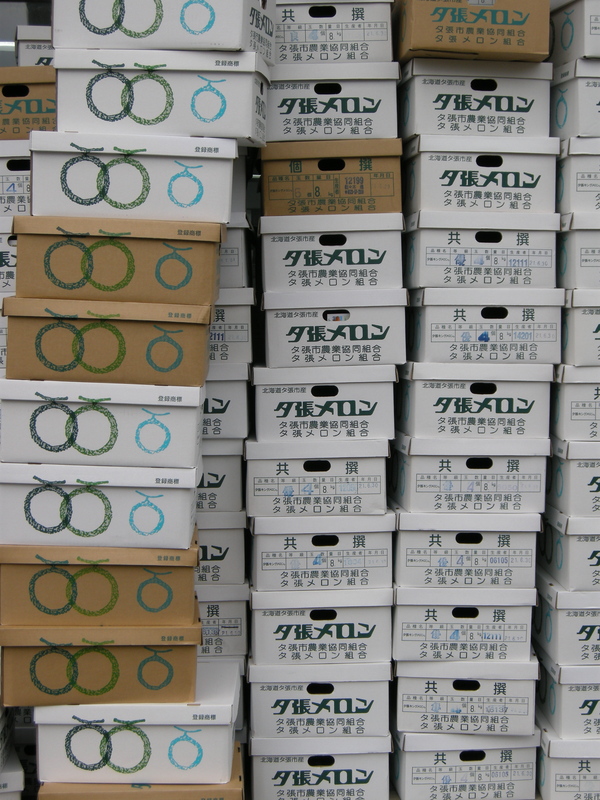 The brown boxes around the side of the store, he explained, were for shipment of humbler melons within the prefecture, the white ones for “export” to the rest of Japan. This was a bit rich, I felt, coming from someone who would later fleece me for Y6,000 ($67.50, GBP40) for a pair of his mid-range melons, but I let it ride. I had to vacate the Hotel Shuparo that evening, as it was full, but the Mount Racey generously agreed to put me up for the Shuparo price. The hotels were bustling with families from the Sinosphere, where a Hokkaido boom is apparently underway—what did they make of Yubari—and teenagers on school trips. After checking in at the Racey (whose idea was that? ), I sallied out onto the utterly deserted main drag in search of food. I had seen a lit red lantern, which in Japan signals a small eatery, earlier that evening. On entry, the charmingly named Sake Doraku (“boozy debauch”) was packed, and moreover packed with youngish people, although it emptied out around nine (well, it was Friday night). I took a set at the counter, staffed by the husband-and-wife owners and a chatty waitress. Next to me sat two men in their early thirties. One was bemoaning to the other about how he’d recently found an out-of-town girlfriend, but couldn’t see the relationship going anywhere, as there was no way she would come and live in Yubari. Poor guy, poor Yubari, I muttered inwardly. Is the stigma of history really that great? So it would seem. The men were loudly invited to talk to me but declined. Instead, the owners, the waitress and I engaged in long rambling conversation about the city, coal, and industrial policy in Japan and the UK. I suggested, perhaps naively, that bankruptcy had not had much of an affect on people’s lives. They demurred but struggled to pin down what had changed. There was much reminiscing about how Upper Yubari was once covered with tanju, the miners’ row houses, and vanished districts such as Fukuzumi, home to 6,000 in 1960 but noone now, and about how the rivers ran black and everything, but everything, was encased with a fine layer of soot. We moved on to melons. The waitress took me aback by declaring that a state of civil war existed between the melon people and the coal people. When I expressed my surprise, she backed down, saying that it was more that the melon people keep themselves to themselves and don’t concern themselves with the problems of the coal people and, by extension, the city. By and by the young men left and one of their seats taken by a man in his fifties, evidently something of a fixture, introduced to me as Yamamoto san. 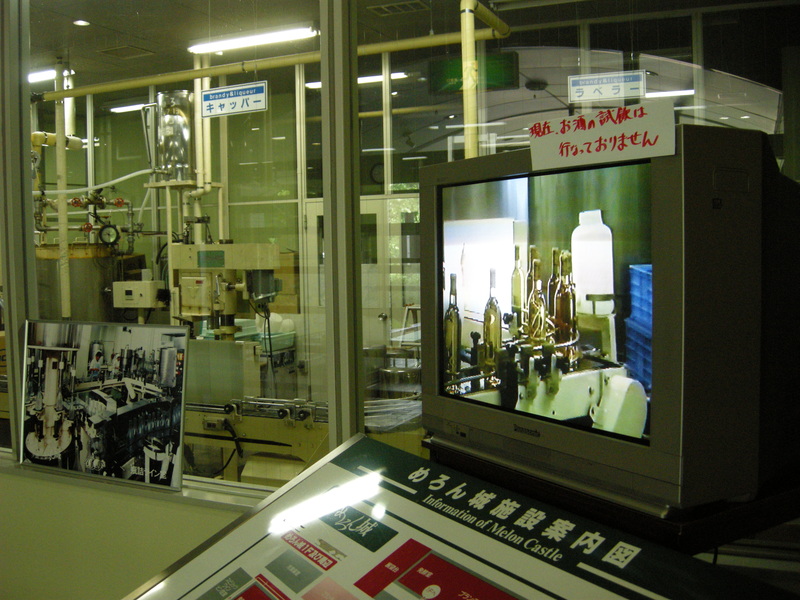 In his youth, Yamamoto san had been a miner at the Mitsubishi Minami Oyubari colliery. On May 17, 1985, his shift had ended just half an hour before the methane gas explosion killed 62 of his fellow miners. 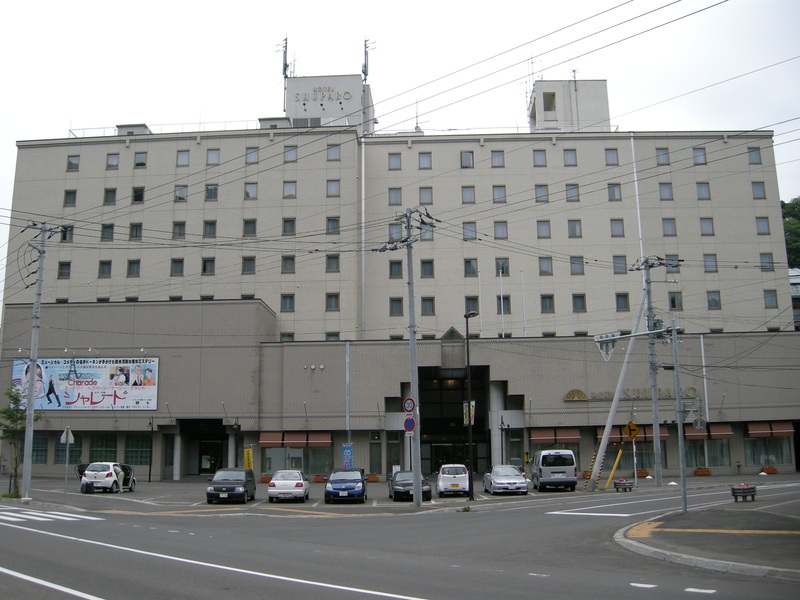 Understandably, he decided that he was finished with mining and Yubari, and moved to Kyushu, at the other end of the country, where he spent the bulk of his working life in the hotels of the spa resort of Beppu. 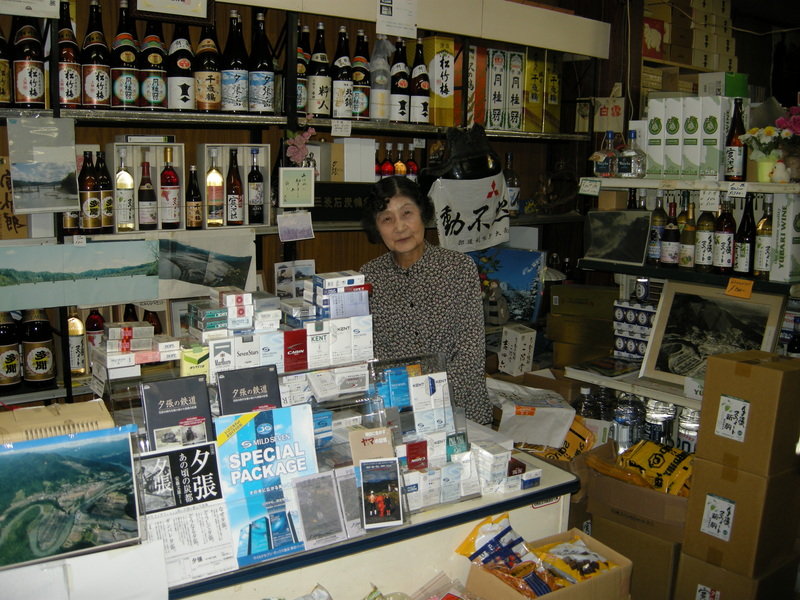 Never married, he had finally returned to Yubari to work as the maitre d’ at the Mount Racey. 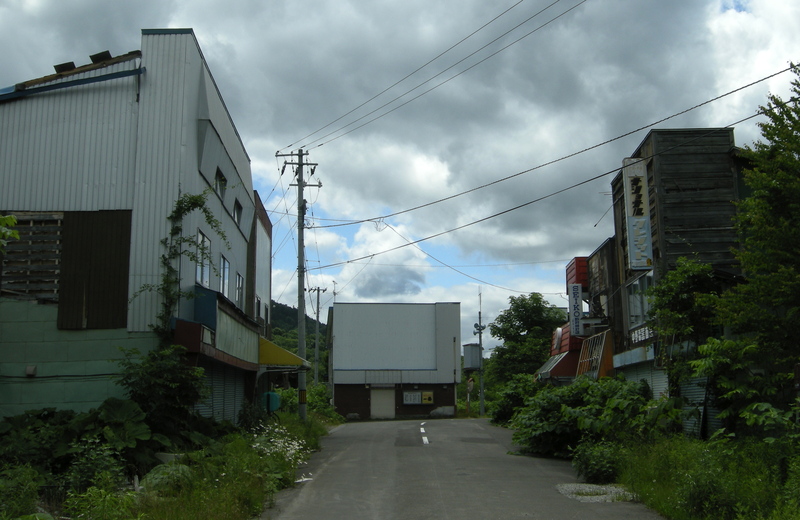 “It’s a sad and lonely old town”, he said of Yubari, and he too exuded the sadness and loneliness of his birthplace. The next morning, I drifted briefly around Honcho again. 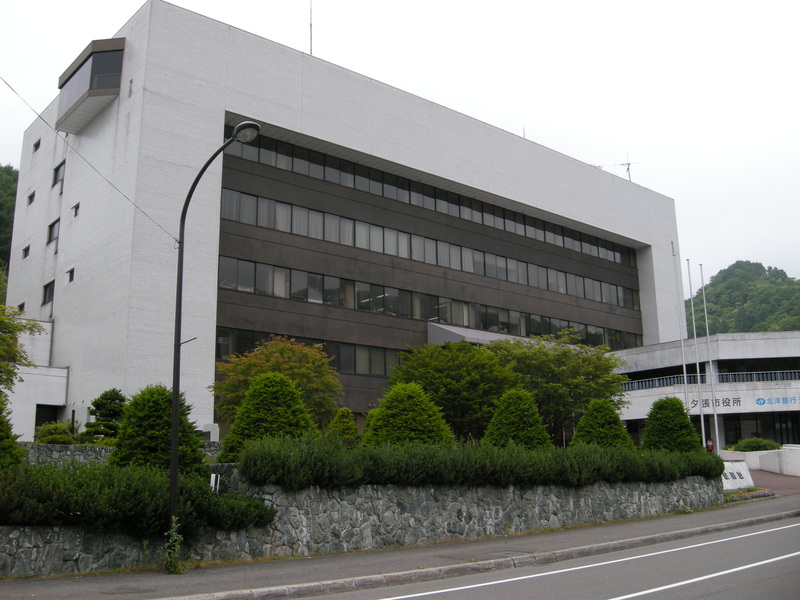 Yubari City Hall was built in the early 1970s, when Yubari still had as many as 70,000 people, and was the setting for much of the drama surrounding its bankruptcy. The most prominent civic relic of a different time, it is far too large for the city’s needs these days, but staying on must be the cheaper alternative. Hard by city hall was the job center, like all job centers in Japan called “Hello Work”, followed by the name of the place. Surely it should have been punctuated differently: Hello??? Work?!? Yubari?!?!? Hello Work was closed but helpfully the jobs on offer—or at least a selection—were posted outside the entrance. 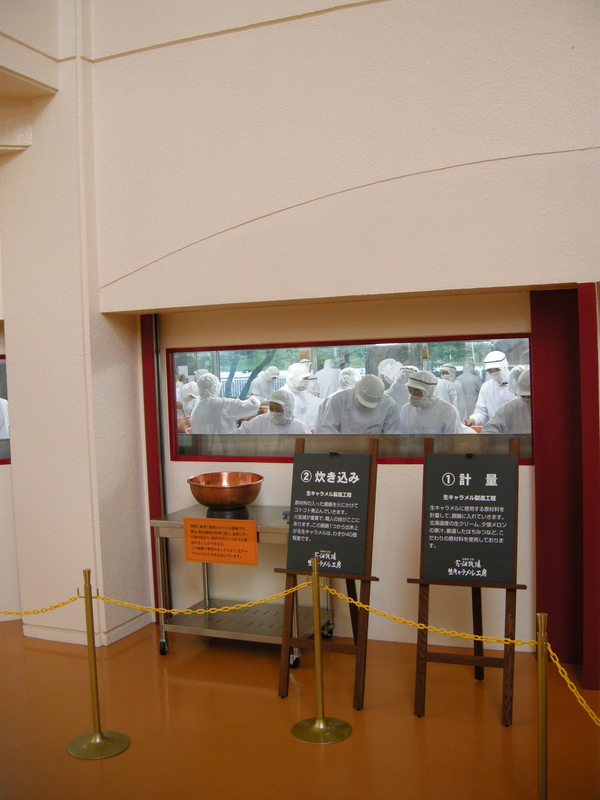 There were 30 jobs at Hanabatake Bokujo, selling caramel at a shop next to the plant due to open imminently, offering Y850/hr ($9.50, GBP5.80). The contracts lasted just a few months, until the autumnal end of the tourist season, and it was uncertain if they would be renewed. 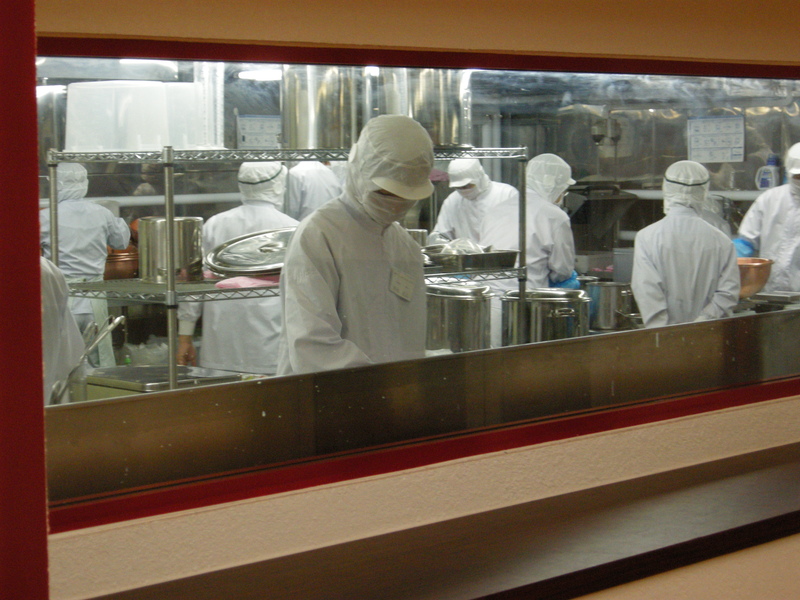 There were two jobs cutting up ingredients and dishwashing in Wakana, paying Y680/hr ($7.60, GBP4.60). There were two jobs in civil engineering requiring experience in Nanba paying Y8,000/day ($90, GBP55). There was one job in construction machinery sales in Minami Shimizusawa paying Y200,000/month ($2,250, GBP1,400). 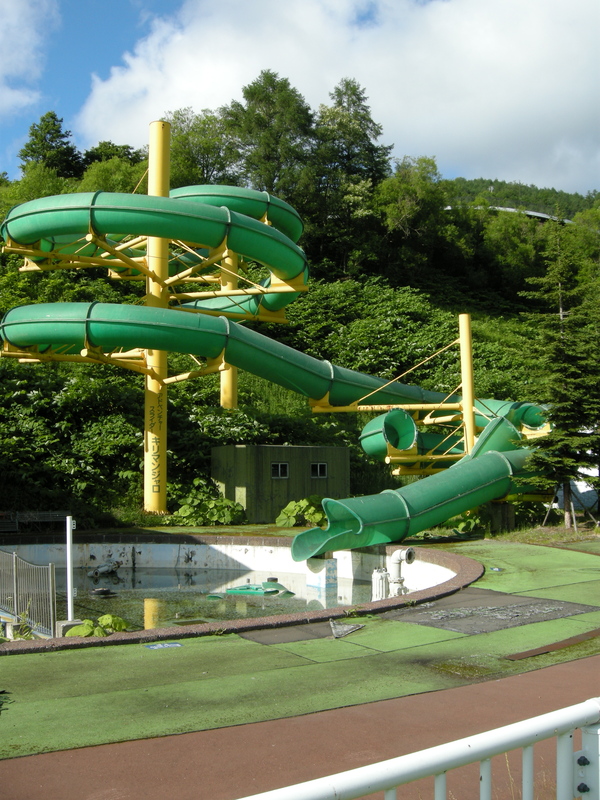 The cost of living in Yubari is low, but even so, these are not the sort of wages on which you can do much more than eat and pay your utility bills, let alone have a vacation, say, or raise a family. 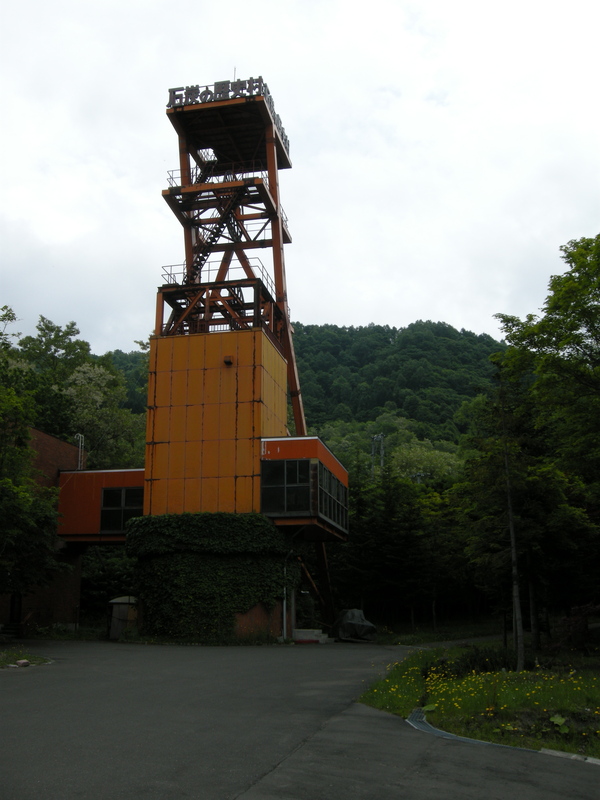 An exhibit at the Coal Mine Museum records the monthly salary of a miner in 1977 as Y150,000—and Japan has by no means been free of inflation since—and by the 1980s, Suzanne Culter, in Managing Decline: Japan’s Coal Industry Restructuring and Community Response, a sociological study largely set in Yubari, reports that some of the last surviving miners were earning close to Y500,000 a month. 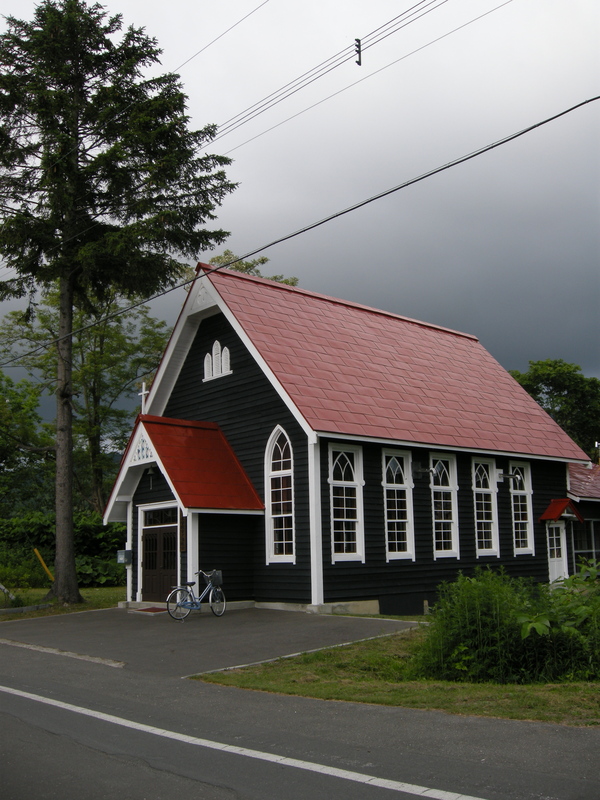 I returned to the Coal History Village, this time from the orthodox approach instead of sneaking in from the rear, and paid my Y1,900 admission charge, to be greeted by Yu-chan. 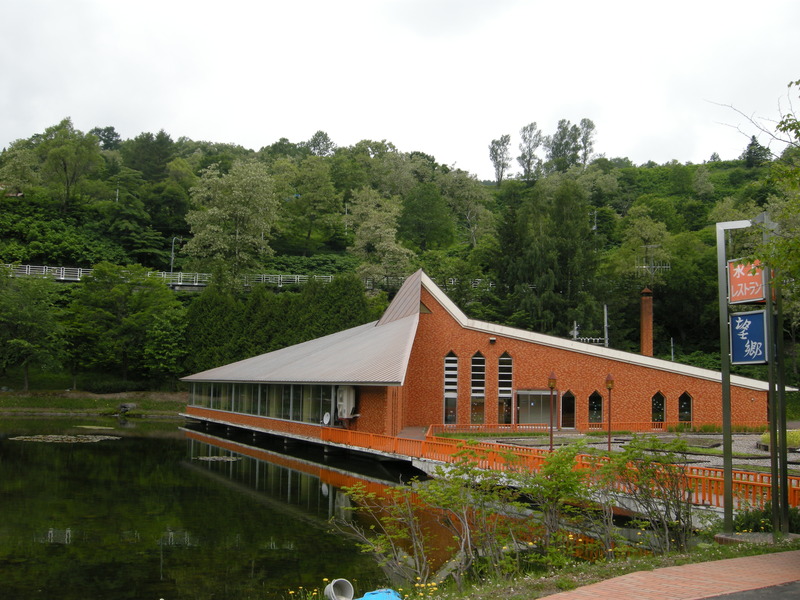 There were only three facilities left open: the Coal History Museum, the Coal Culture Hall, and the Yubari Hall of Fossils. 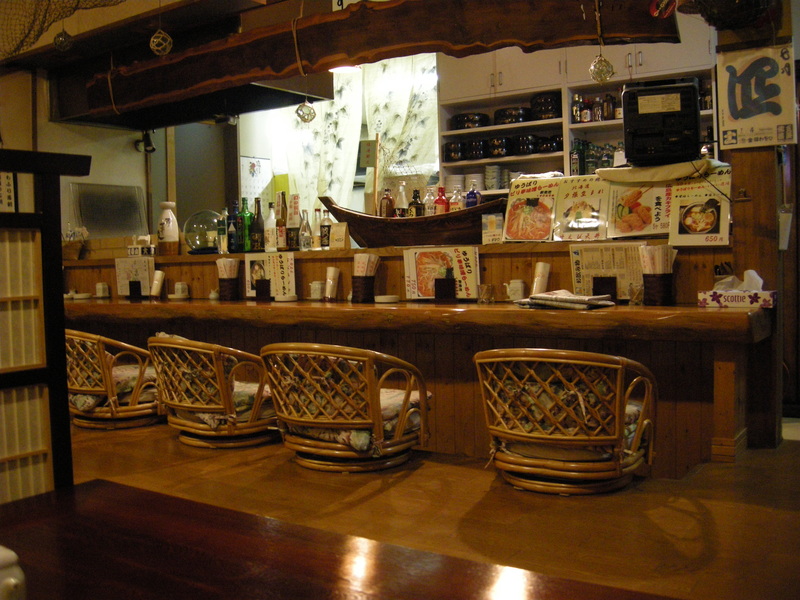 Restaurant Bokyo was one of the first of the village’s operations to start up. 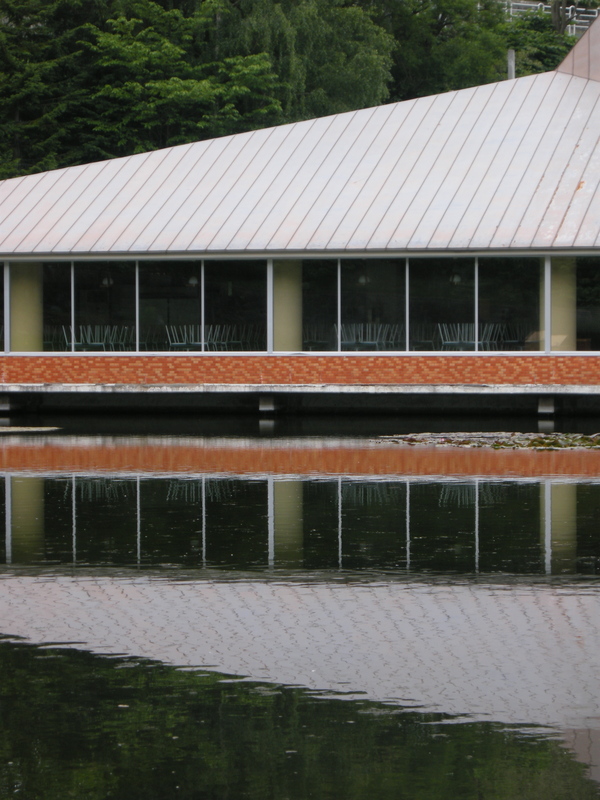 I was fast developing a very soft spot for the Hokkaido architectural vernacular of the late 1970s. Such a shame that, despite the pincushions of neatly upstacked chairs waiting expectantly, noone will ever dine there again. Finally I reached the faux mine of the Coal Mine Museum. Steeped in the past of Yubari as I was rapidly becoming, the museum was fascinating; the largely un-unionized and pacific fights in the 1980s by the miners to save the Hokutan New Mine and then the Minami Oyubari Mine after their explosions made their owners want to wash their coal-dusted hands of them, as recounted by photos and newspaper articles, were gut-wrenching. Yubari forced me ask myself repeatedly why I was so interested in Japan’s coal-mining past when I had had no particular interest and took no particular side as a teenager in the epic Coal Miners’ Strike of 1984-1985 in the UK. I think the answers are twofold: first, this is a “what if?” question, and not entirely helpful. What if I had been 40 in 1984 and not a teen? What if, instead of having spent most of my adult life in Japan (gulp), I had spent it in the UK? I might have developed a fascination with the pit communities of Yorkshire or the Rhondda, it’s not completely improbable. Second, it’s the sheer violence and fleetingness of what Yubari went through that intrigues me—it flourished its first half-century and then collapsed into almost nothing in its second. The same cannot really be said for coalmining towns in the UK or elsewhere in the developed world. 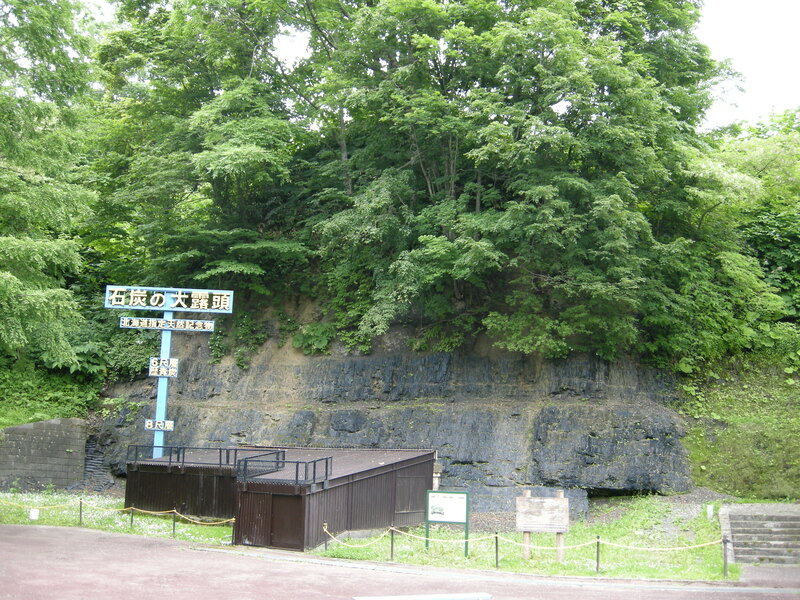 Adjacent to the museum was the very outcrop of coal whose discovery in 1888 led to the start of mining in Yubari four years later. 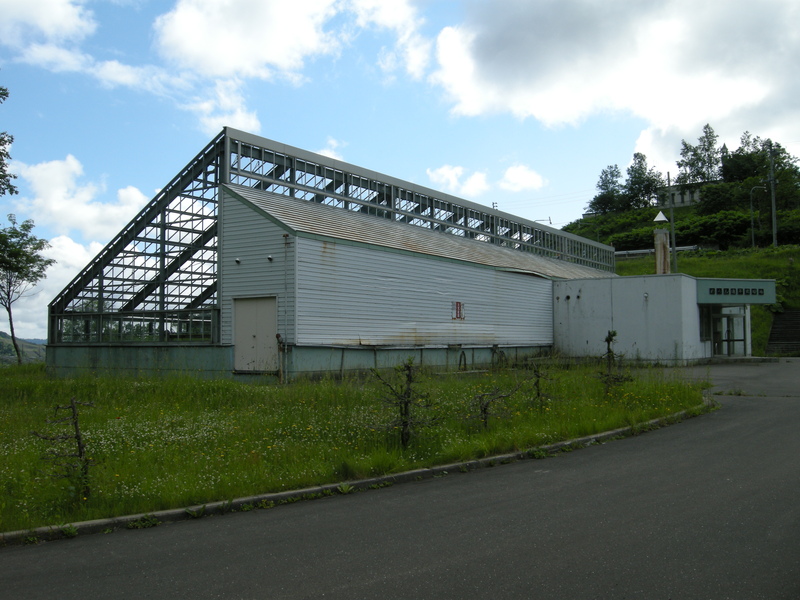 I surveyed the verdant valley hillsides with renewed astonishment that they were once spirited pit communities and made my way up to one hillside district, Shako, in search of vestiges of the past, in the course of which I stumbled across the creepiest of all Yubari’s one-time tourist attractions. The shrine, if once it had a name, was now anonymous; there was no obvious means of unearthing any background. All I could tell was that some of the lanterns dated to the early 1990s. Then much later I read this passage in Suzanne Culter’s book and it all clicked. The mayor and his city administration turned out one new plan after another. If a project failed, they tore it down and began again. 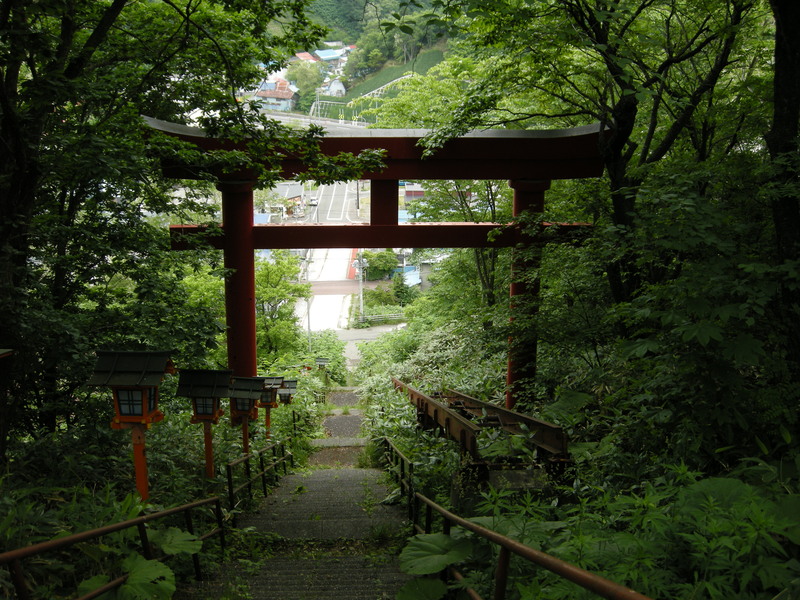 When tourists would not climb the steep staircase to pay their respects to the giant Kannon (goddess of mercy) statue perched at the top of the Honcho mountain, an elevator car was installed. 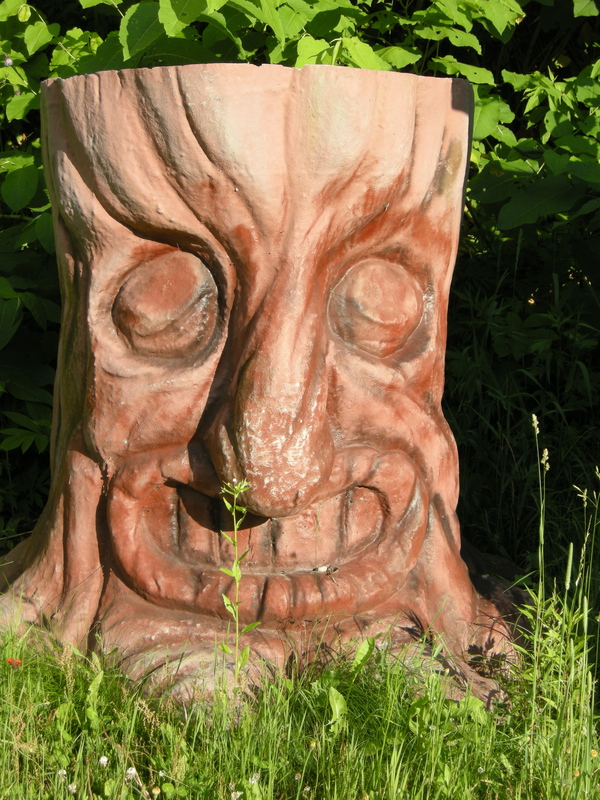 When the added technology did nothing to improve attendance, the statue was sold and hauled away, and new plans were begun for the vacant land. The spookiness of the site was amplified by its surroundings, with long relinquished houses reverting to woodland. I ambled down the main valley again, exploring the byways. 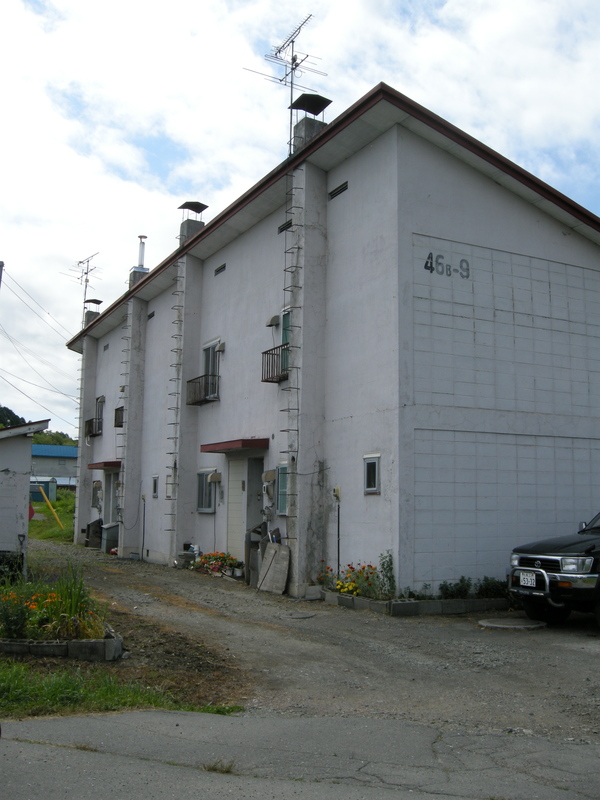 Many mine managers made their homes in Shikanotani; even today that legacy is apparent, as there are more newish detached houses than anywhere else in Yubari. Its village green and church gave it an almost English feel. The district was also home to the Shikanotani Club, built by Hokutan in 1913 for mine executives and visiting dignitaries, including the Emperor, who stayed in 1954. 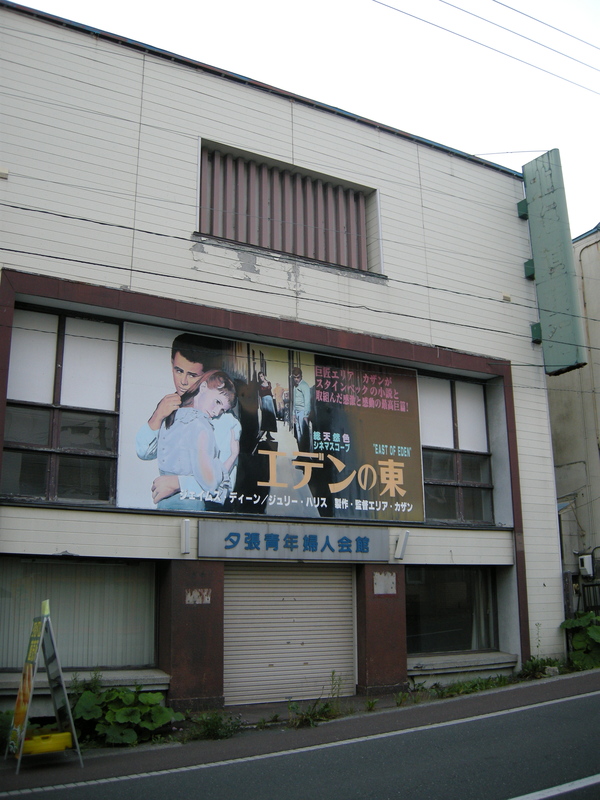 It closed in 1982 and was sold to the city, ultimately reopening as a memorial hall, Rokumeikan, in 1994 but closing following bankruptcy in 2008. It was impossible to get any closer but there is an exhaustive slideshow of the remarkable interior here. 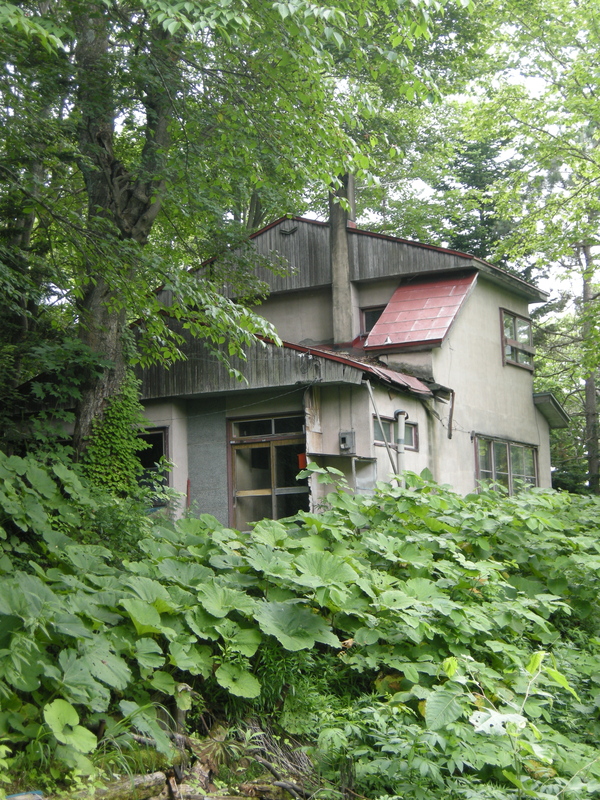 Shikanotani was not entirely bereft of ruins: this is the former Hokutan Coal Analysis Office. I wended my way back up to the hotel. Not wanting to dine at the same place twice, I was rapidly running out of restaurant options. 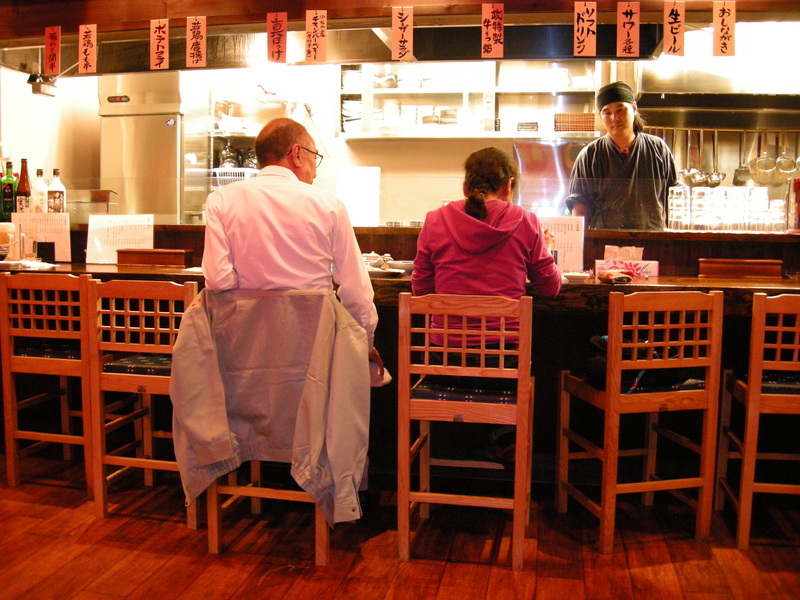 I found Fukukaisen, a sushi and robatayaki (tableside grill) joint in Honcho, but things got off on the wrong foot with the proprietors when I blundered in without taking off my shoes, a sophomore slip. I was, and remained, the only customer (well, it was Saturday night). 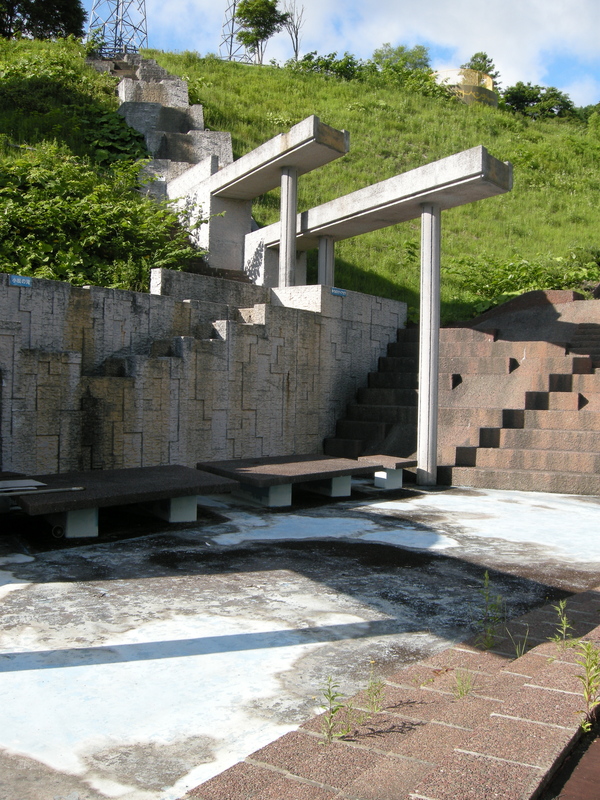 I had one last stop the next morning before leaving Yubari: The Yellow Handkerchief of Happiness Memorial Plaza. The Yellow Handkerchief of Happiness is a gem of a 1977 Ken Takakura road movie based on a short story by US journalist Pete Hamill, the story also regrettably being the inspiration for the 1973 #1 hit by Dawn featuring Tony Orlando, Tie a Yellow Ribbon Round the Ole Oak Tree. Directed by Yoji Yamada, veteran of the Tora-san movie franchise we encountered earlier and regarded by some critics as the pinnacle of his career, the film was garlanded with eight prizes at Japan’s first ever Academy Awards, including best picture, best director, and best actor, and has recently been remade in the US starring William Hurt. The plot is straightforward: a young couple who have just met the fall in with a man, Ken Takakura, just out of jail for a street brawl that led to the death of a minor yakuza thug, on his way back to Yubari to see if his young wife is still single and waiting for him. If you know the song, you know how the movie ends; the magic comes from Ken Takakura’s inner battles between swagger and frailty. This is the set for the climax of the movie, a row of miners’ cottages, preserved in aspic. 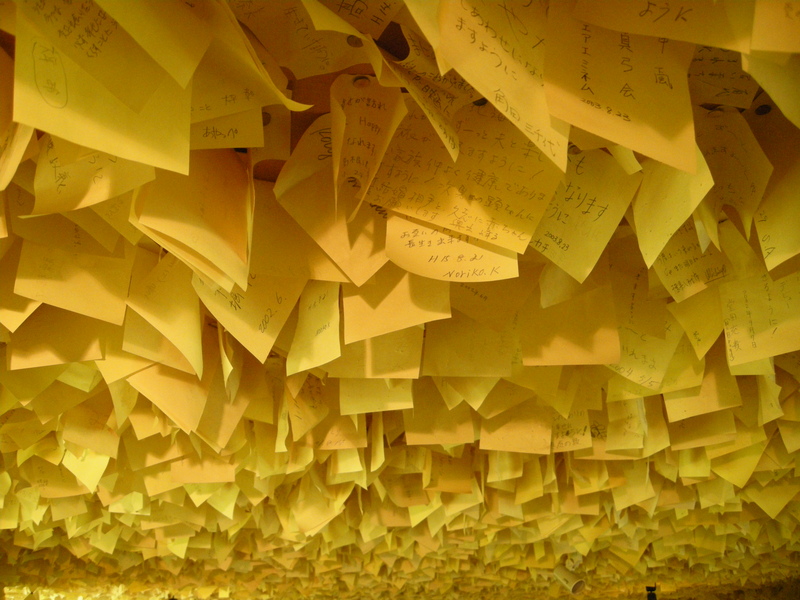 Inside one of the two Mazdas used in the film is surrounded by countless thousands of yellow Post-it notes covering every available surface like a swarm butterflies, on which the hopes and dreams of visitors have been biro scrawled, in a modern-day variant of the ema votive tablets found at conventional shrines. Turning east on Rte 274, I paused to pick up some melon-laced morsels for my office colleagues and then again, one last time, at the city limits. 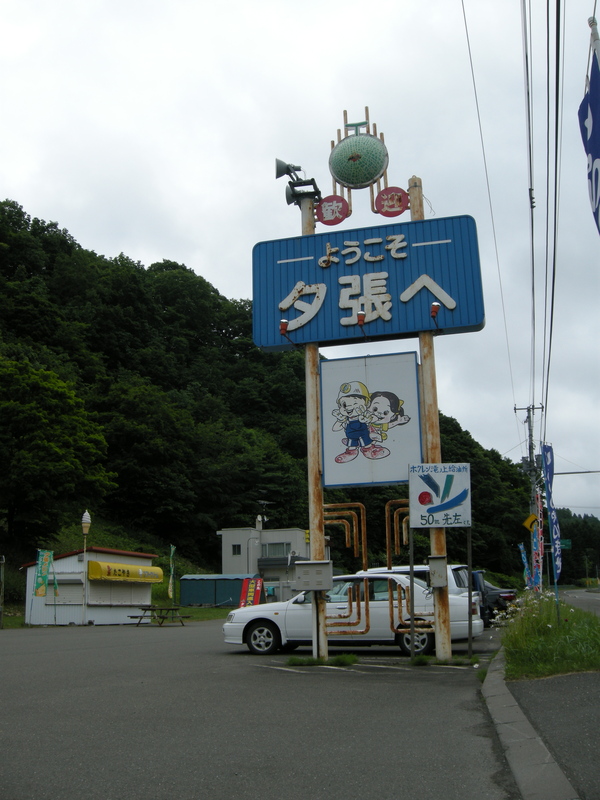 Let’s meet again in Yubari, the sign suggests. Oh yes, Yubari, let’s. Know what I didn’t see? That’s – in part – because almost all the families with kids have shipped out. Thank you for ‘seeing’ on our behalf. Failure, death and decay are the great taboos we seldom face. It also puts a damper on the myth that hard work is always rewarded. I am sad that we – and the ancient culture of Japan – do not look after the people and things left behind in the wake of progress. Thank you Metafilter for the nudge. Thanks for writing this! 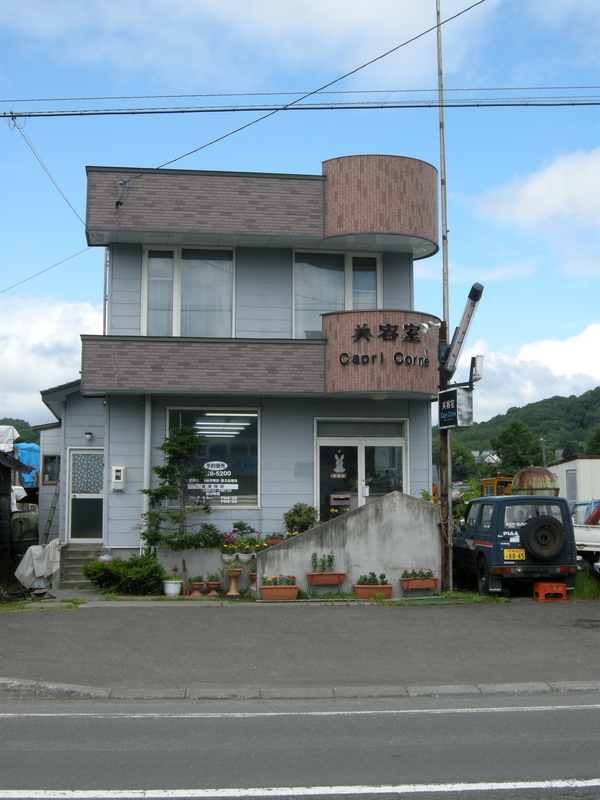 I lived in Iwamizawa for two years, and drove past Yubari all the time, never knowing all this stuff was there. Amazing. I often think that Youngstown, Ohio will suffer the same fate if the General Motors assembly plant ever closes. Having lived here for a number of years, I have seen the decay which came from the collapse of the steel industry here. Even though large parts have or are being cleaned up, the crime and empty store fronts tell a different story. It still does not even come close to Yubari. Thanks for your stories. I enjoyed your writing and the pictures of Yubari. It brings back many memories. Thanks for quoting me and giving my book some credit. It does sadden me to see the further decline, although I am not too surprised. 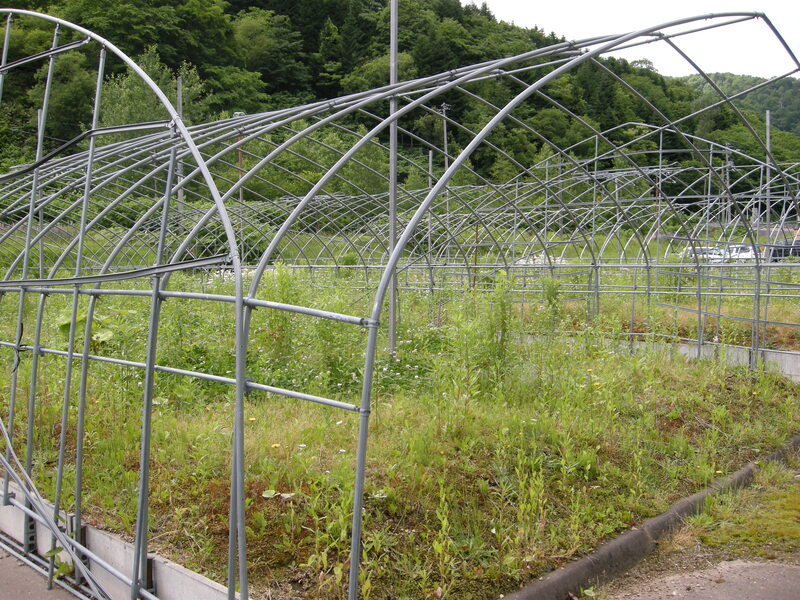 However, the people of Yubari are very strong and will keep trying. Is that really the origin of the word honcho? Remarkable if so. Googling would suggest other possibilites but i would certianly defer to your knowledge. Like many others i have just come across your very fine blog. Wonderful work, thanks for your insight and elegant prose. Now you might be right. I had it in my head from what I recalled as a reputable source that “honcho” came from Yokohama’s Honcho-dori (“town-center street””). 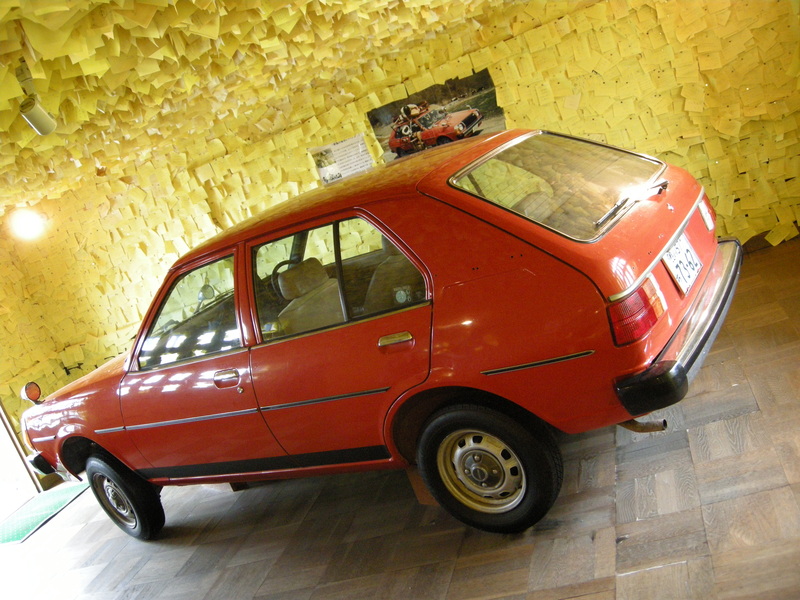 The sentence as I wrote it was deliberately vague – there are honchos all across Japan. Now it seems that the dictionaries are united in decreeing that it comes from “hancho”, meaning team or squad leader, which I suppose is, on balance, more plausible. Thank you for the kind words, anyway. You may be getting things confused. The English (American?) expression “honky dory” comes from “honcho-dori,” but Google seems to suggest that “honcho” is derived from “hancho.” Regards from southern Hokkaido. Yes, someone has pointed that out before, thank you. Will emend one of these days. Am I missing a joke, or is the link for “It was impossible to get any closer but there is an exhaustive slideshow of the remarkable interior here” really supposed to point to http://en.wikipedia.org/wiki/Otoko_wa_Tsurai_yo? No, that’s no joke, either my mistake or a dead link that defaulted to that Wikipage (???). You have to admire a certain indomitable vigour at work here. 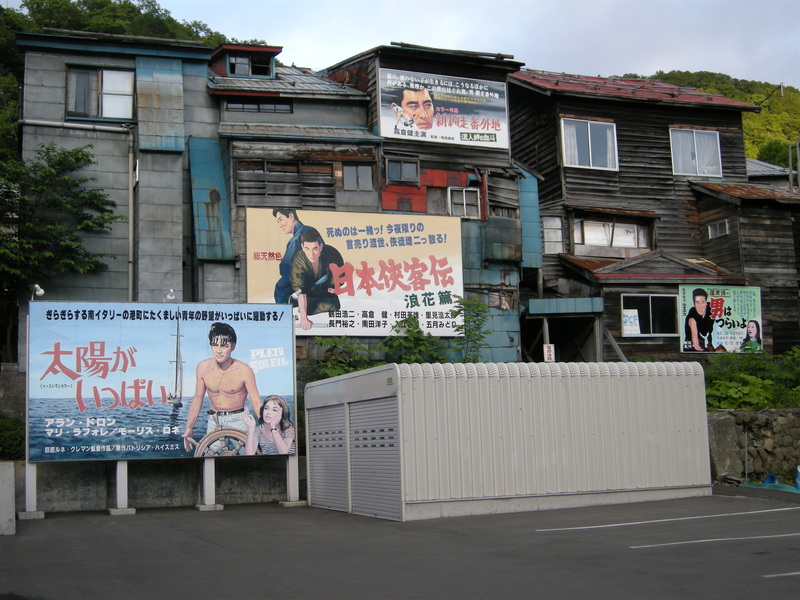 I saw a doco that mentioned Yubari as the epicentre of the decline hitting rural Japan, and didn’t think for a second that someone would have taken the time to chronicle the decay as well as this. Amazing, and sad. Next time I head up to Hokkaido I will try and stop by for a visit, my wife will wonder what I am up to, but I always enjoy attaching some reality to things that I have seen in passing – Chernobyl, Northern Iceland, the Sahara, Mustagh Ata in the far west of China, all places I have seen in pictures, all were so much more vivid when I actually went and saw them for myself. I have no doubt Yubari would be one of those experiences. I found this nice article about Yubari because I was looking for the reason why a Yubari melon is so expansive. I came from a country where water melon is so dirt cheap, amongst all fruits. 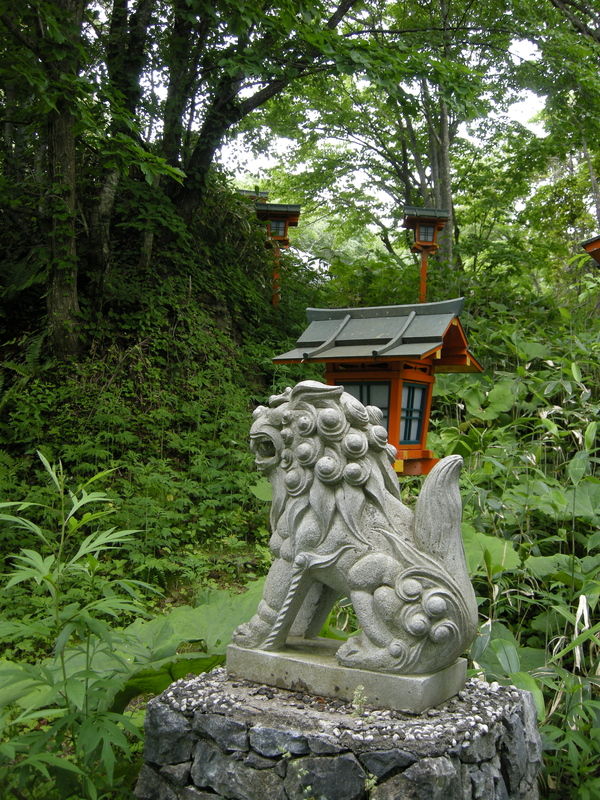 Recently, I visited Hokaido i.e. Furano/Biei and the surrounding. I may have passed Yubari without realizing it. 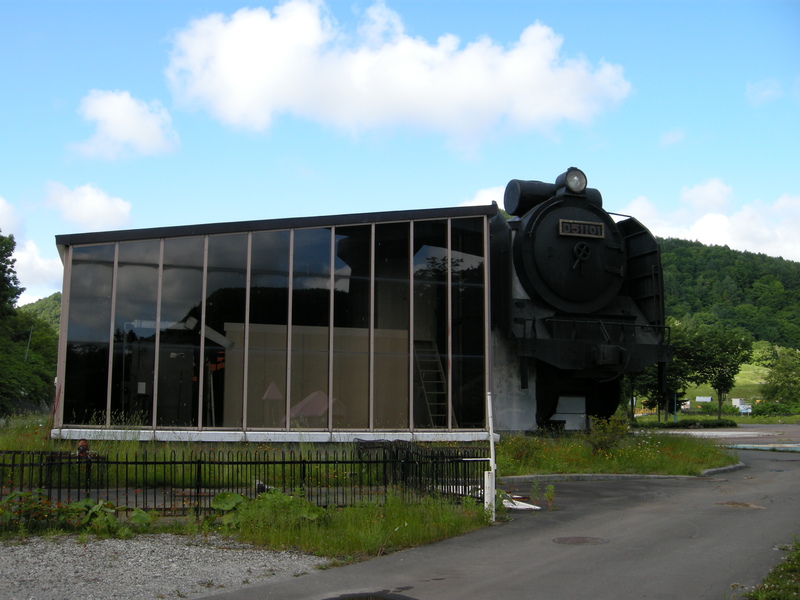 Next time, when I am visiting Hokaido, I will definitely pass by Yubari to see some of the interesting places mentioned in this article. I will look for the old lady. 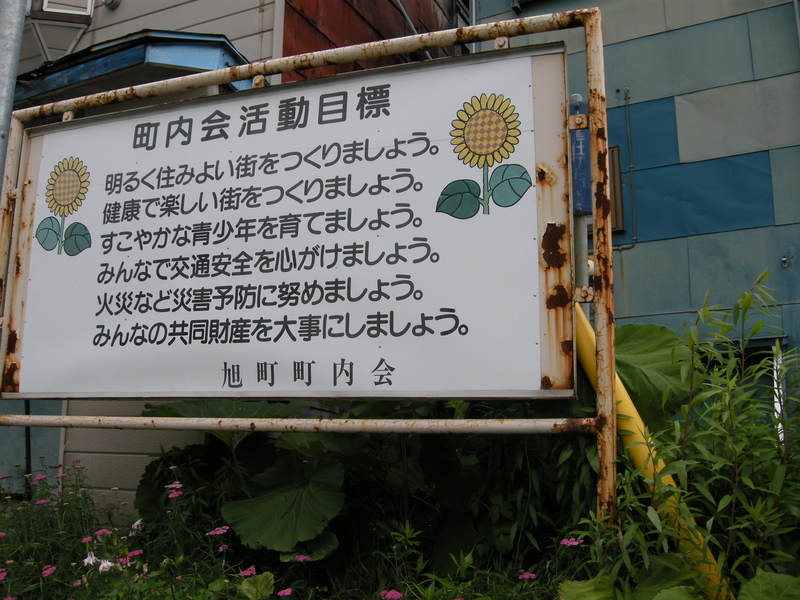 Anyway, my 5 sen worth of suggestion, is for Yubari people to plant more melons. They (may be ex-miners) do not need to plant the top breed melon, just any melon, which poor travelers like me can afford. We like melon, but cannot afford the expensive variety. 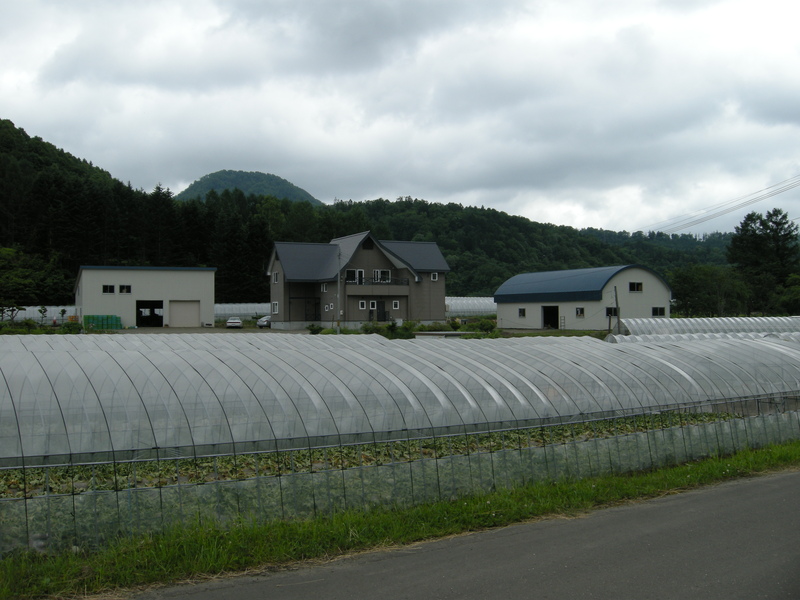 Let the expensive variety melon farmers keep their specialty and niche, but the other Yubari people can also grow other kind of melons to attract a different market. Why lament on the past glory, move on to a brighter future and hopefully, Yubari will recover from this misfortune. Sorry to tell you that hairdressers are often fronts for prostitution. Not in Yubari, they ain’t! Nice article – I lived in Mikasa for 5 years (am currently living in Sapporo) so the photos really bring me back. The summers out in the old mining districts are beautiful in their way and I still remember the region fondly, though having a steady income and the knowledge that I could leave at any time definitely colored my perspective I think. But the snow. Ugh. Am also curious if the Hanabatake Bokujo shop is still running. Thank you for article. 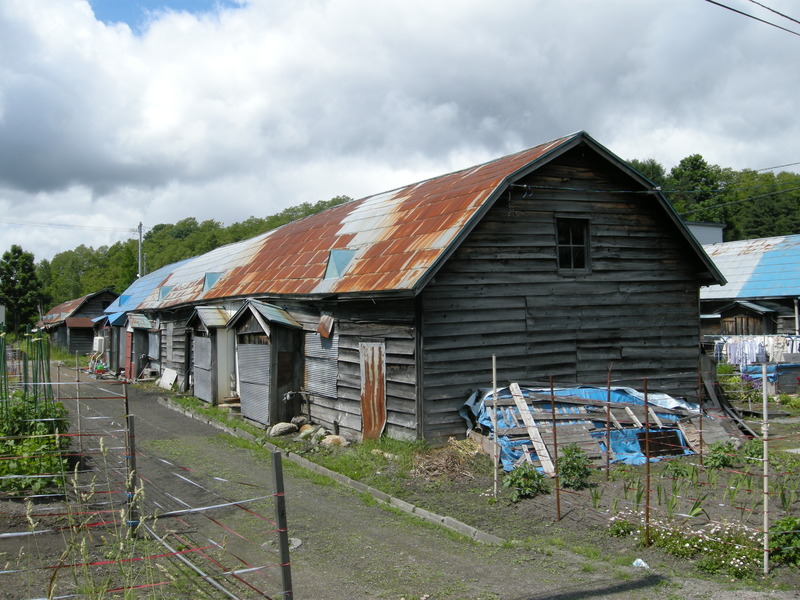 Think you must visit Yubari again. Can not say that there is great changes here, but businessman from China bought Hotel Mount Racey, Shuparo hotel and several properties.